The parachute tower as an amusement ride dates back to the 1930’s when an observation tower at Chicago’s Riverview Park was converted into a parachute ride and wowed the crowds. 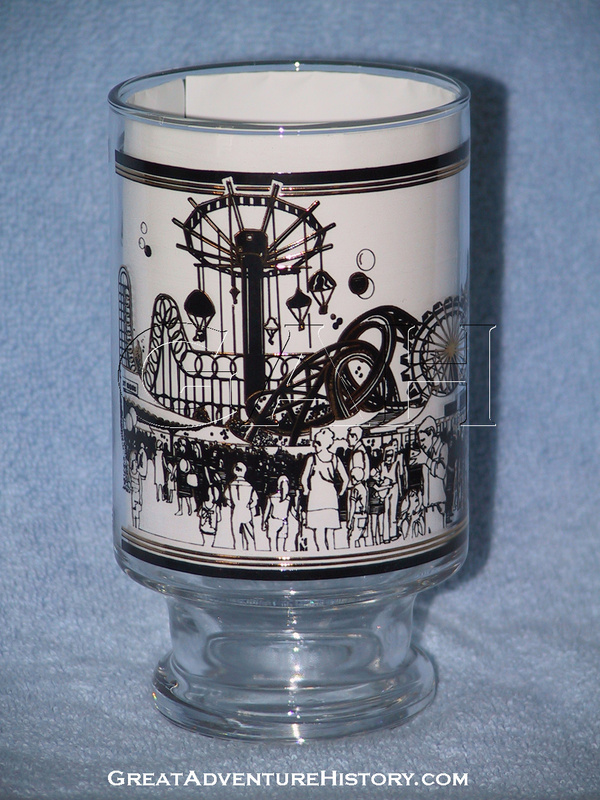 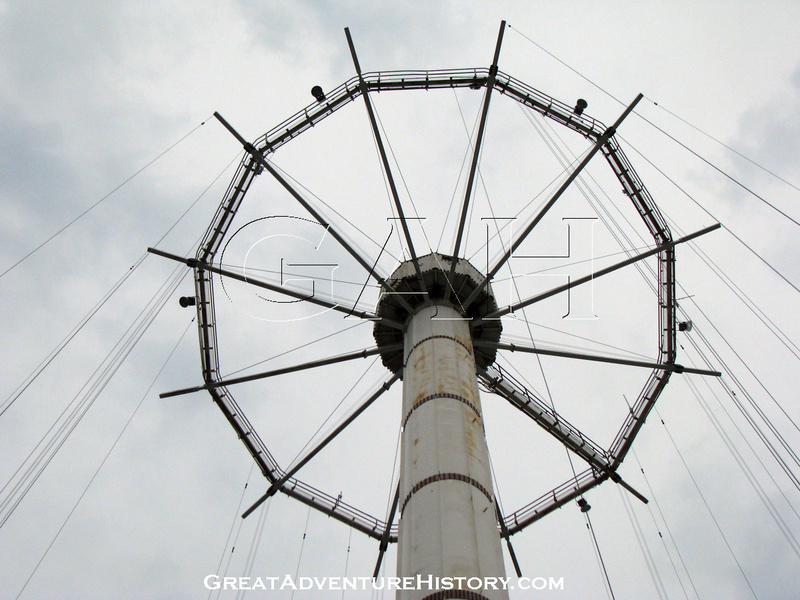 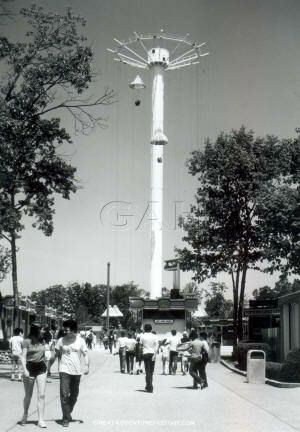 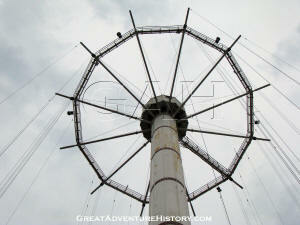 For the 1939-1940 New York World Fair a 262 foot tall tower debuted to huge crowds of people. 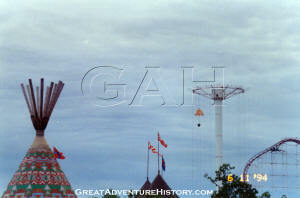 After the close of the World’s Fair in 1940, the popular ride was removed from Flushing Meadows and rebuilt on the boardwalk at Coney Island where it operated until 1968 and still stands today. 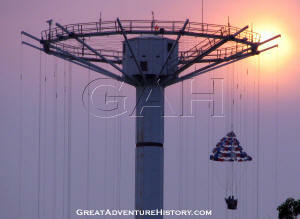 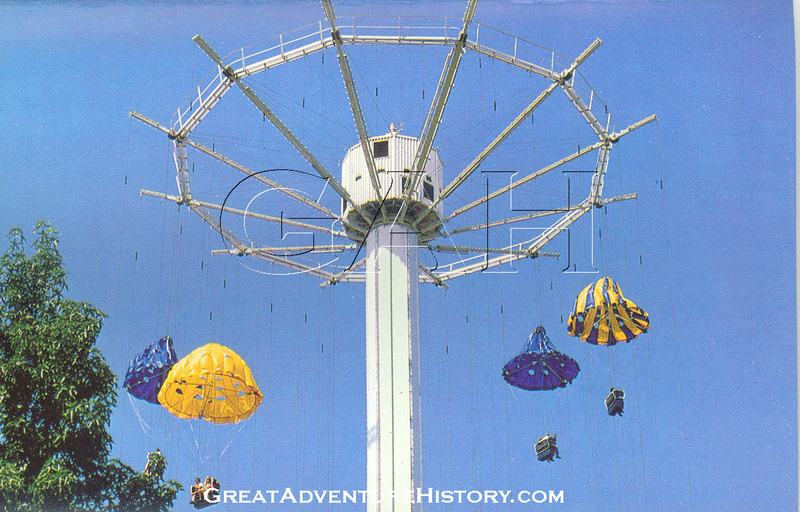 The ride was an adaptation of the towers used by the U.S. military for actual parachute testing and training, and the rider’s descent was actually controlled by the parachute attached to the seats. 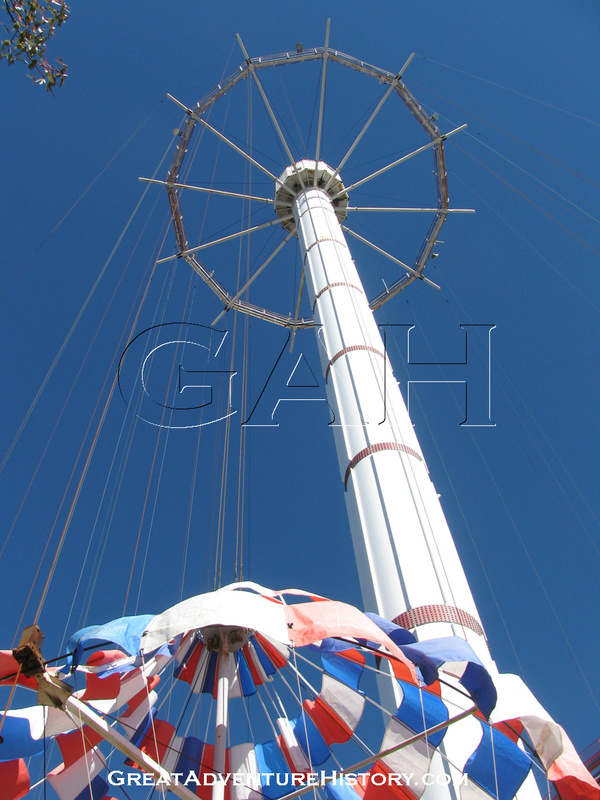 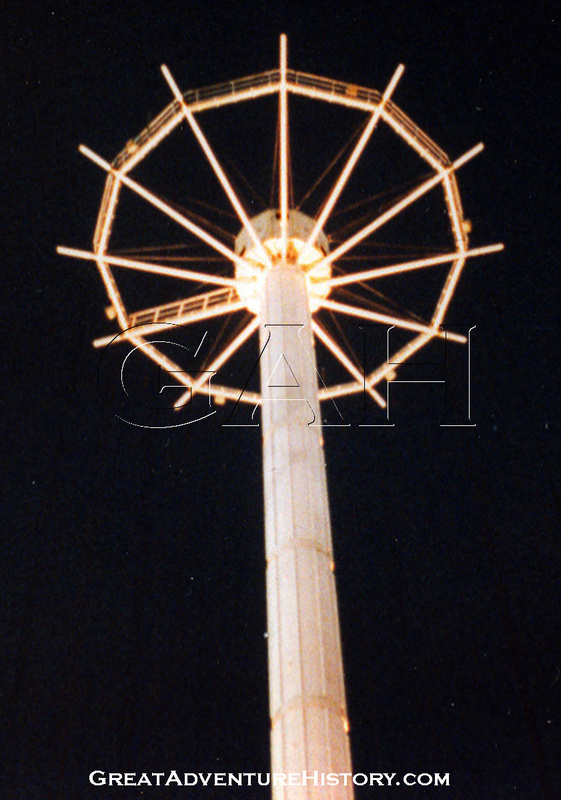 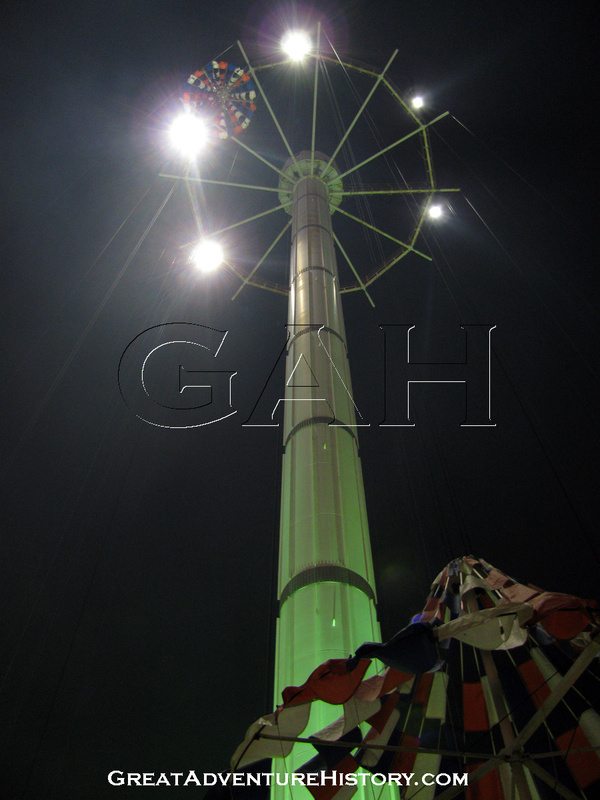 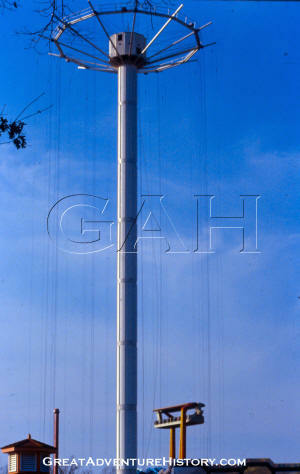 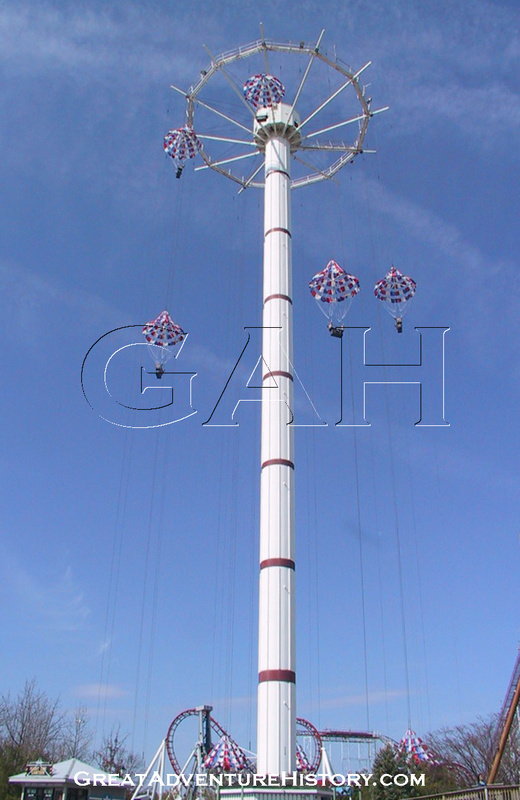 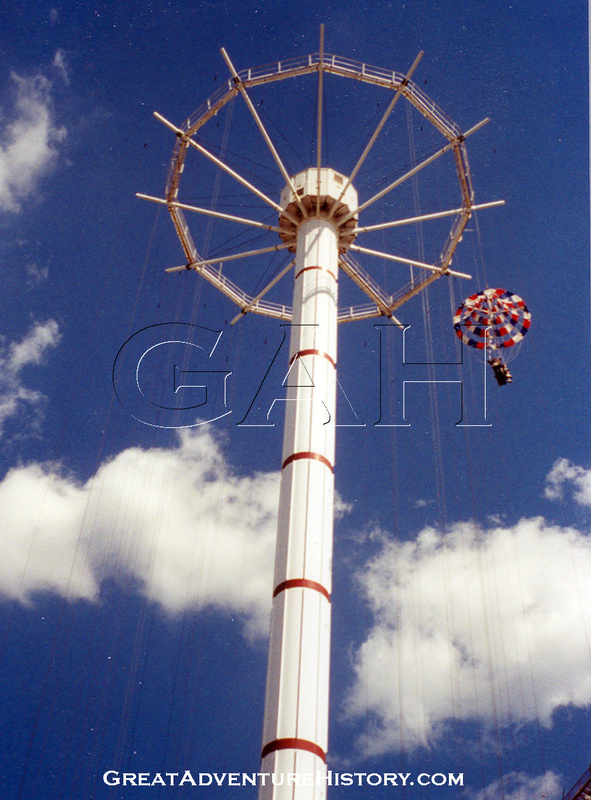 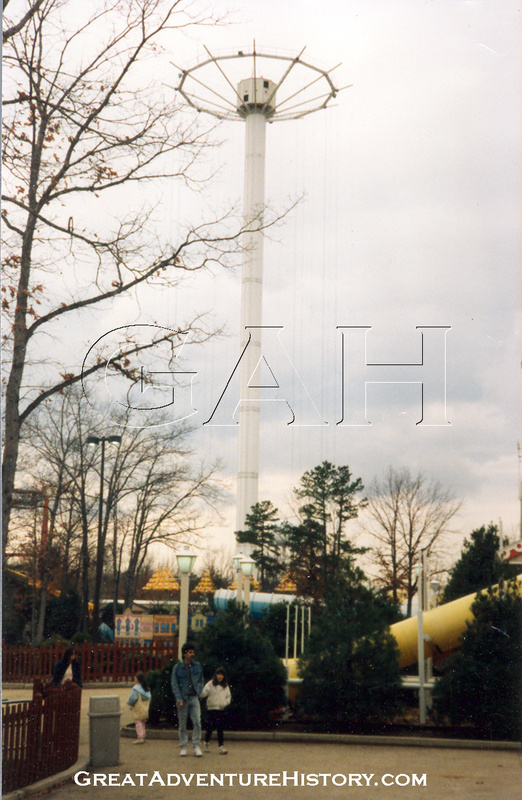 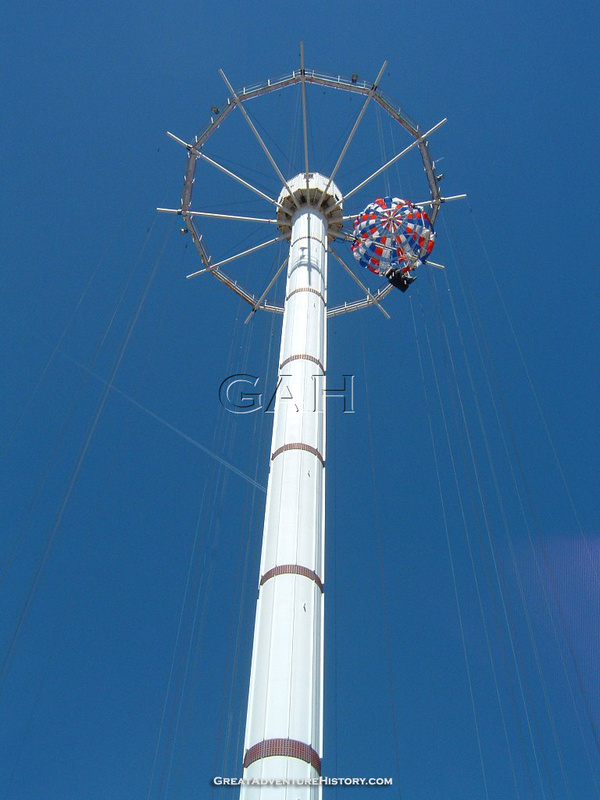 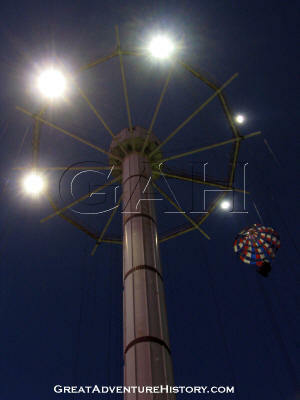 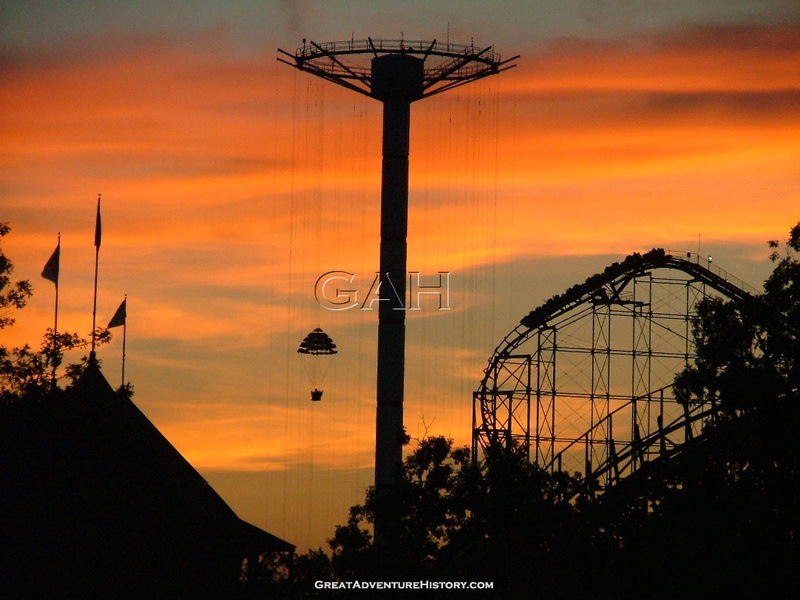 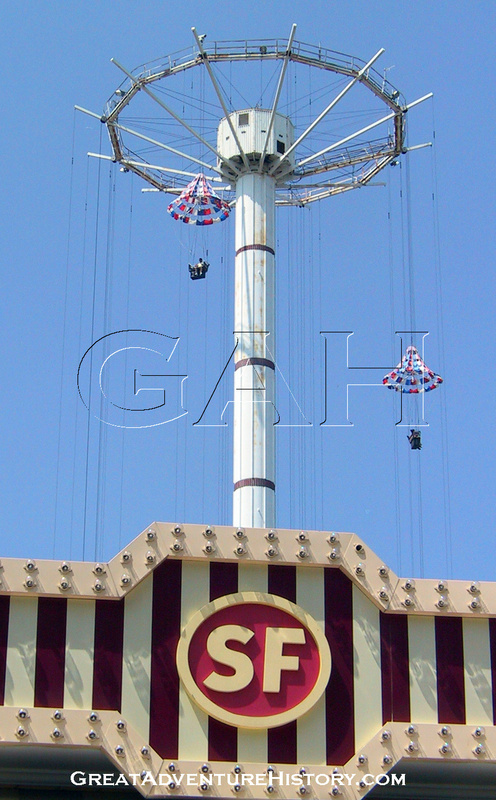 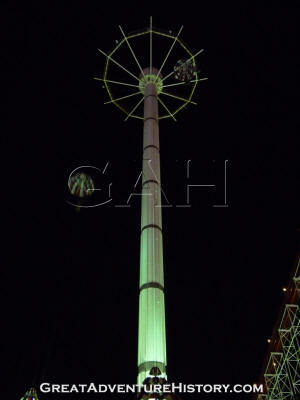 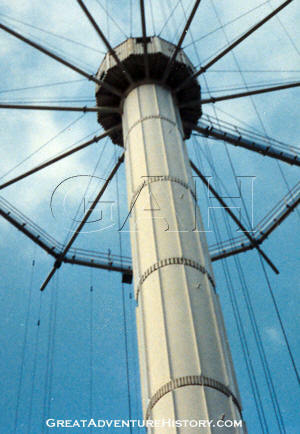 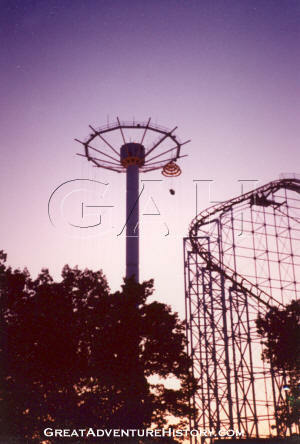 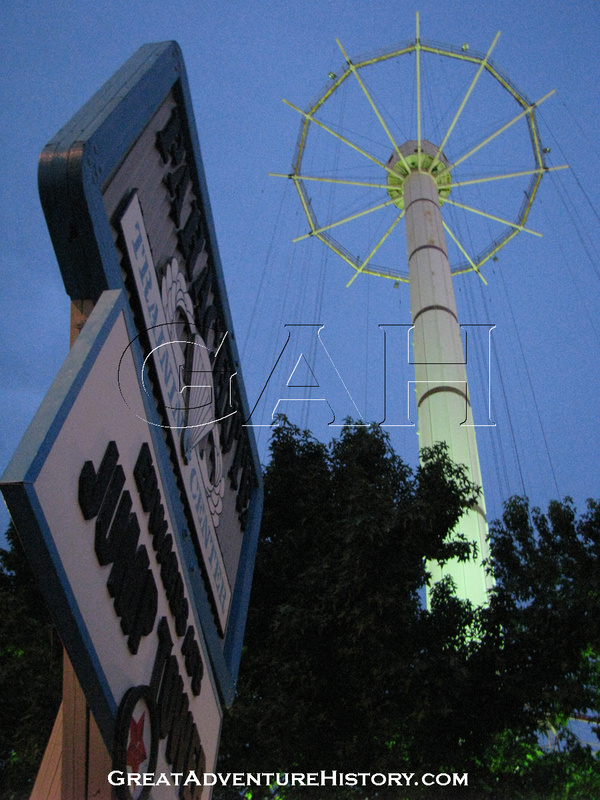 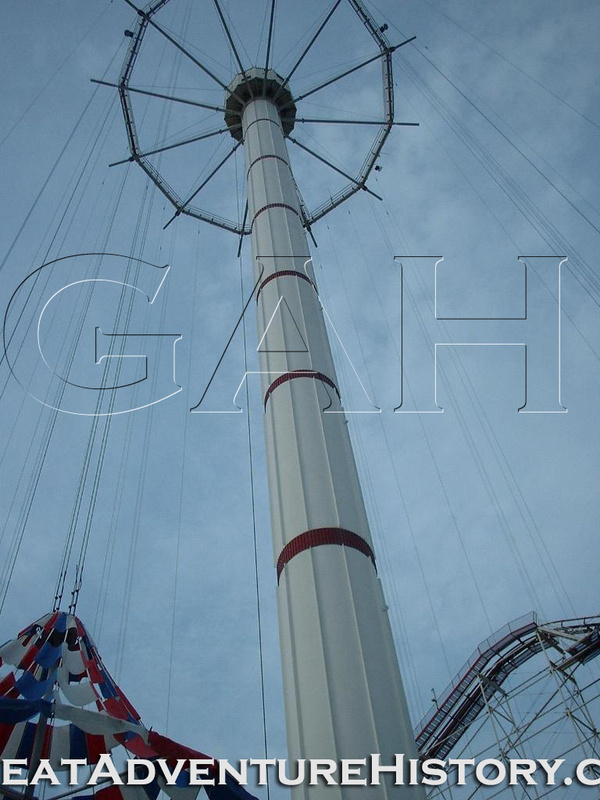 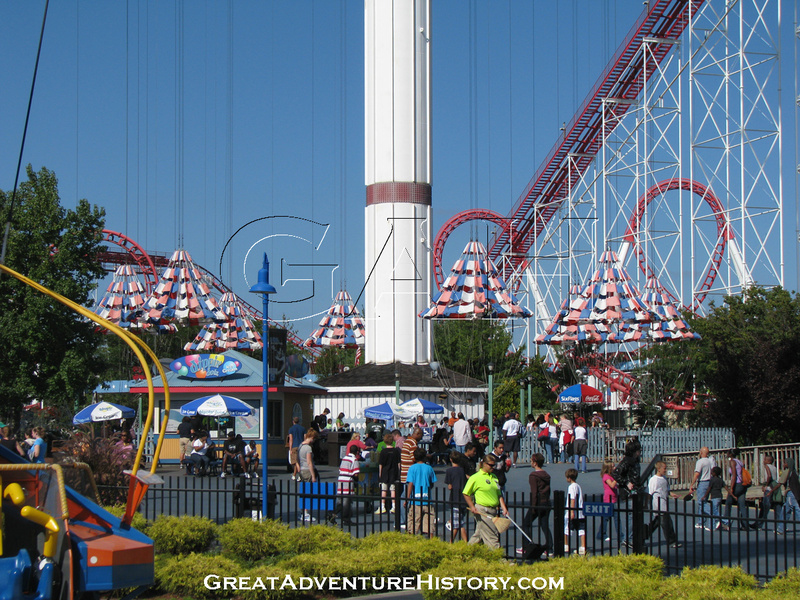 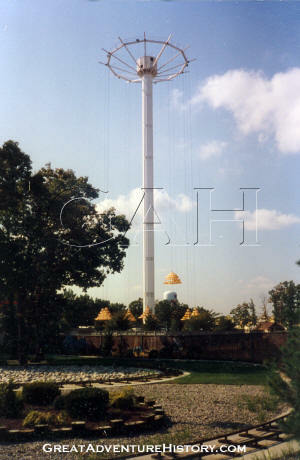 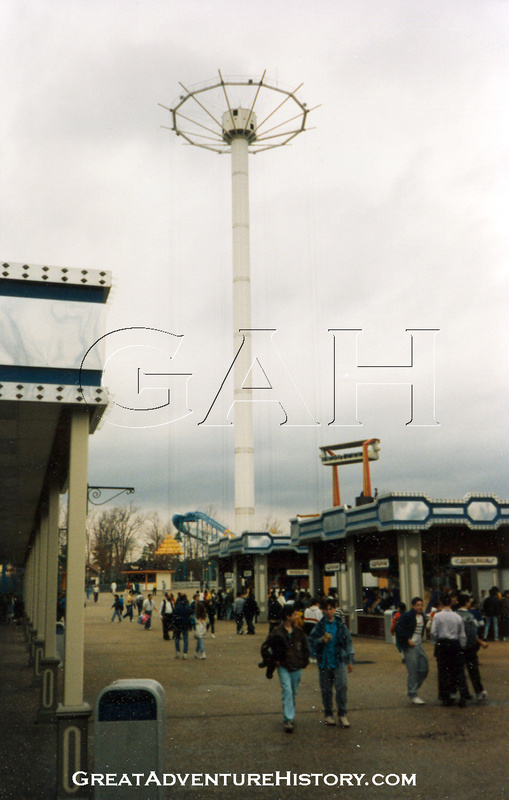 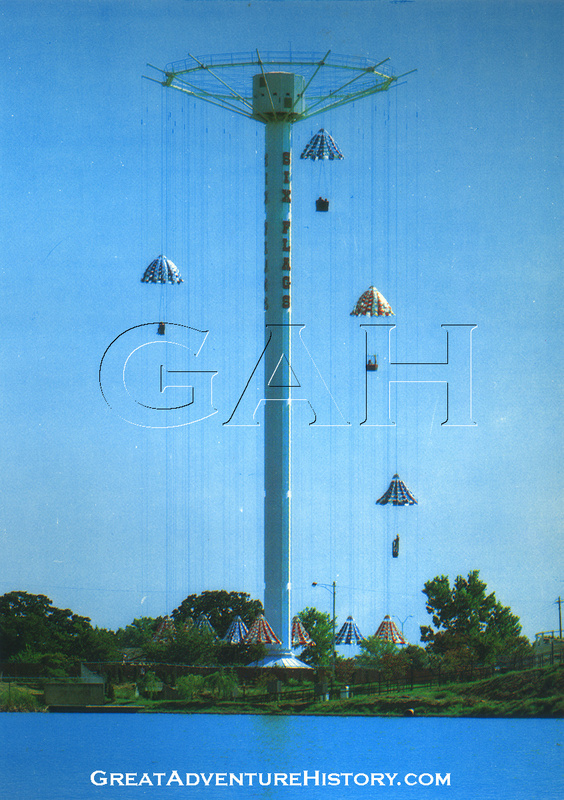 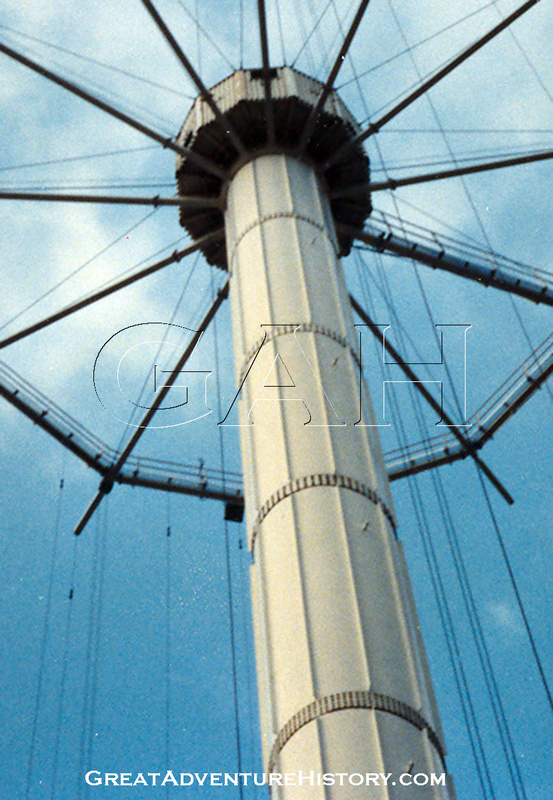 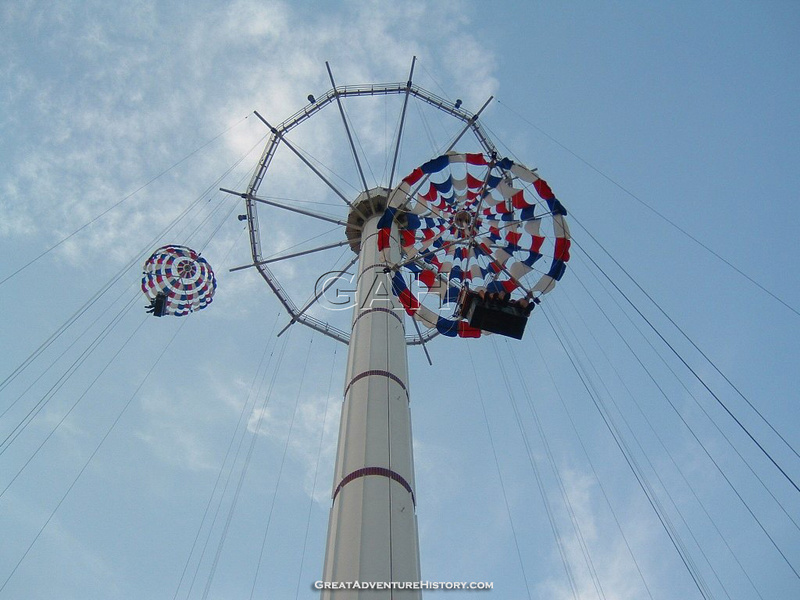 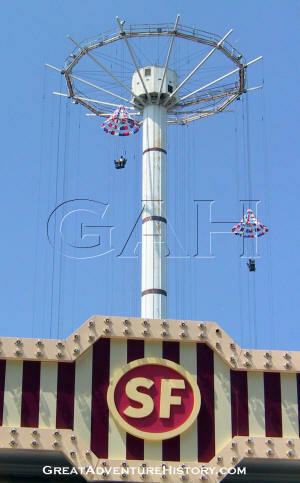 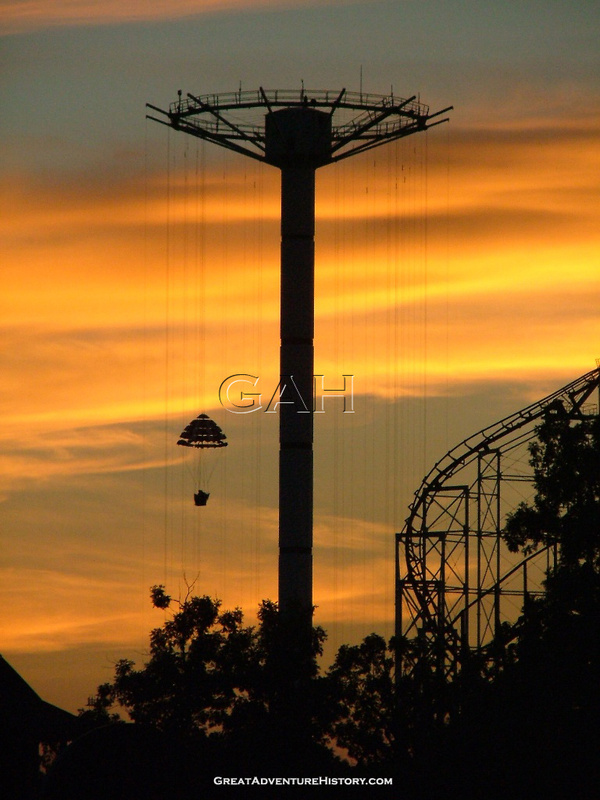 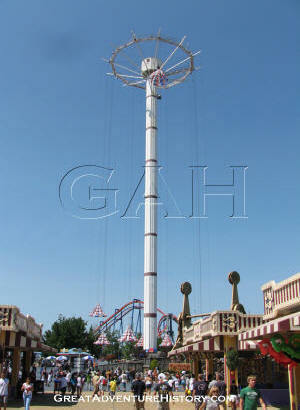 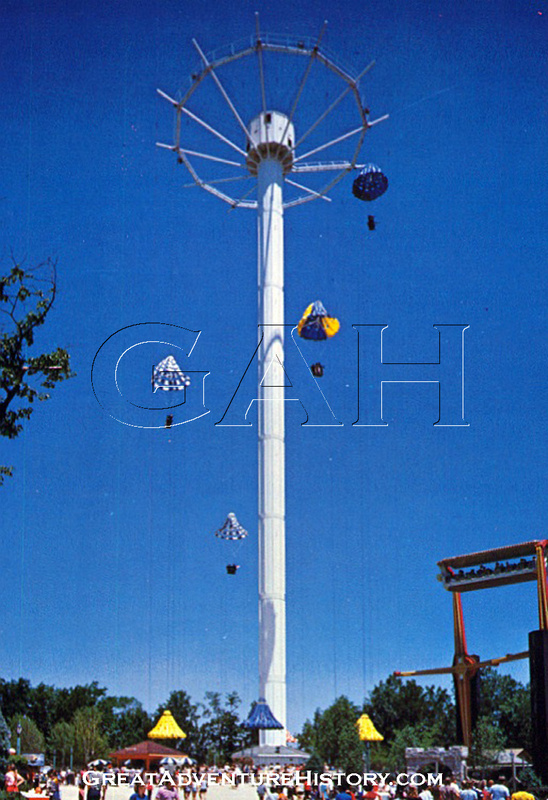 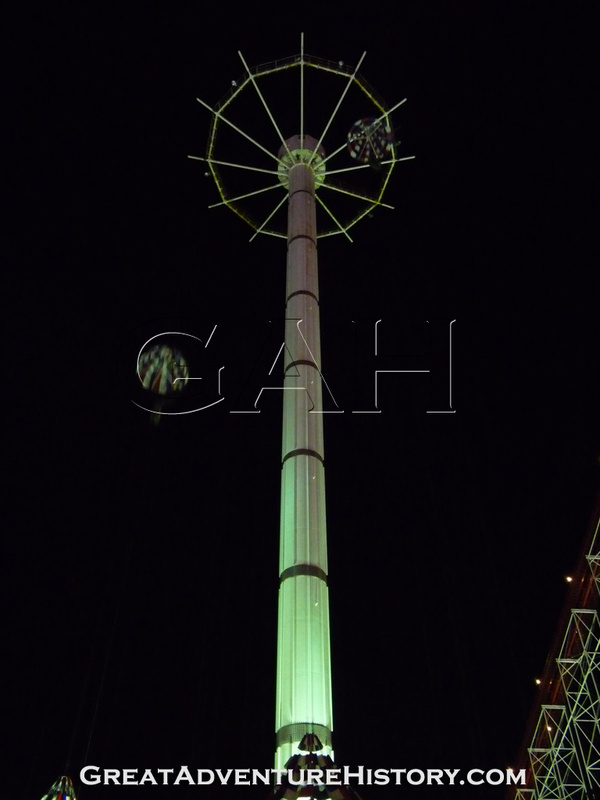 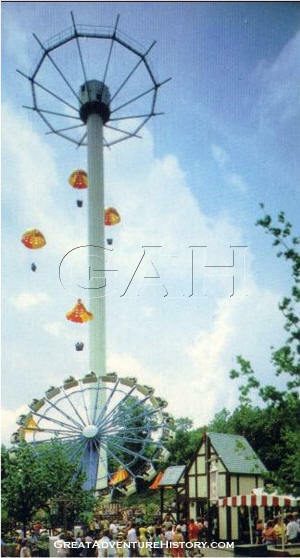 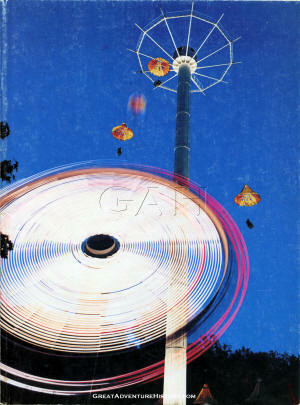 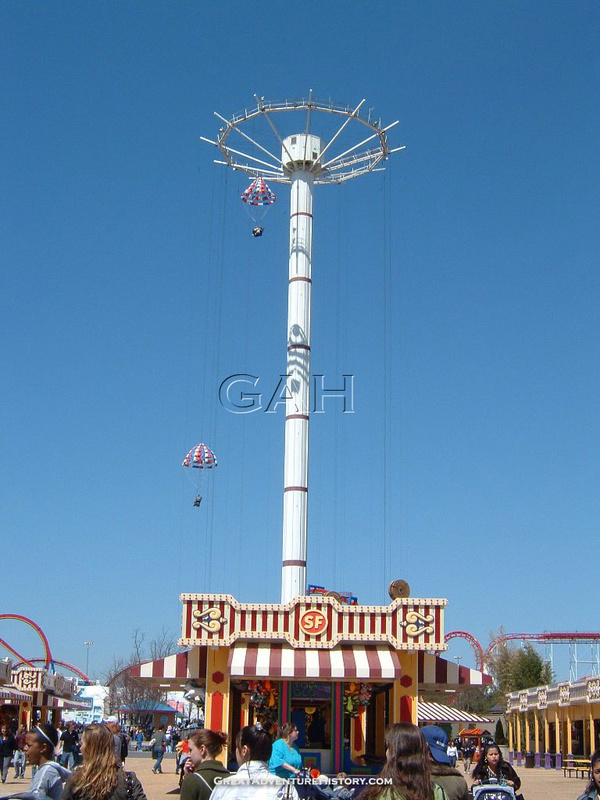 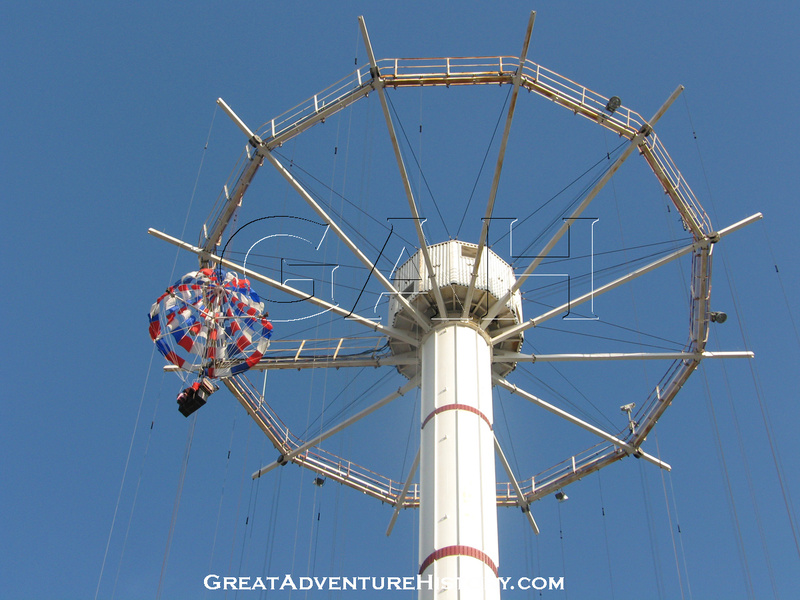 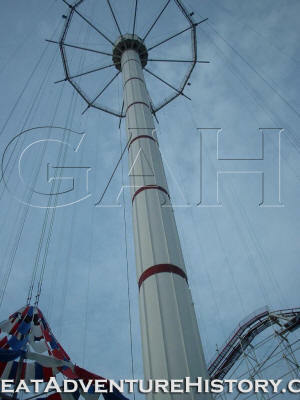 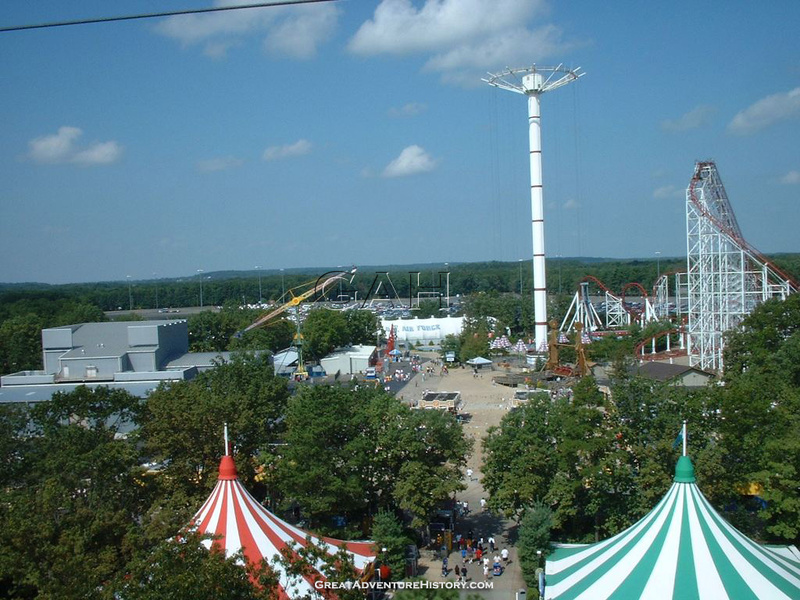 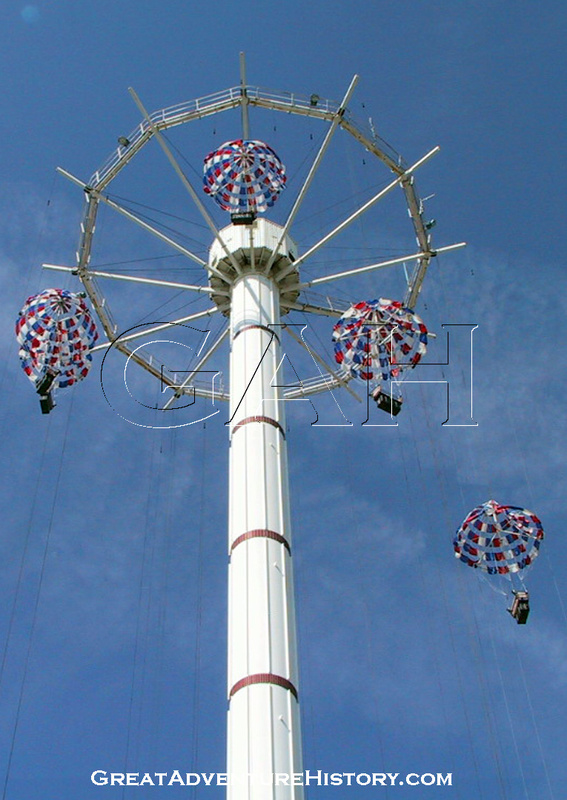 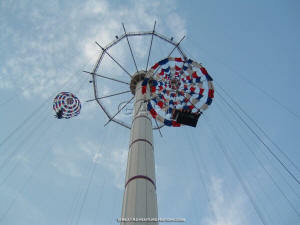 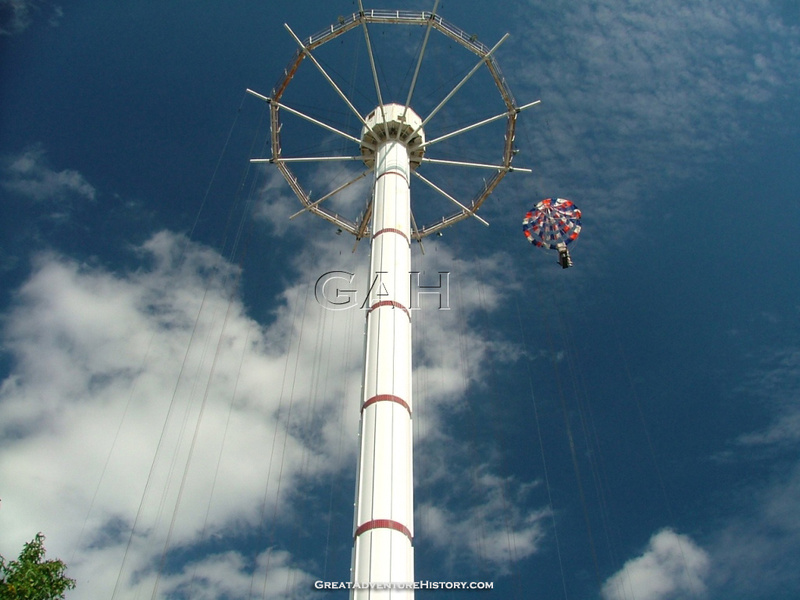 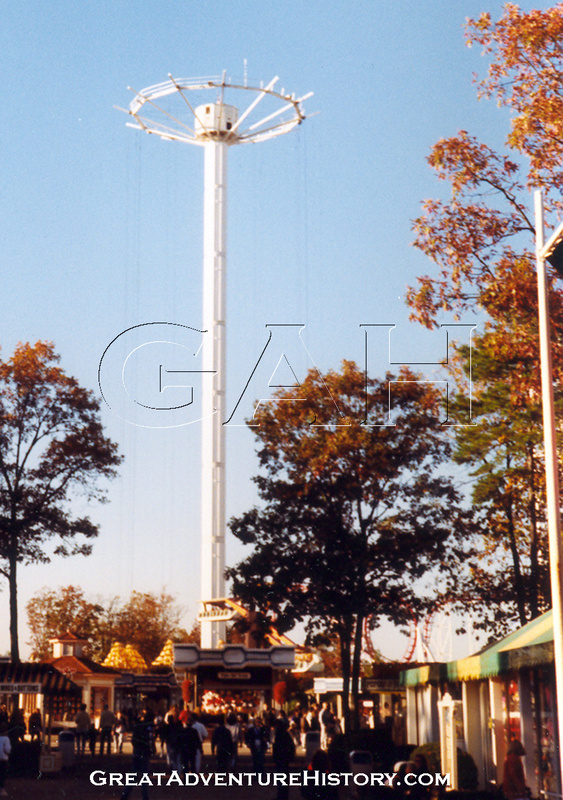 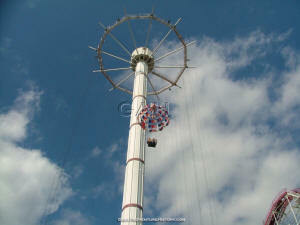 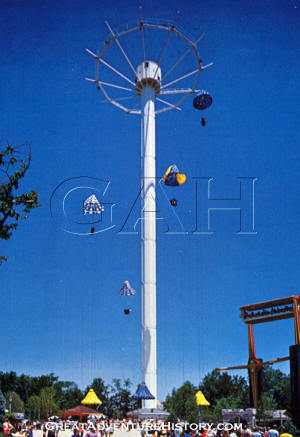 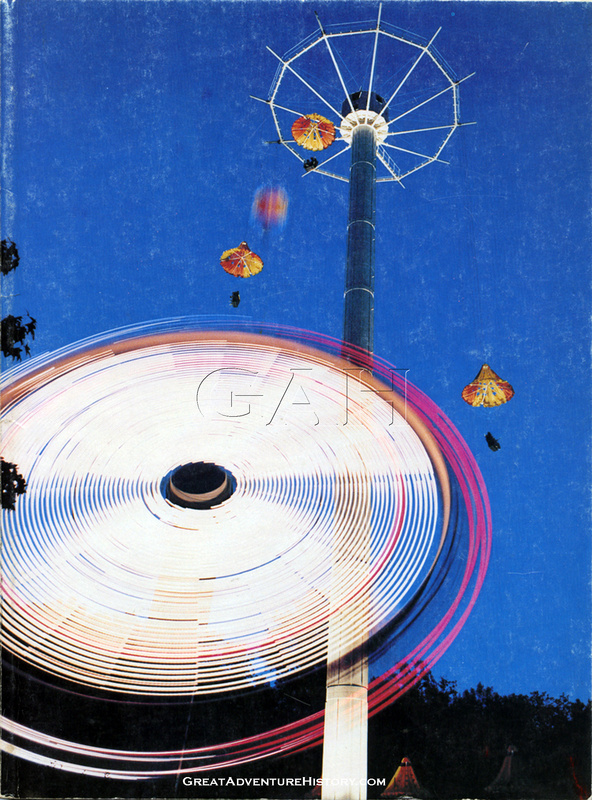 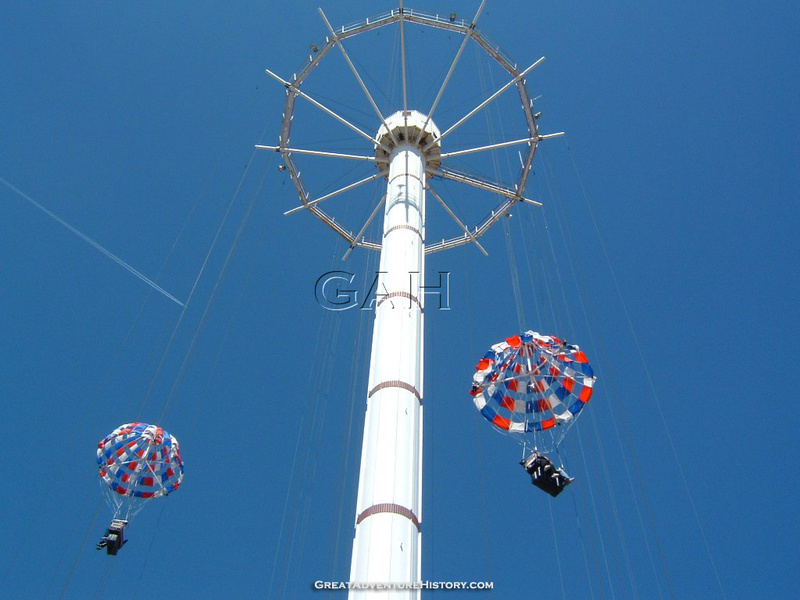 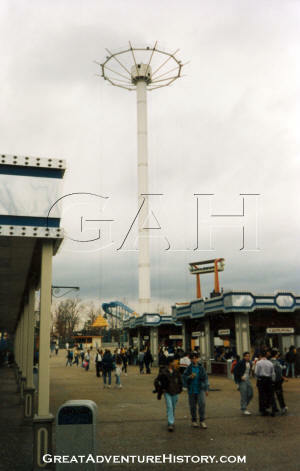 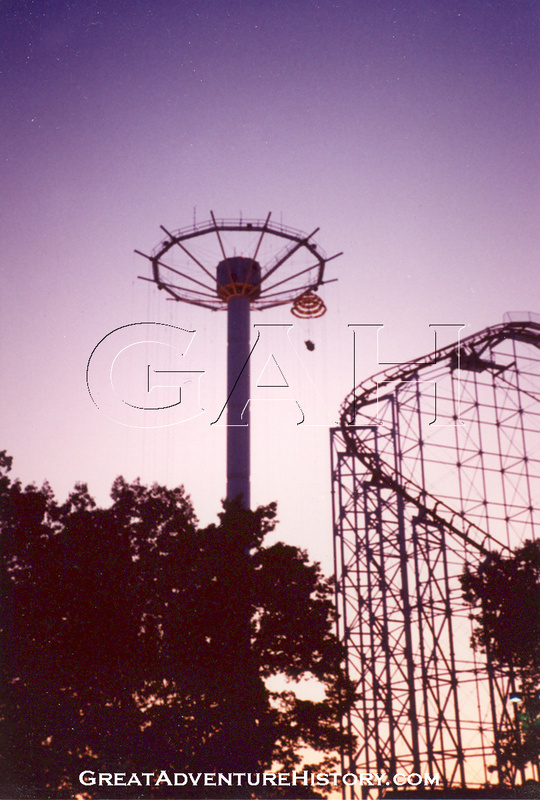 In the 1970’s the INTAMIN company worked with Six Flags to develop a modern version of the parachute ride which utilized the standard tower structure they had developed for use with sky cabin observation towers. 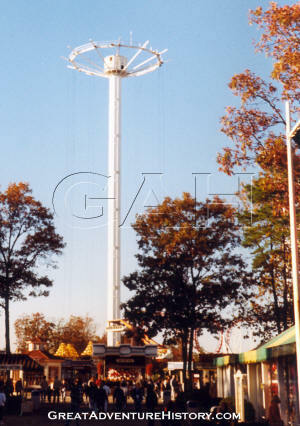 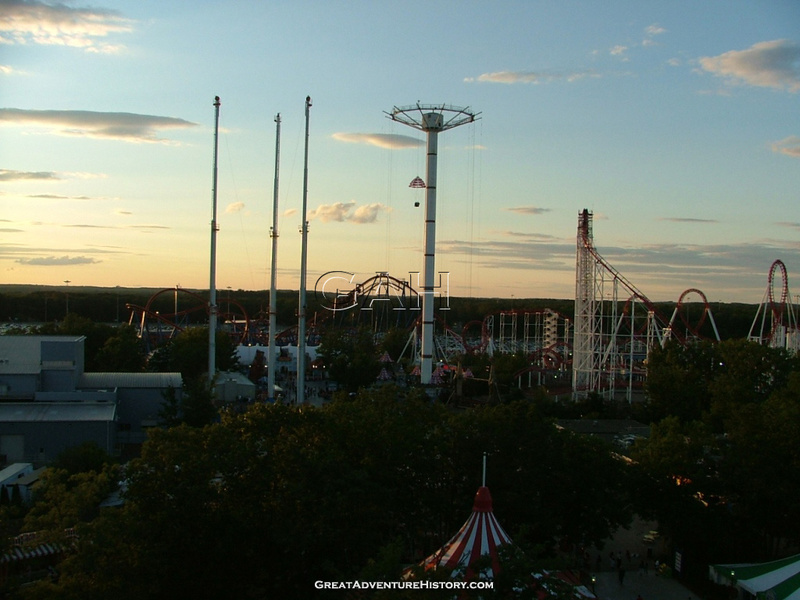 Installed at each of the original Six Flags parks in the 1970’s, the tallest of the rides was 250 feet, rivaling the Coney Island ride. 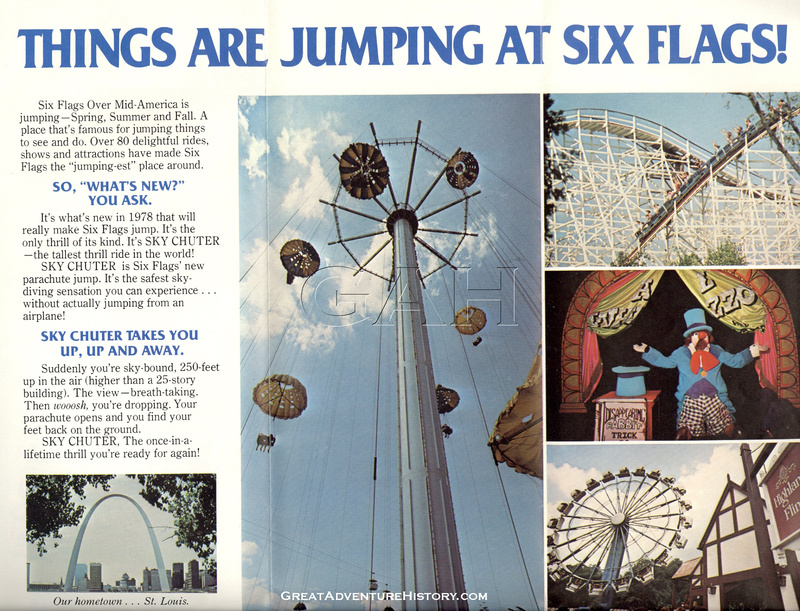 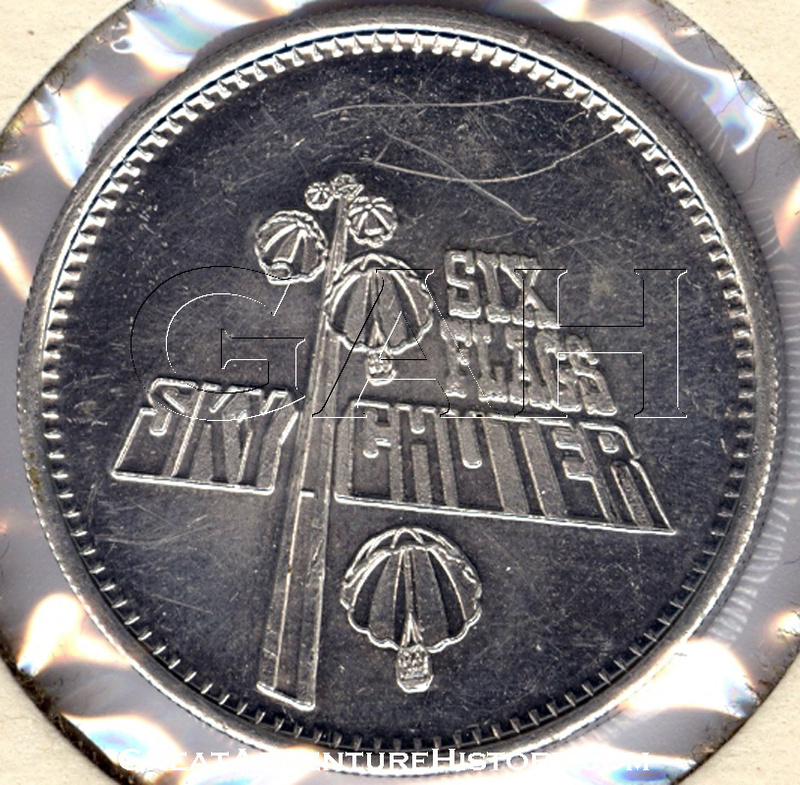 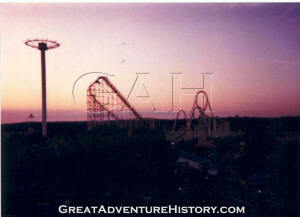 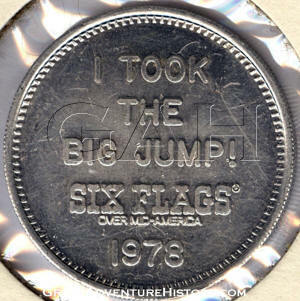 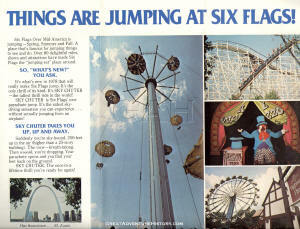 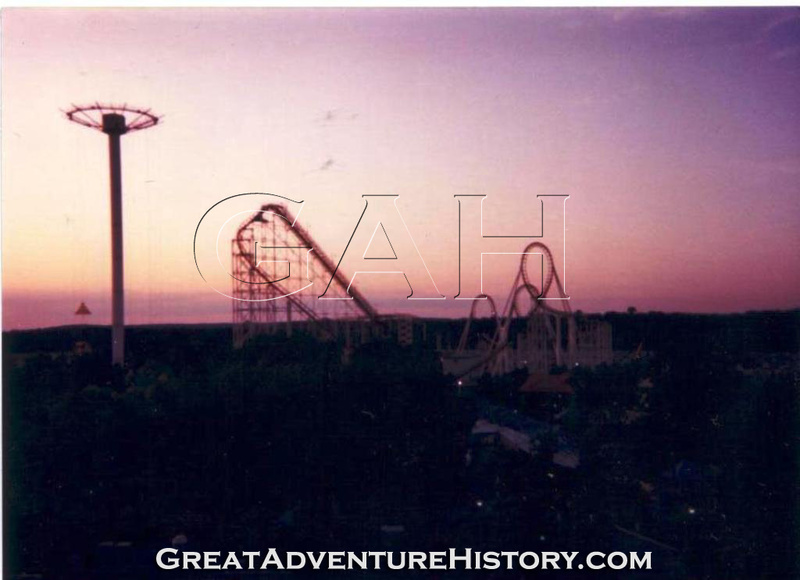 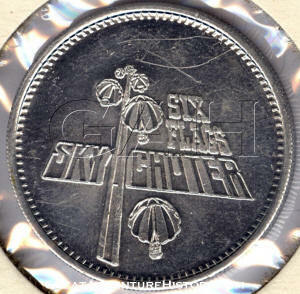 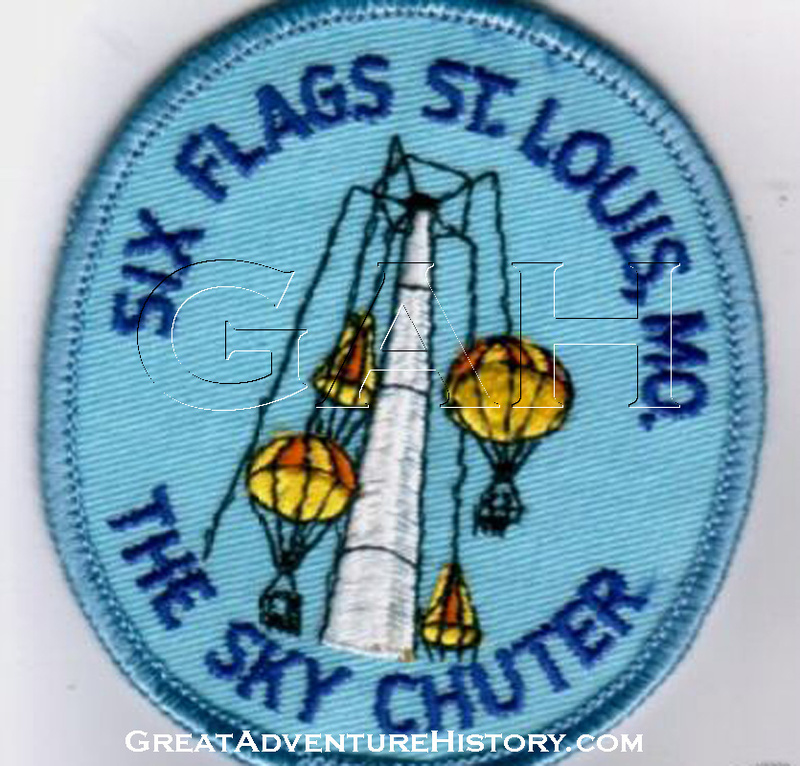 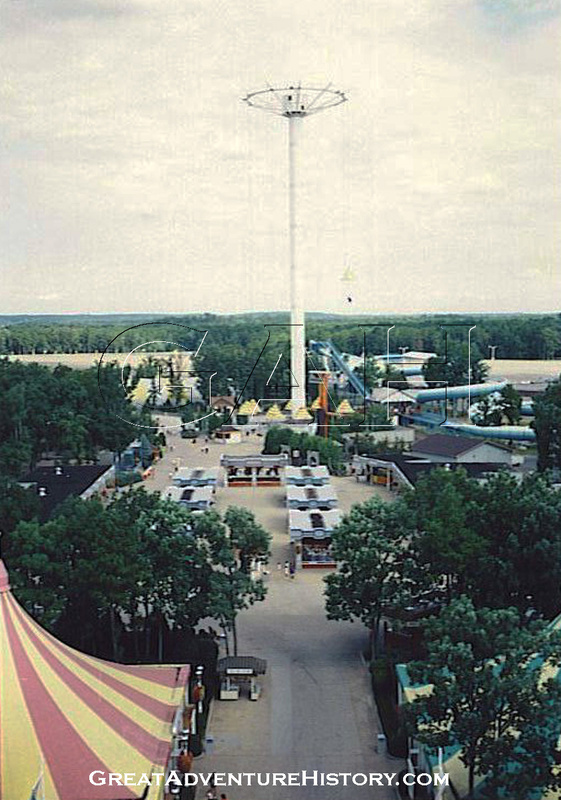 For the 1978 season, Six Flags Over Mid-America introduced the Sky Chuter which was the world’s tallest thrill ride when it debuted and held that title for many years to come. 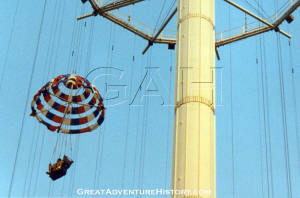 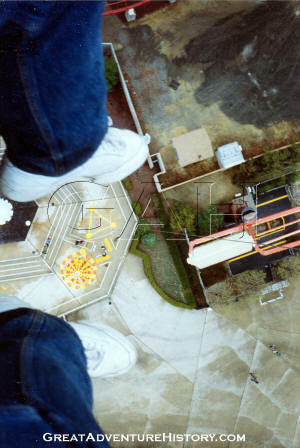 At 250 feet the ride was a marquis attraction and considered extremely thrilling. 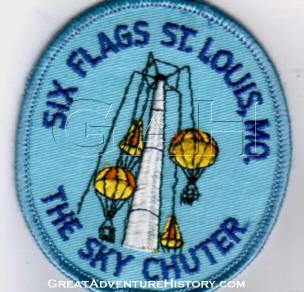 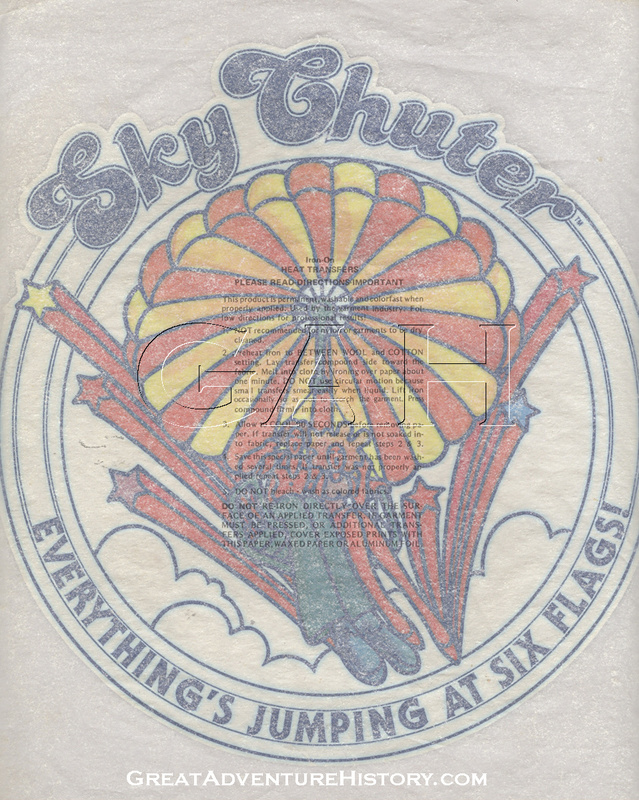 Sky Chuter operated at Six Flags Over Mid America until the fall of 1982 when it closed for removal to make way for the park's Thunder River Rapids. 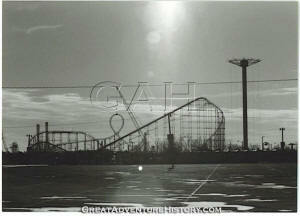 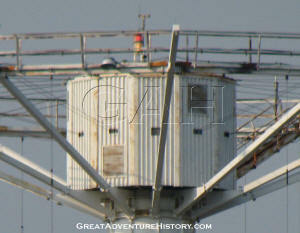 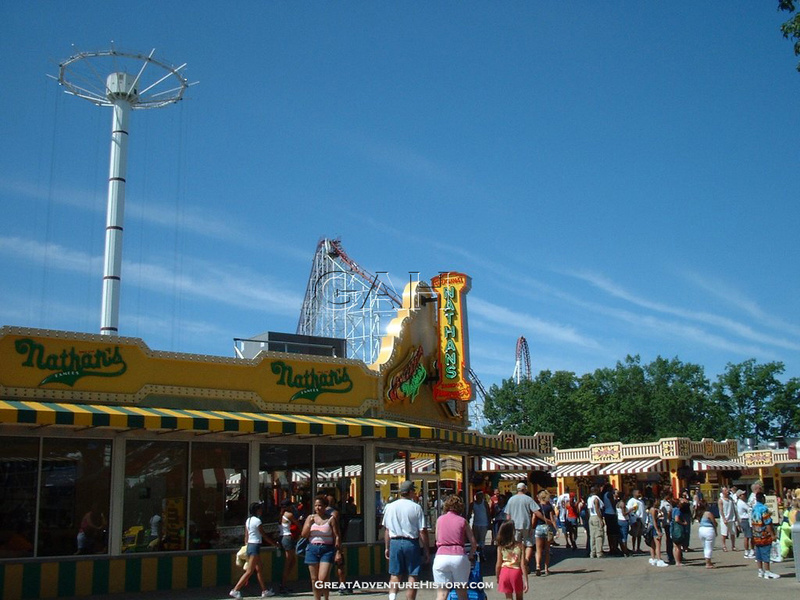 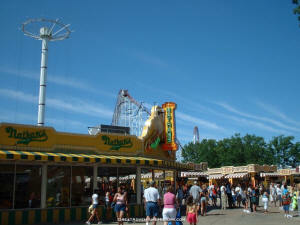 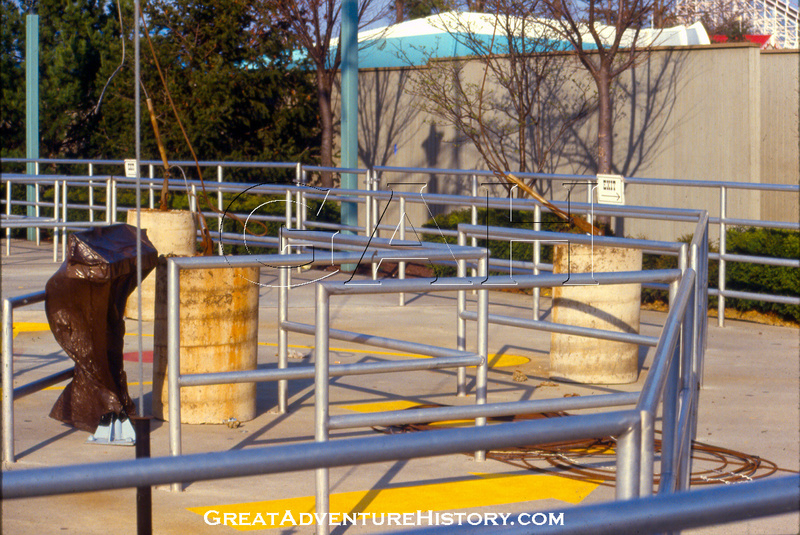 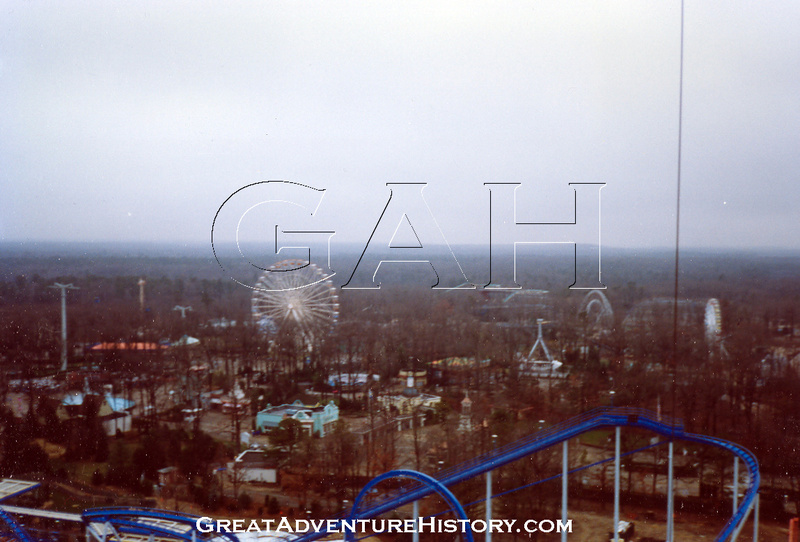 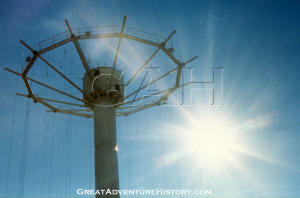 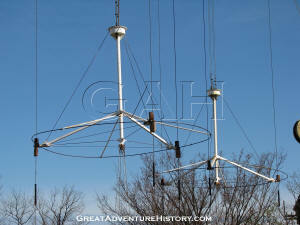 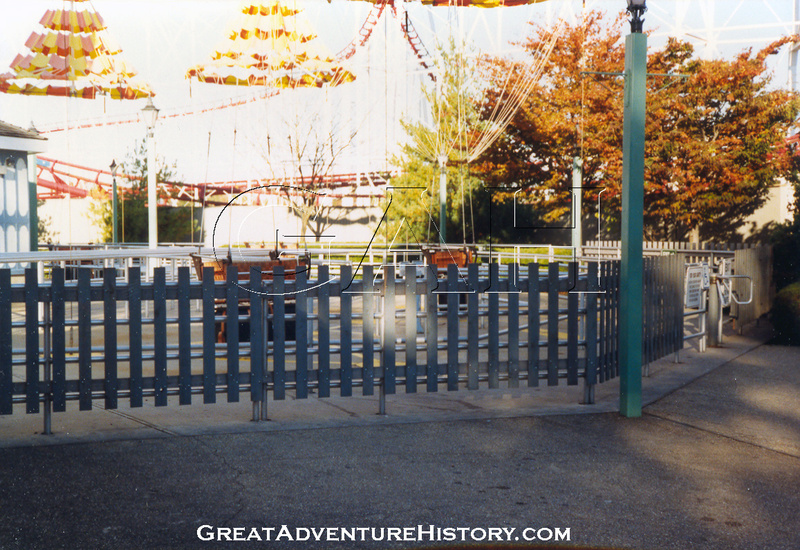 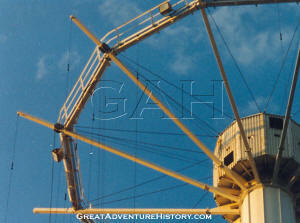 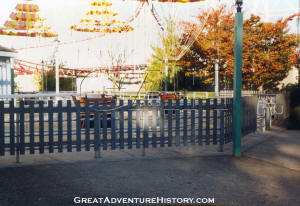 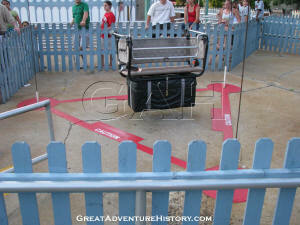 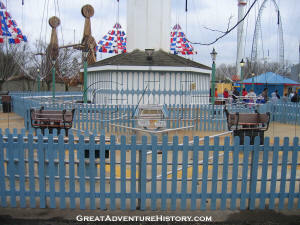 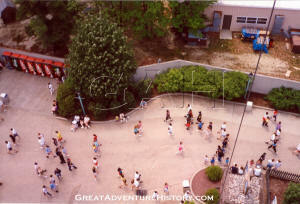 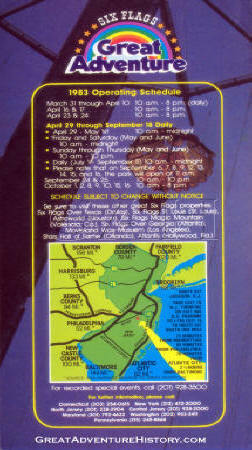 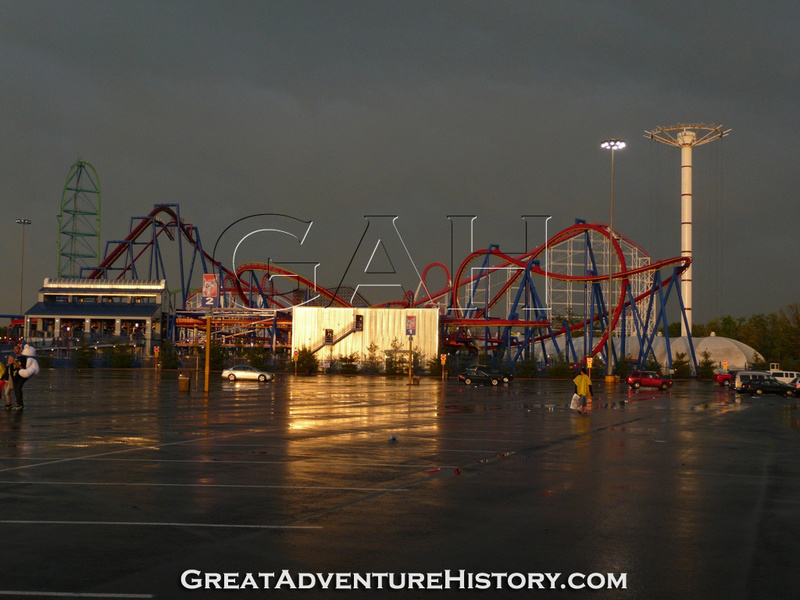 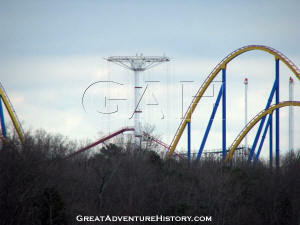 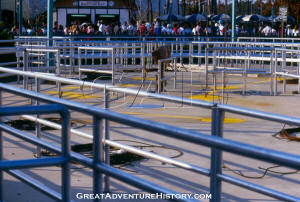 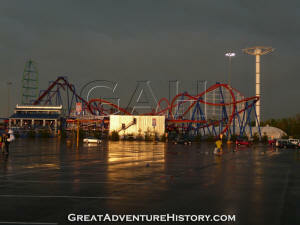 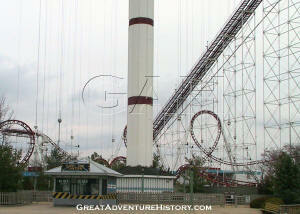 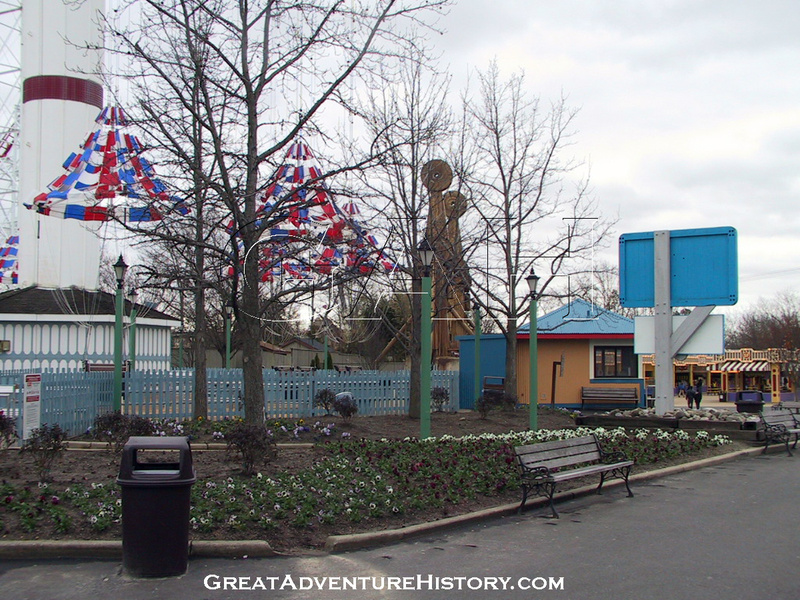 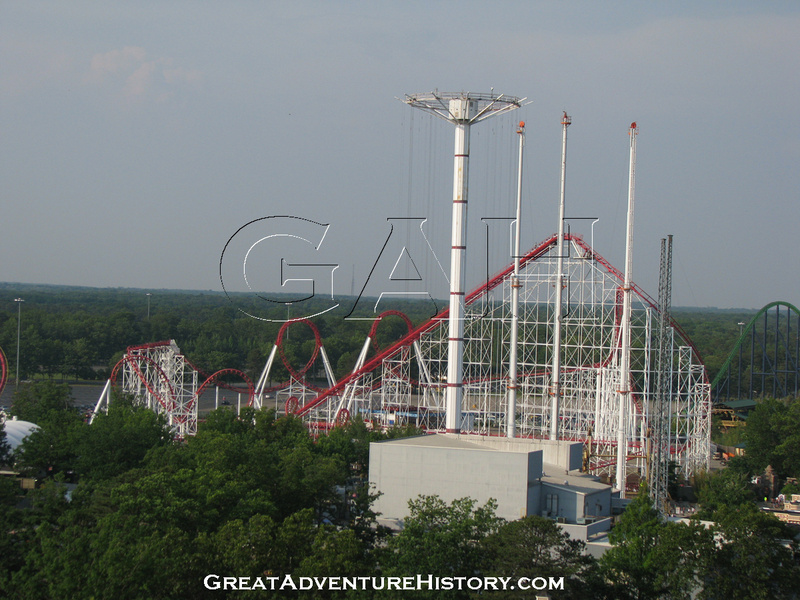 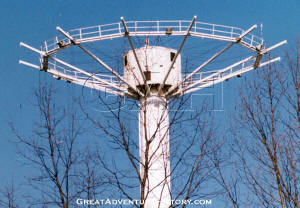 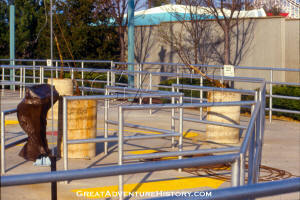 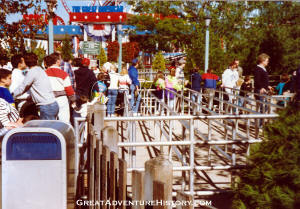 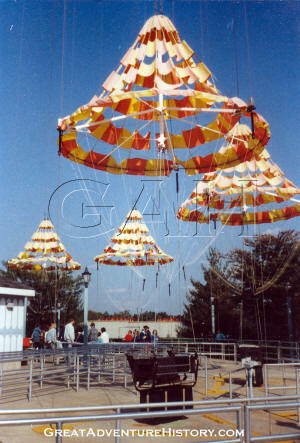 The ride began disassembly and relocation to Six Flags Great Adventure in the 1982-1983 off-season. 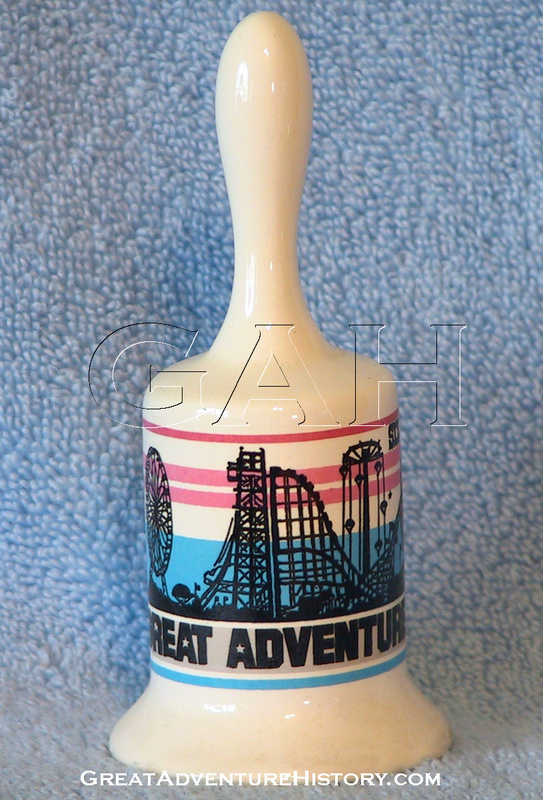 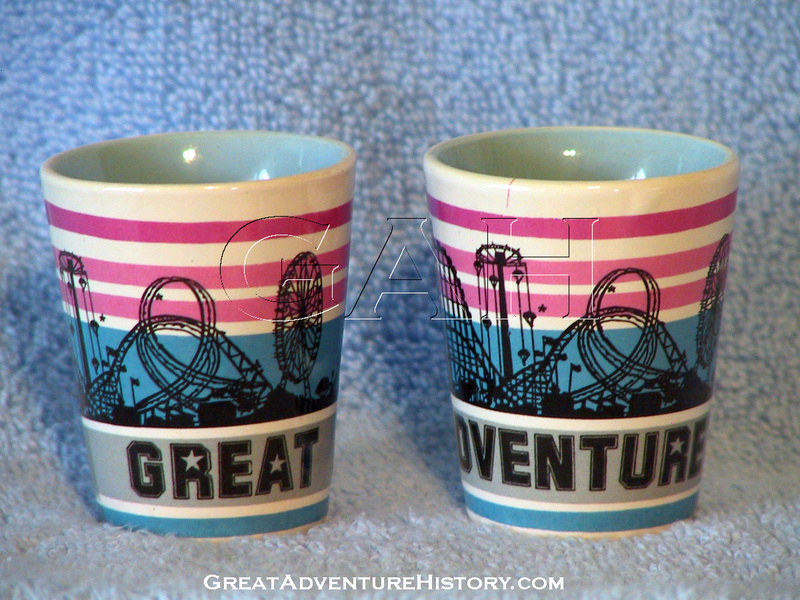 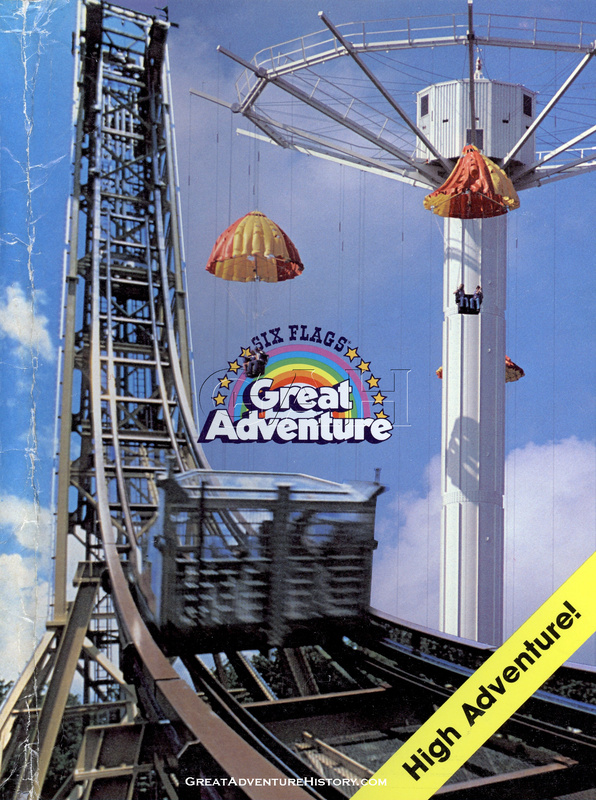 The early 1980’s were a time of rapid growth in attendance for Six Flags Great Adventure, with each year’s attendance increasing as the park expanded and improved, and in response Six Flags poured additional resources into the park to keep making it bigger and better. 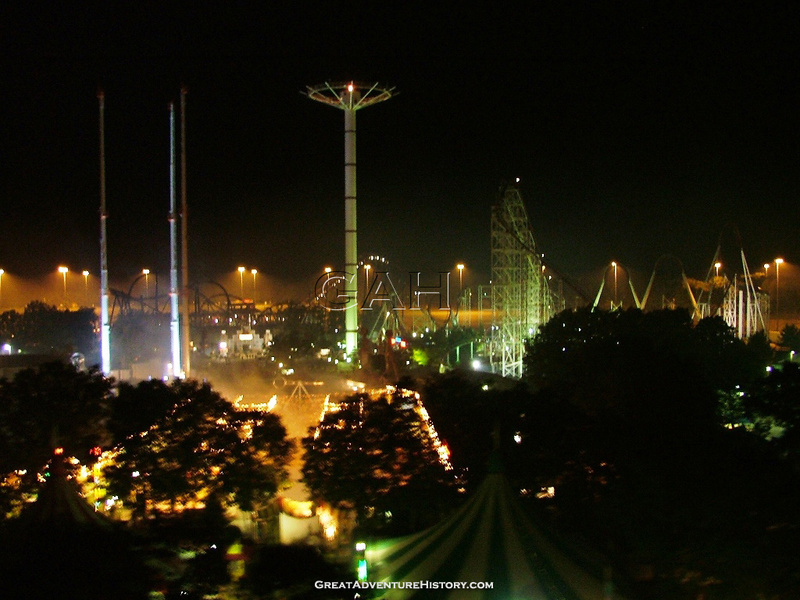 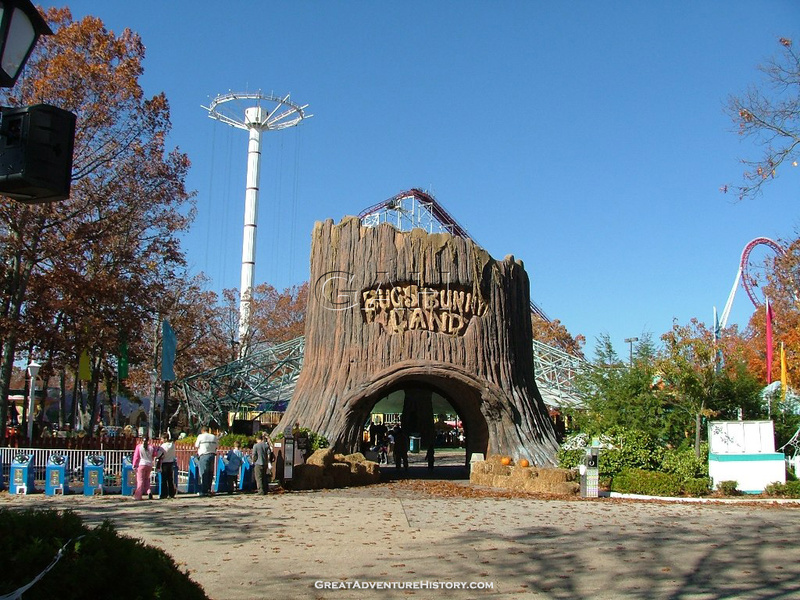 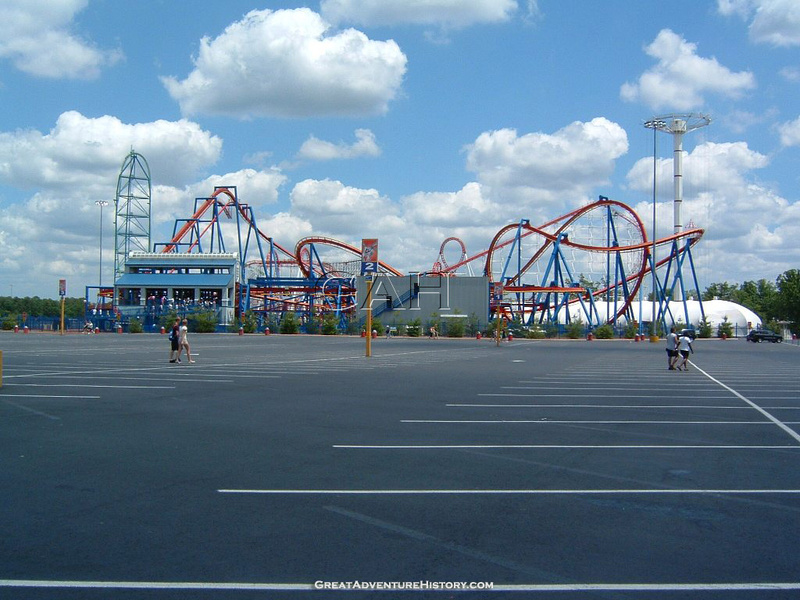 It only made sense that as the company’s largest and most attended park that it would get the biggest and best rides, and being the world’s tallest thrill ride, it was a great fit for the ever expanding park. 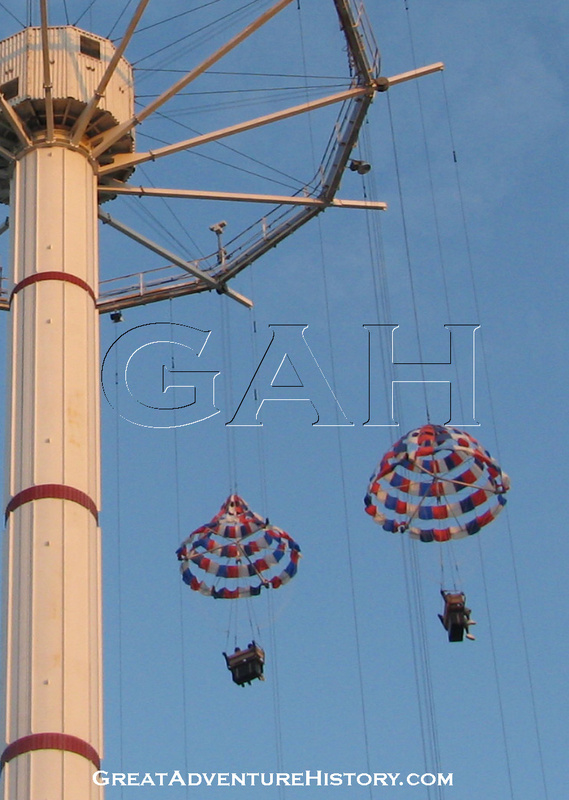 to view the videos, so sign up today. 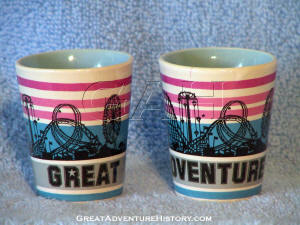 ad share your own Great Adventure memories! 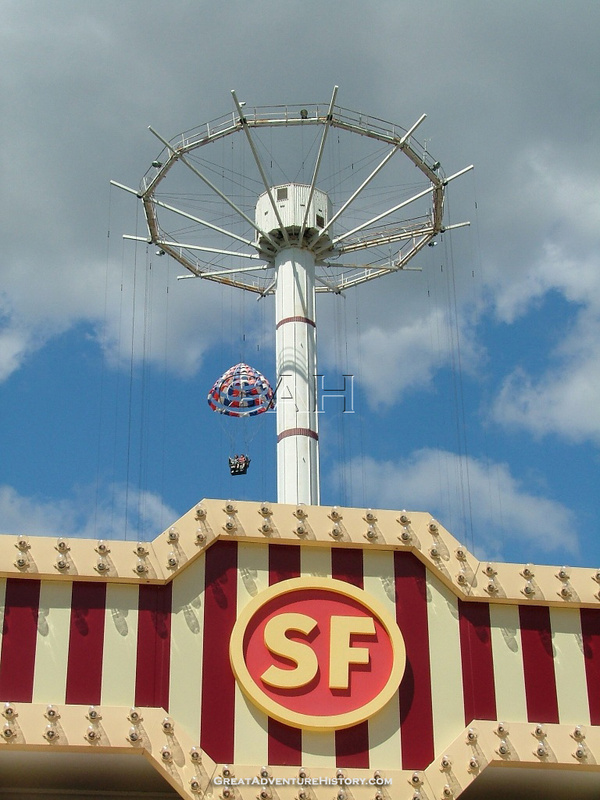 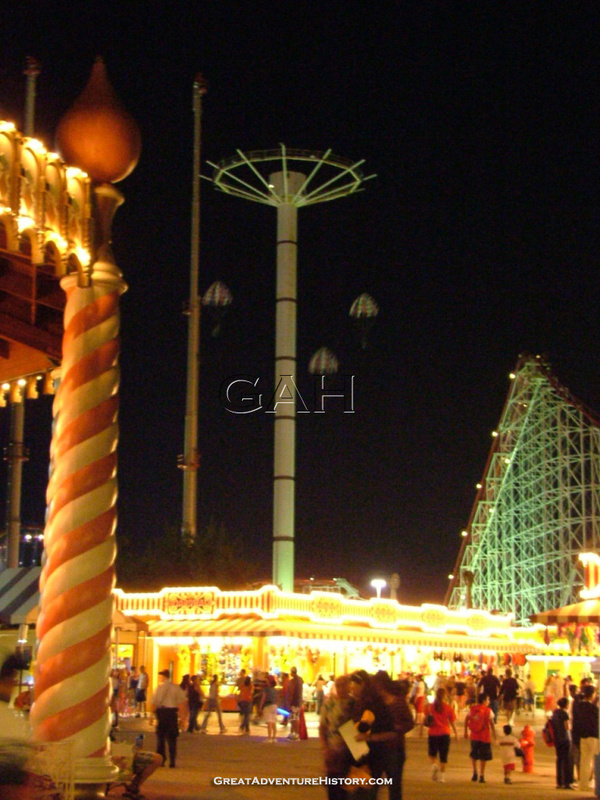 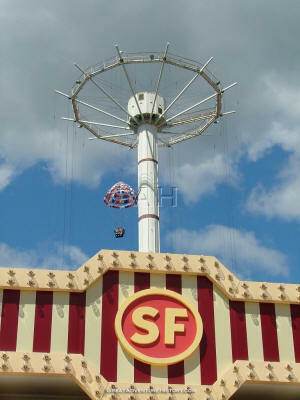 The Parachuter’s Perch was added to the park’s updated games area, which had been rebuilt a year earlier after a fire had destroyed the original Fortune Festival area. Being very profitable, every effort was made to draw guests into the games area, and the addition of a highly visible and thrilling ride at the far end of the section made a huge impact. 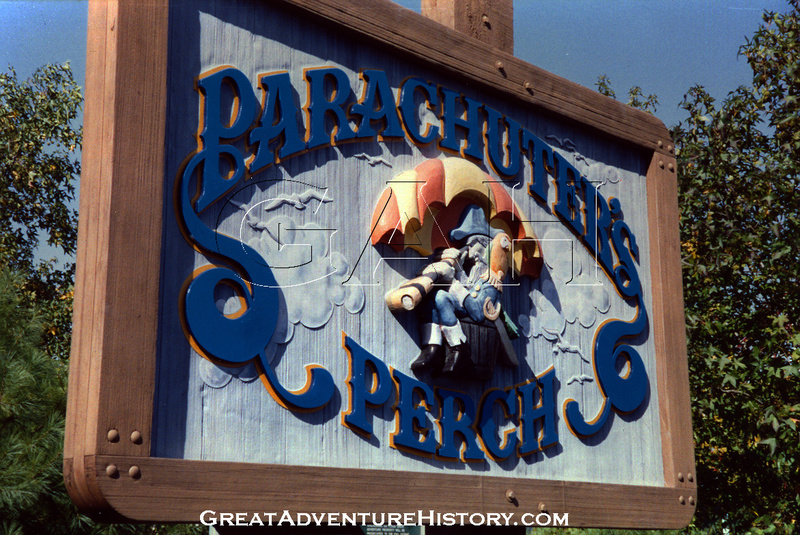 In theme park design large structures designed to draw guests inward are known as “weenies”, and the Parachuter’s Perch was the biggest weenie available at the time. 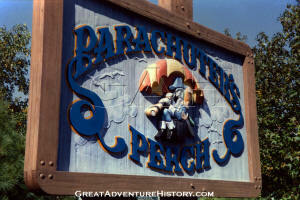 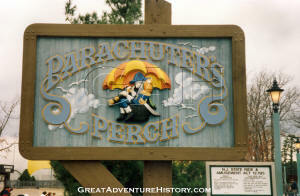 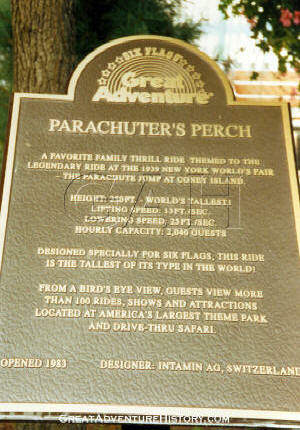 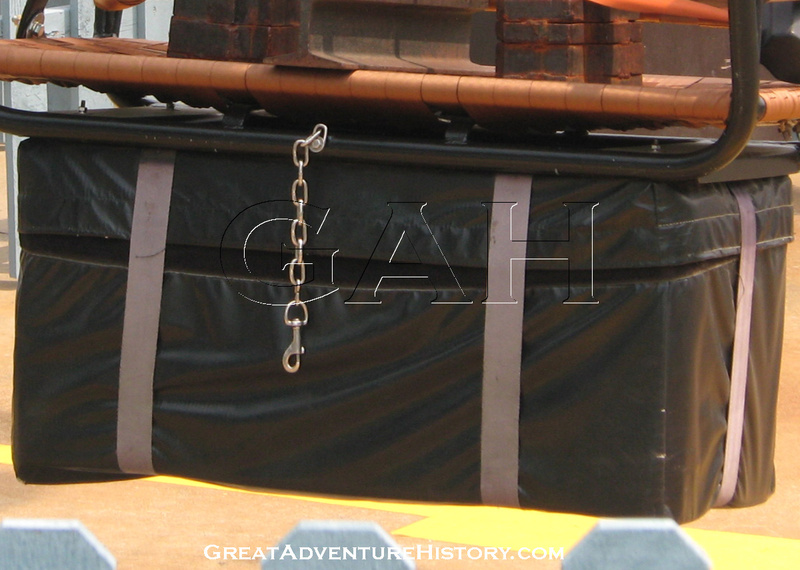 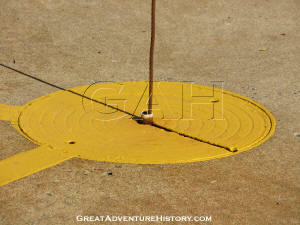 The site for the Parachuter’s Perch was originally a small drainage pond in a backstage area of the park. 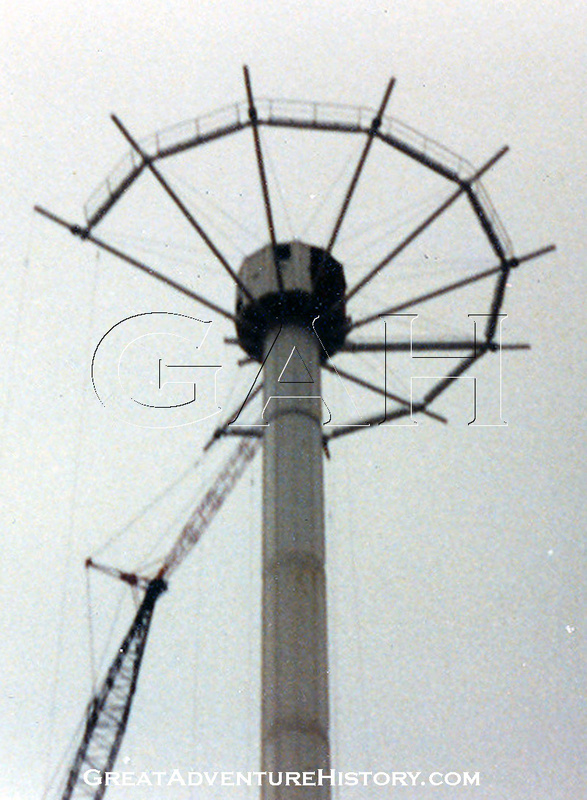 Site preparations began in 1982 with the water being drained and the tower’s massive foundation taking shape in preparation for the arrival of the structure over the off season. 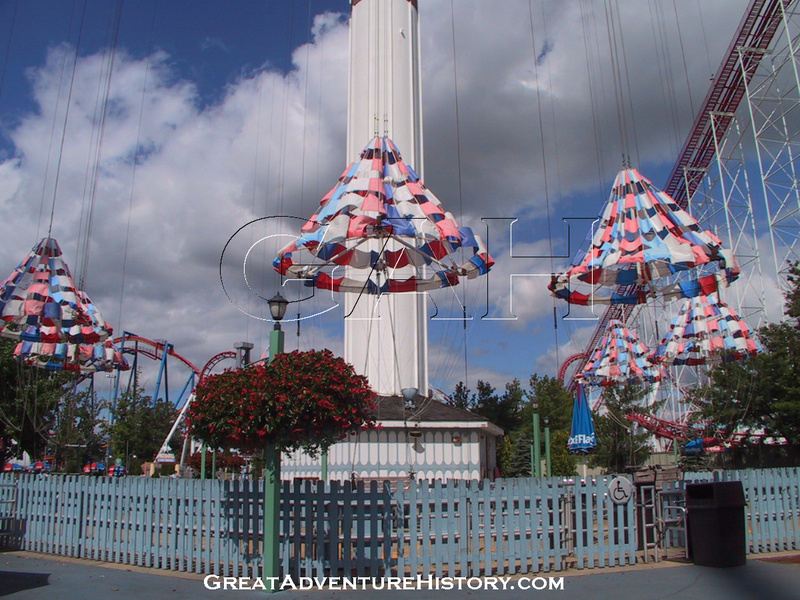 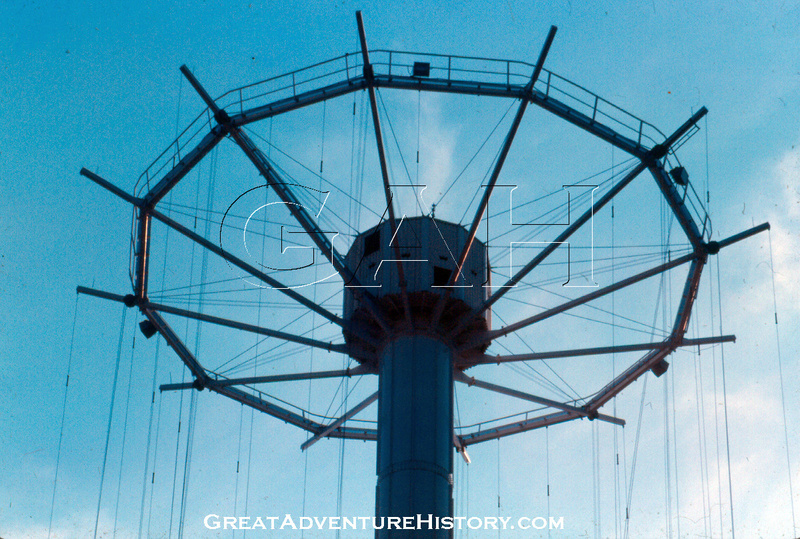 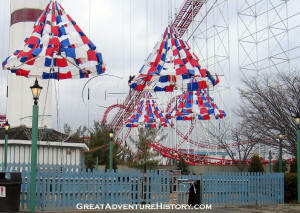 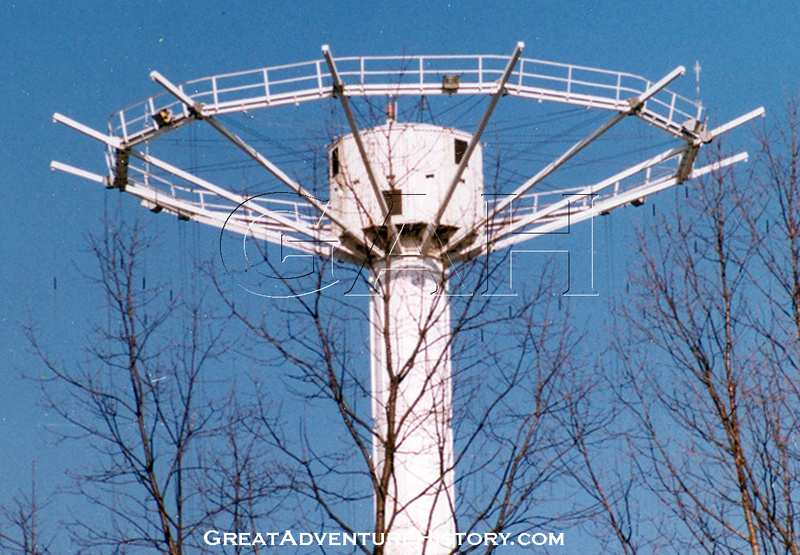 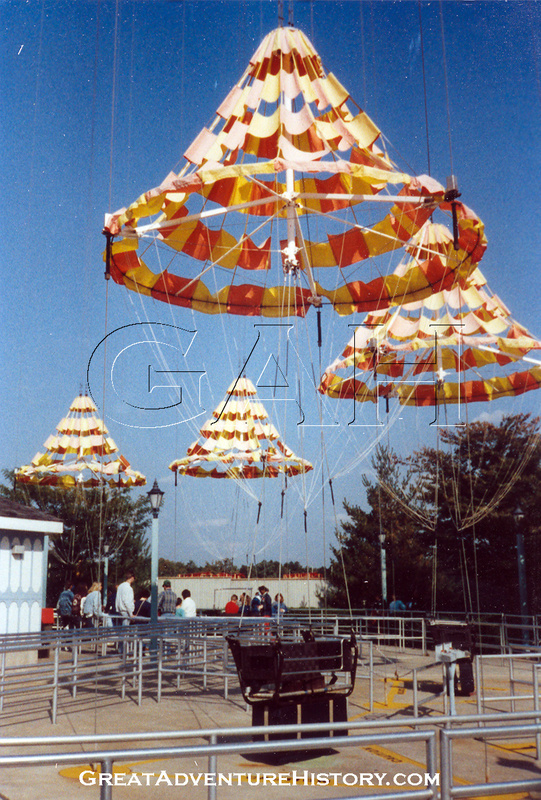 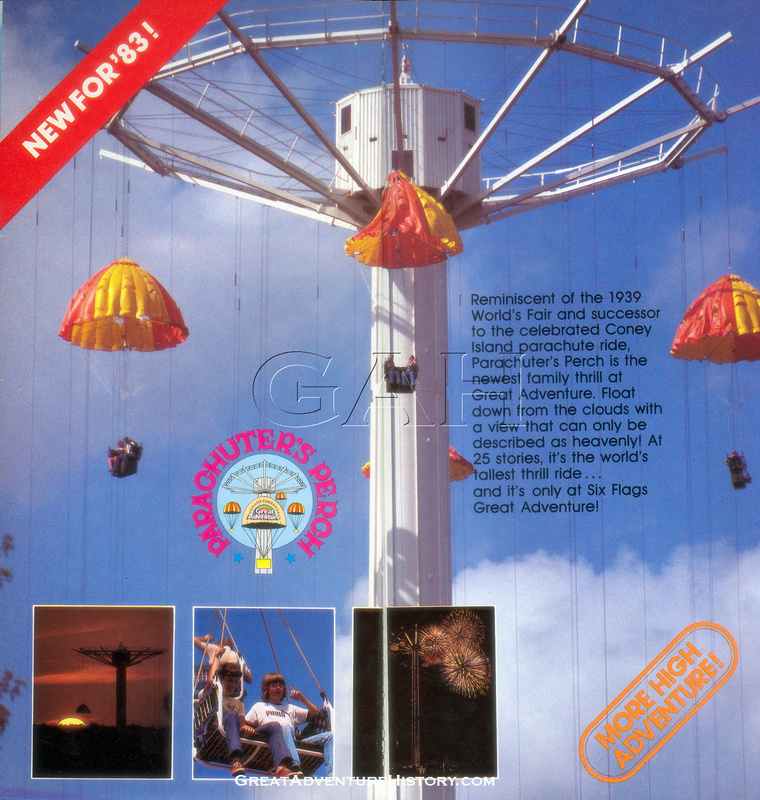 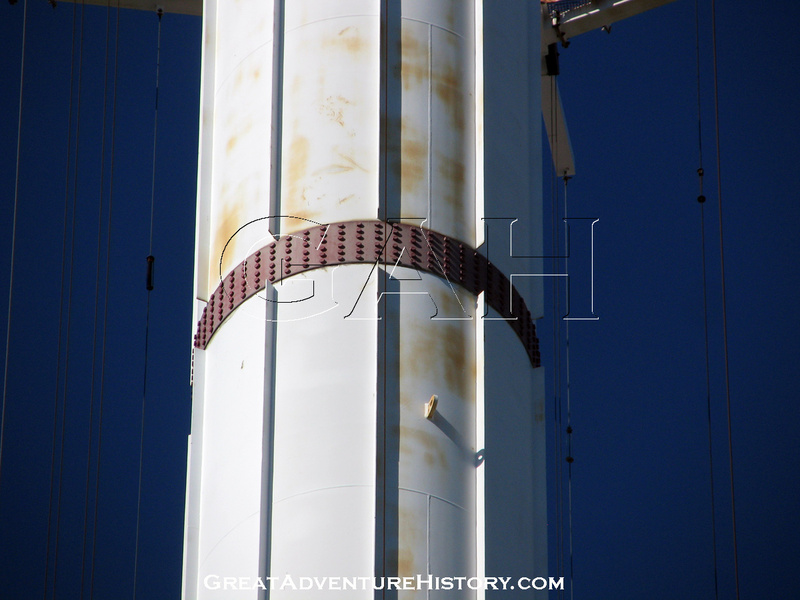 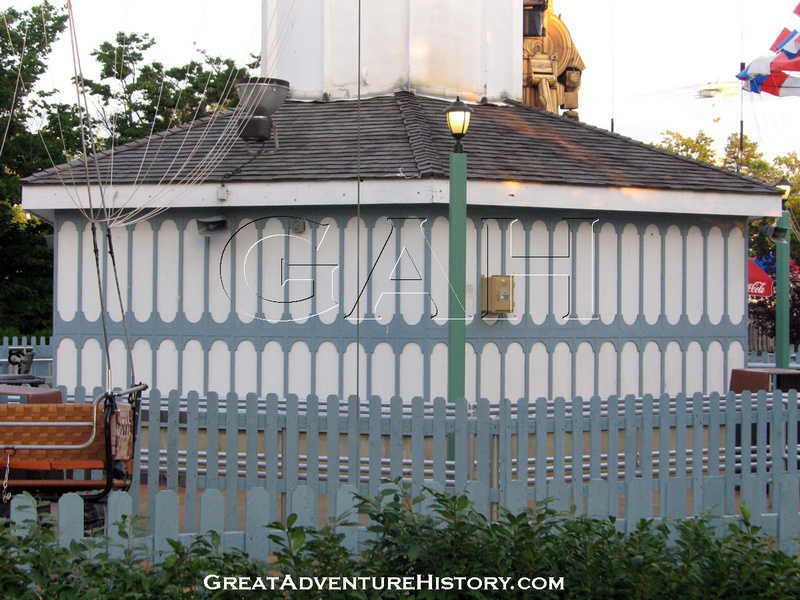 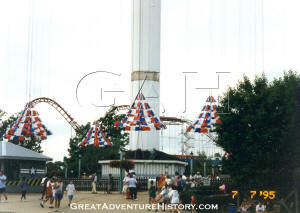 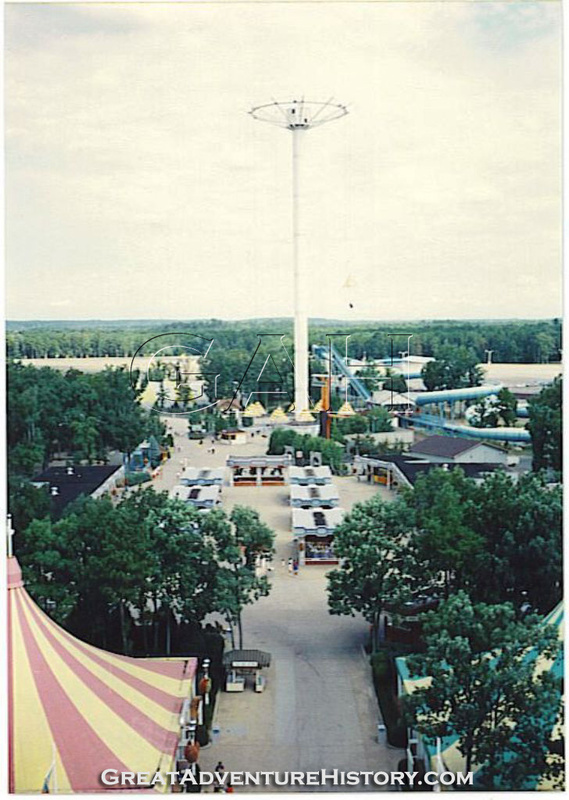 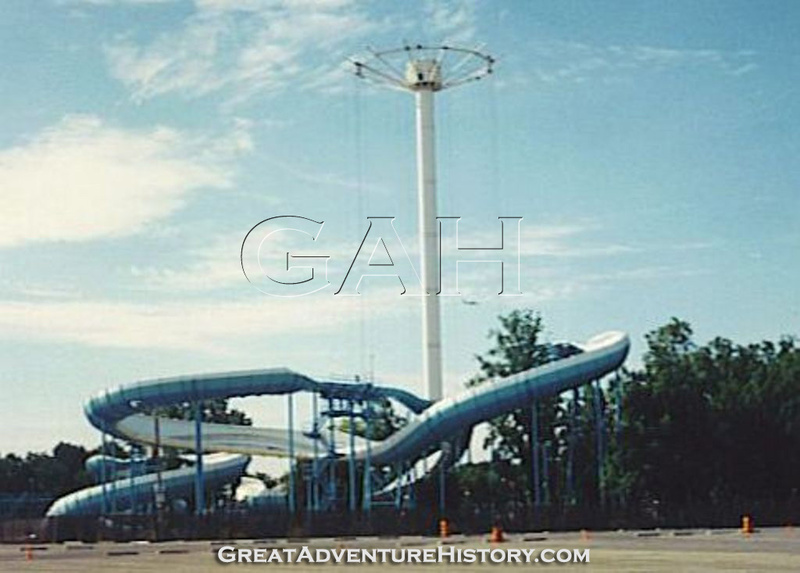 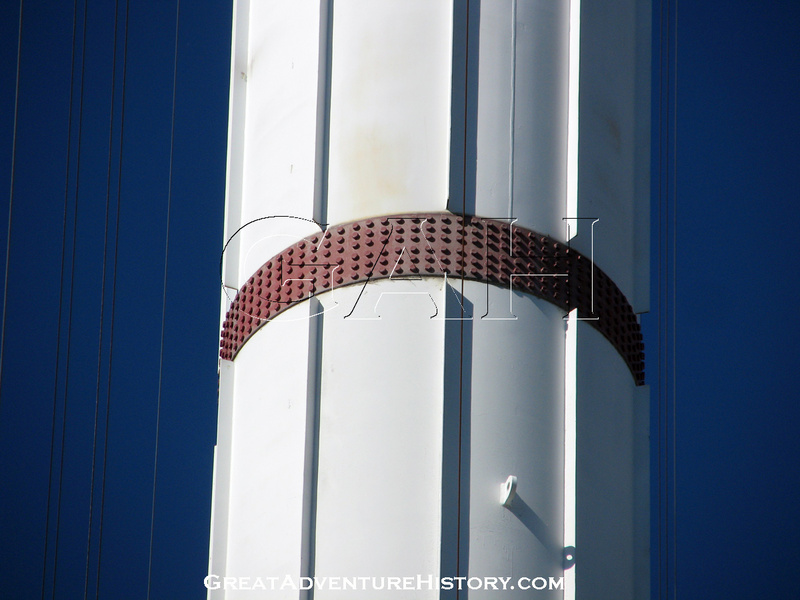 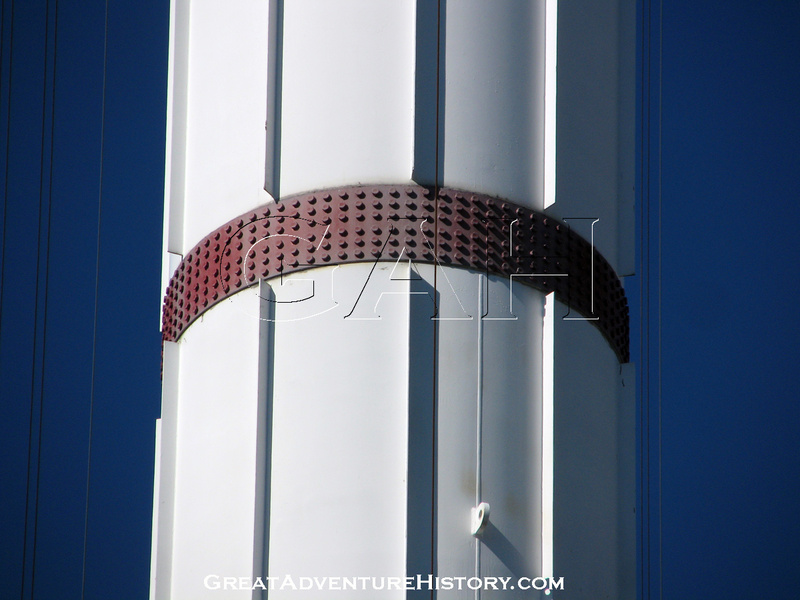 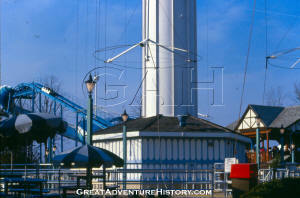 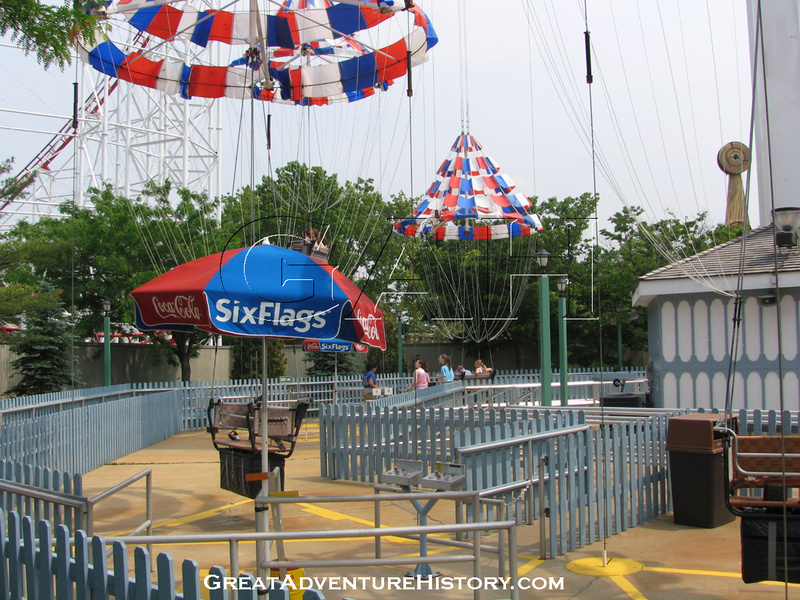 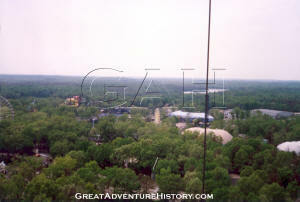 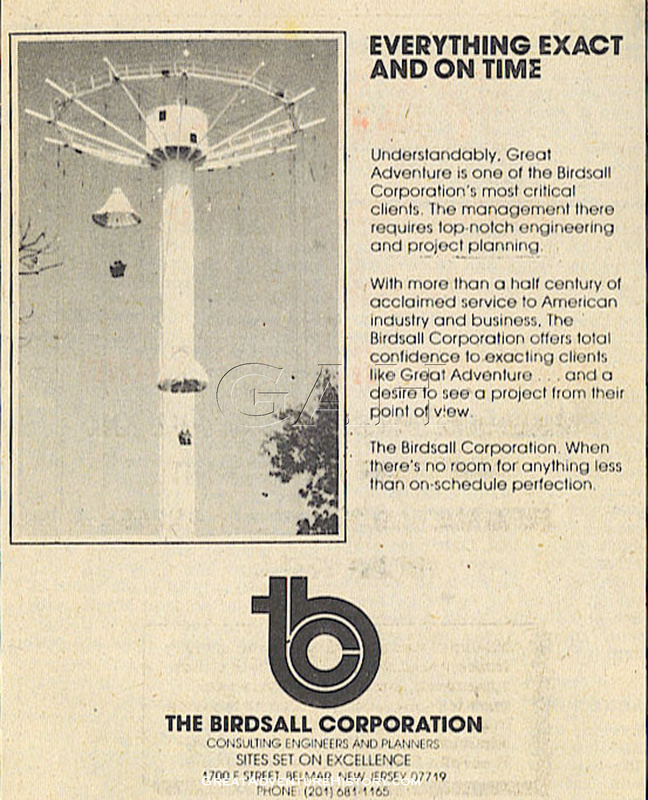 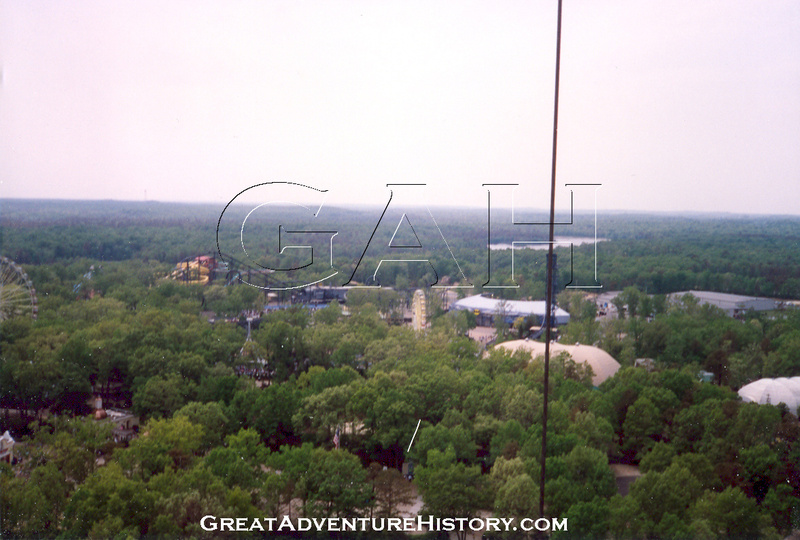 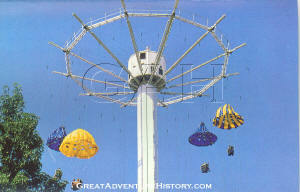 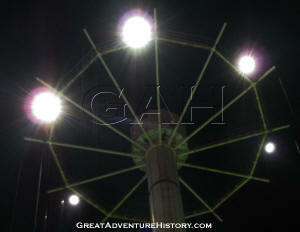 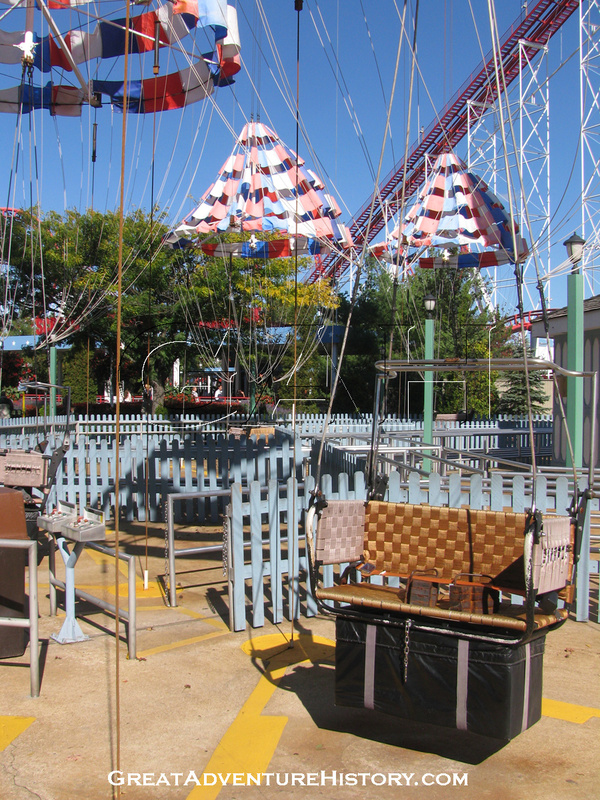 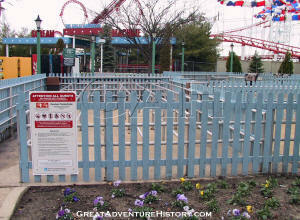 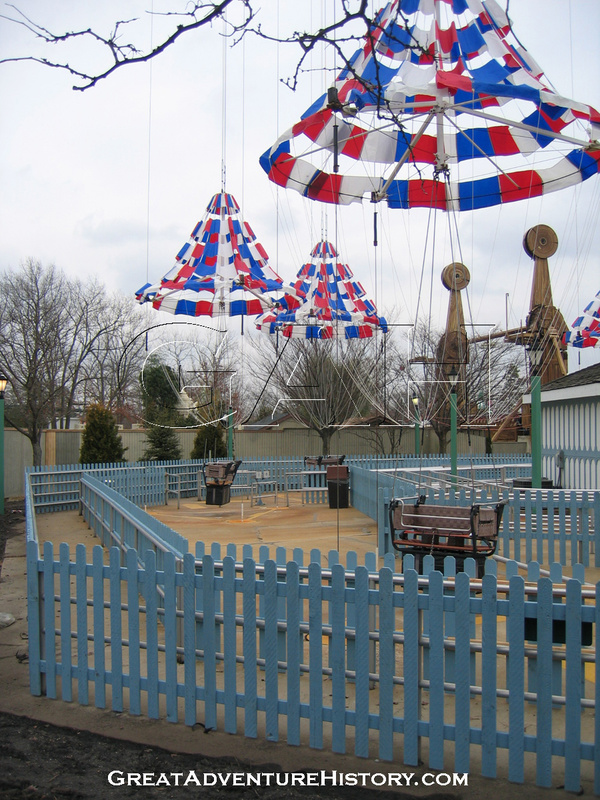 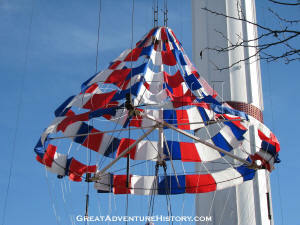 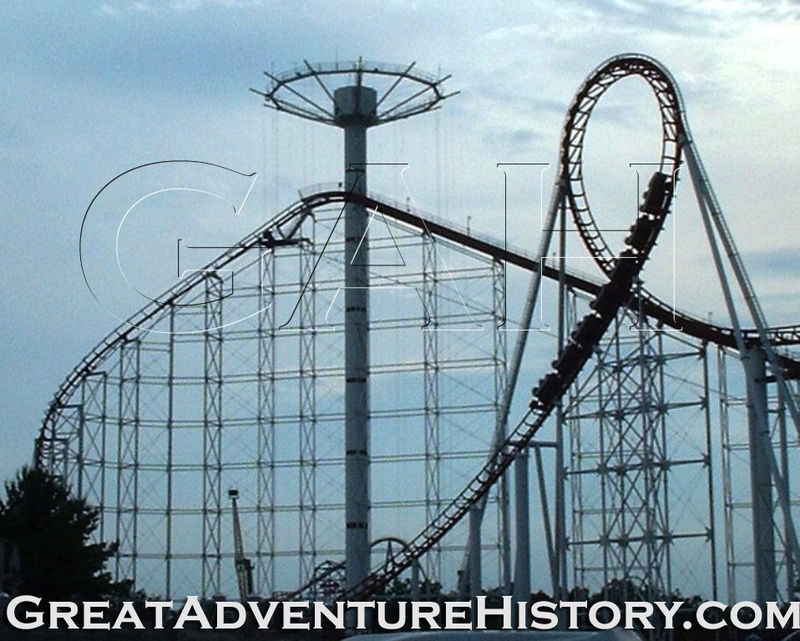 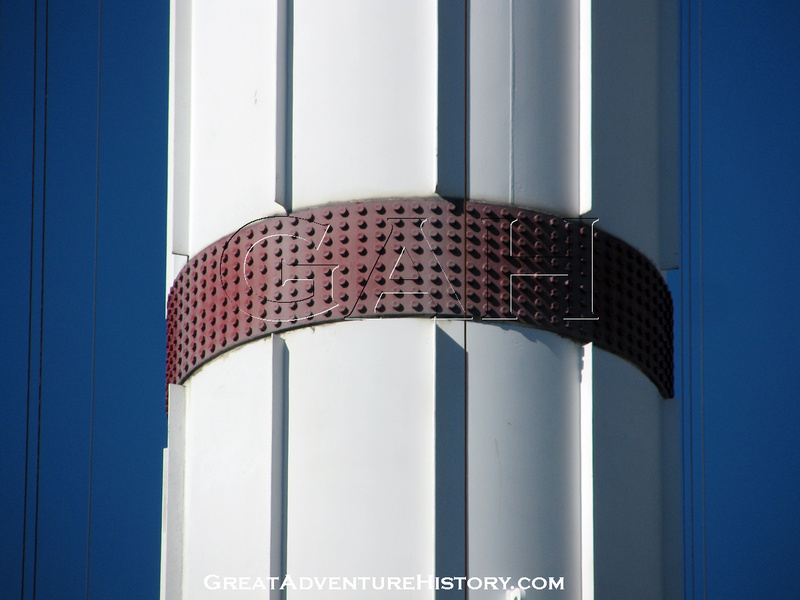 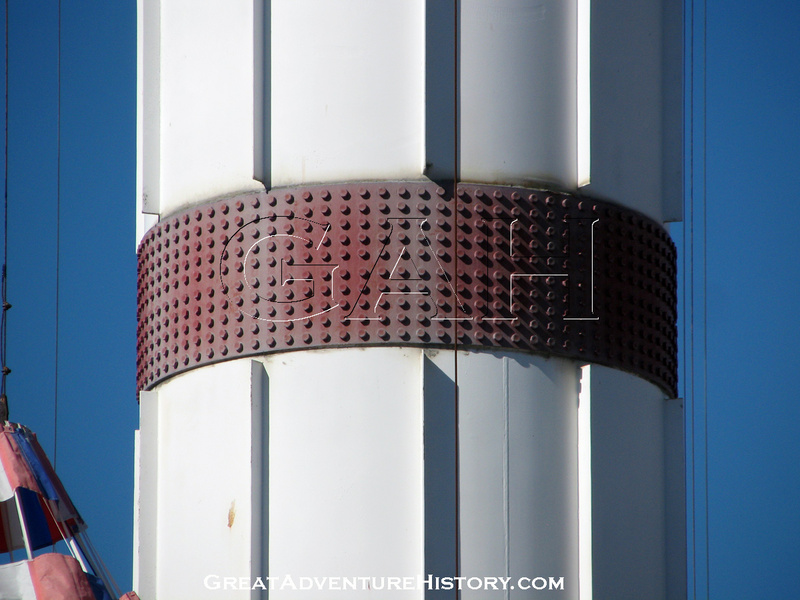 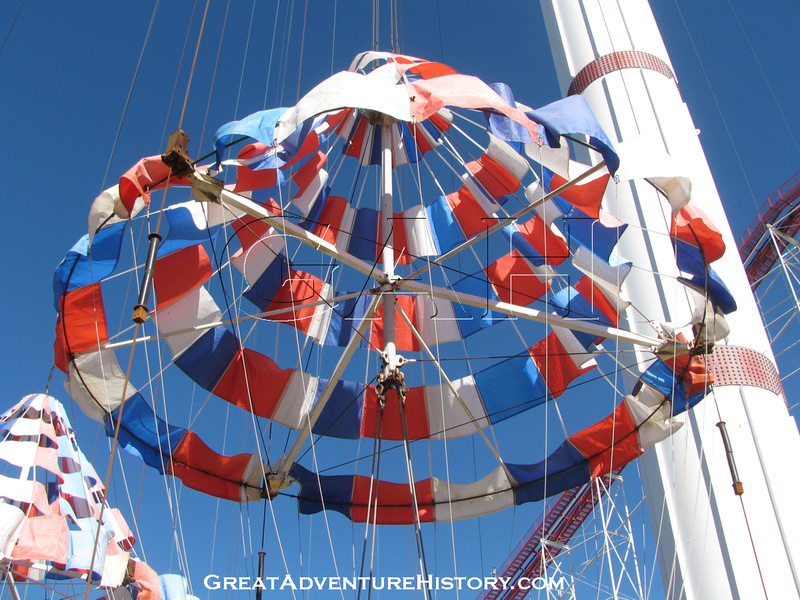 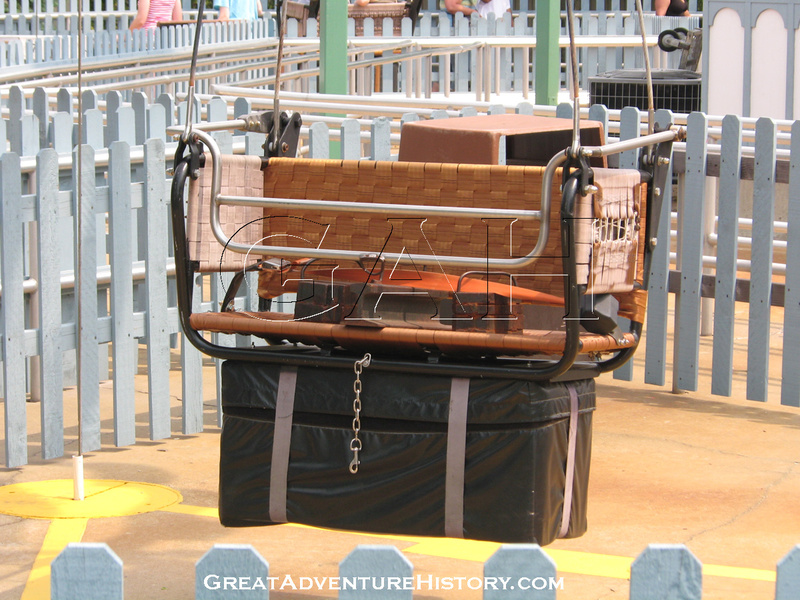 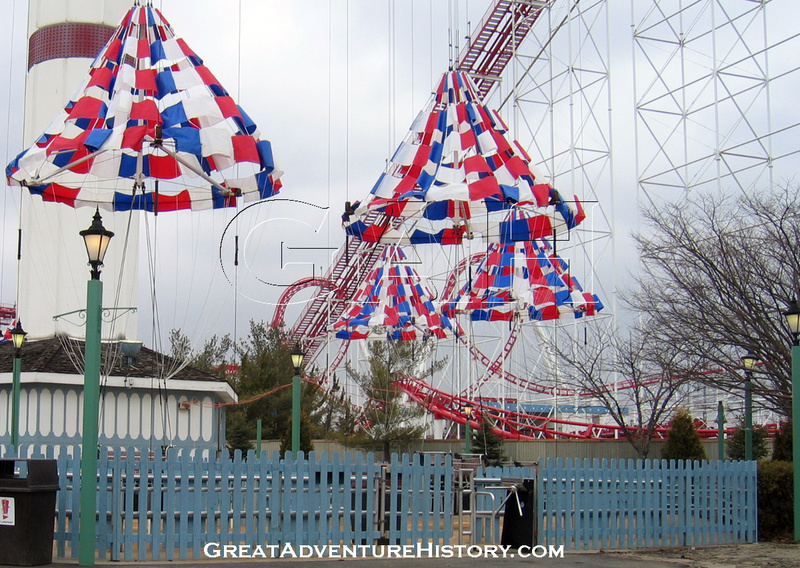 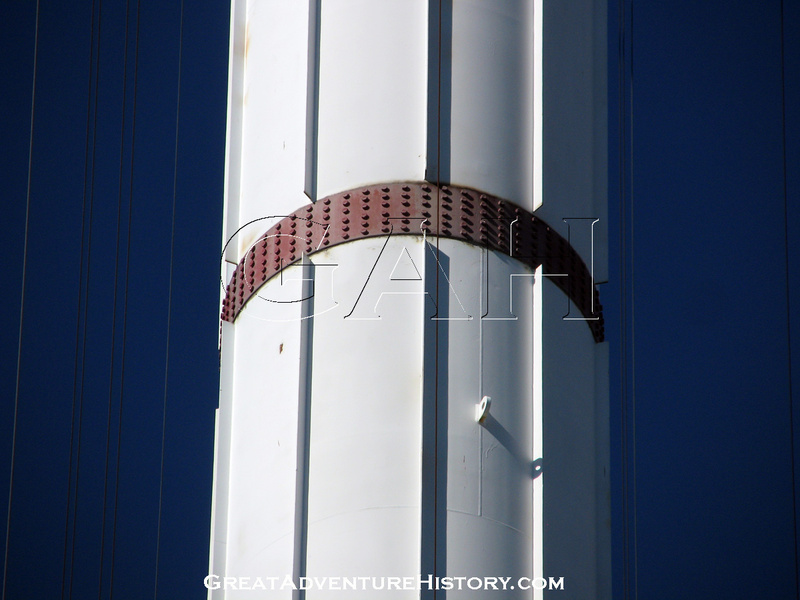 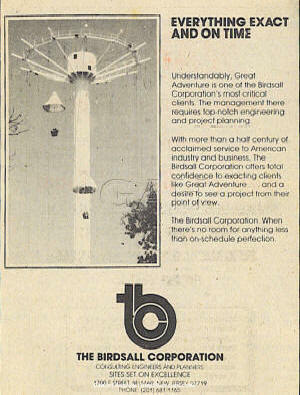 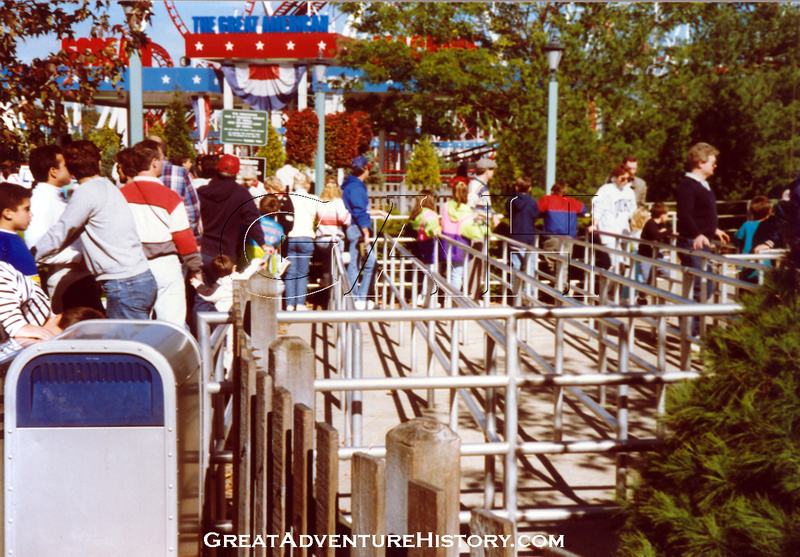 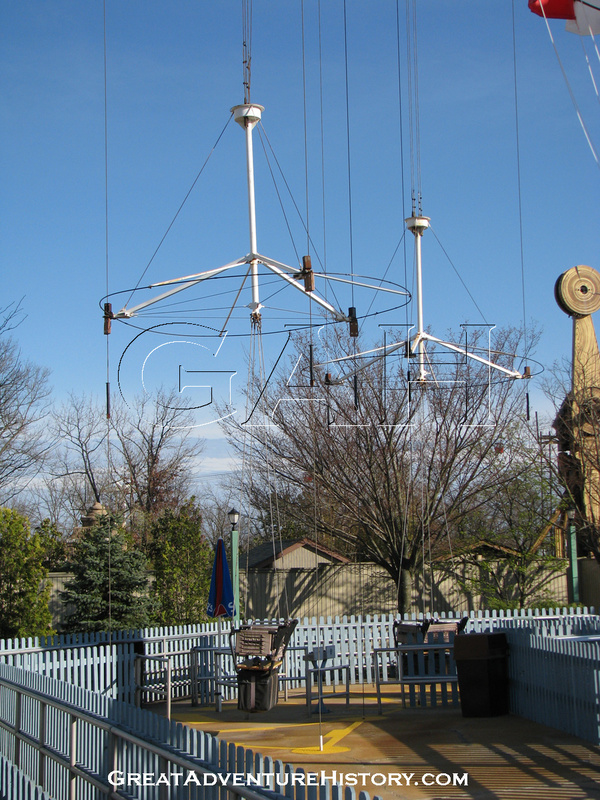 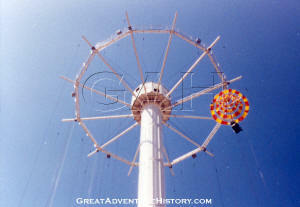 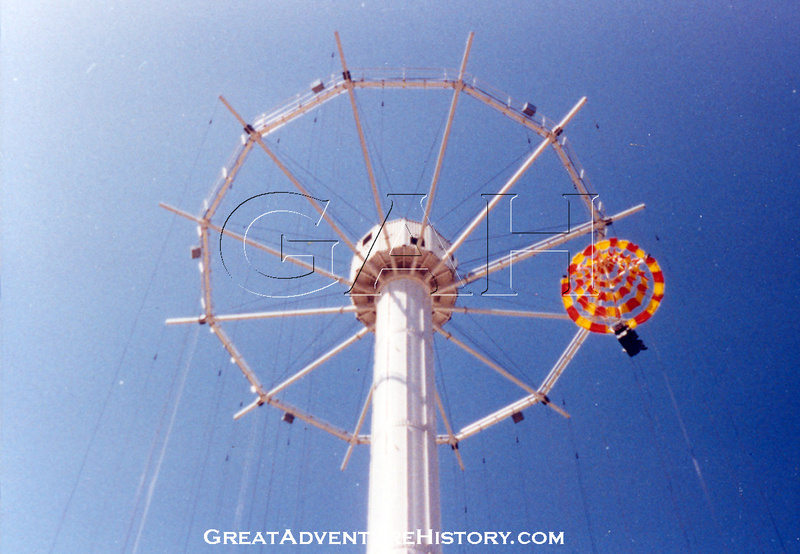 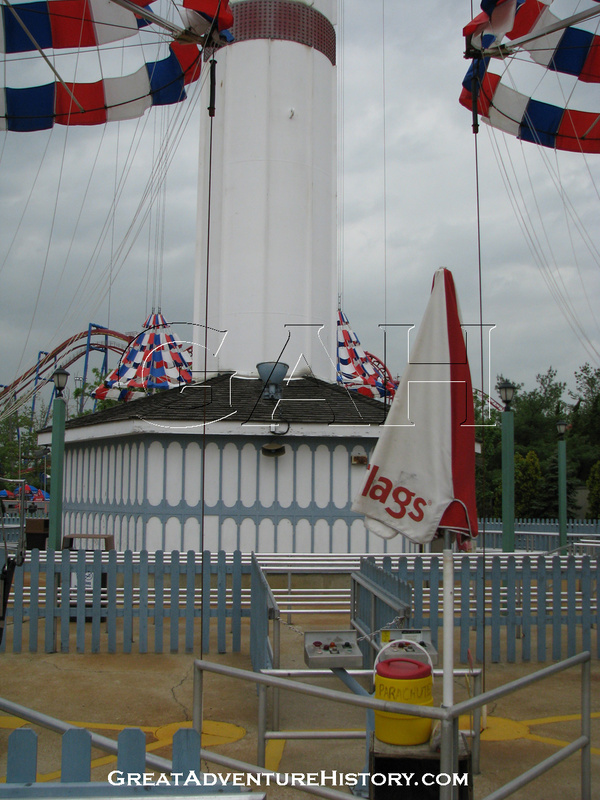 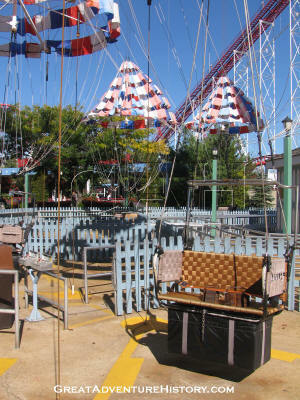 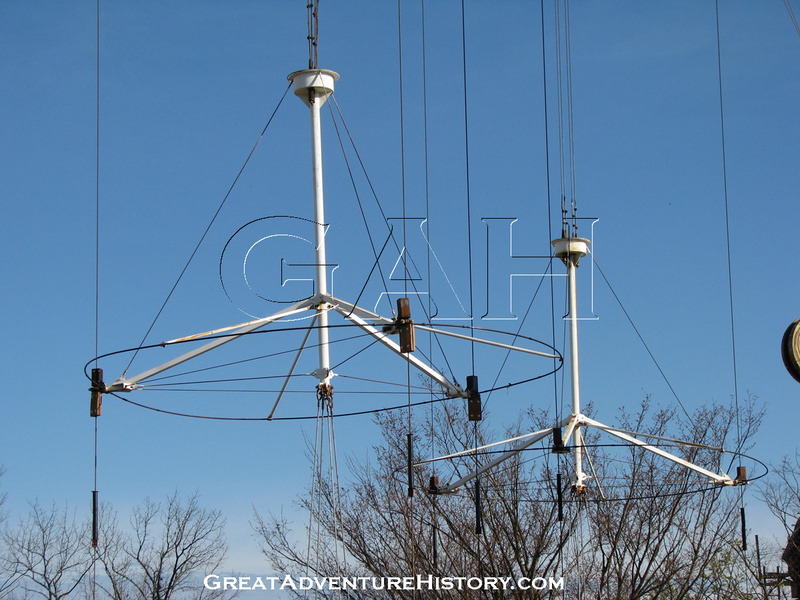 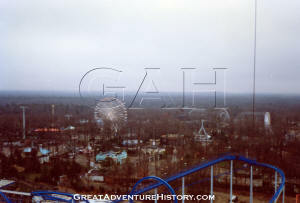 Like at St.Louis, the installation at Great Adventure was a modified version of previous models with the number of parachutes reduced from the original 12 to a more manageable eight. 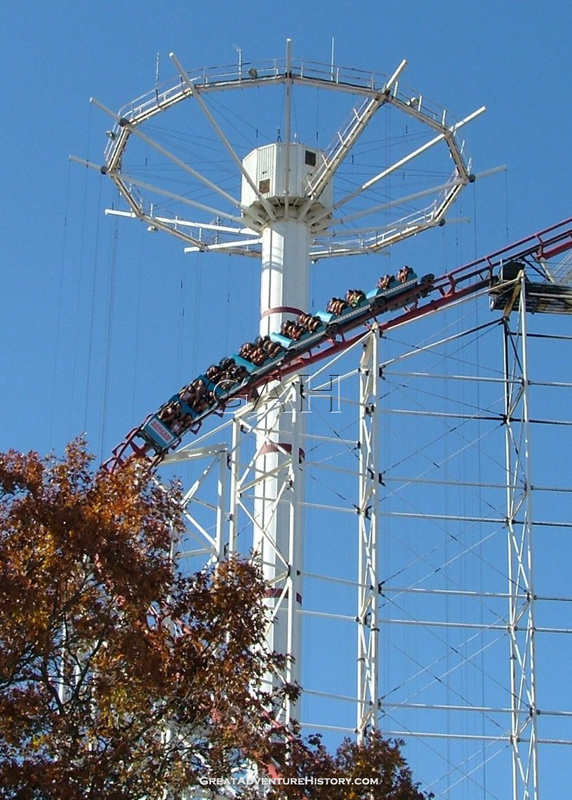 Six Flags had discovered that having 12 chutes caused operational difficulties as the counterweights inside the ride tower were positioned too close to each other causing sensors to be tripped by the neighboring weights. 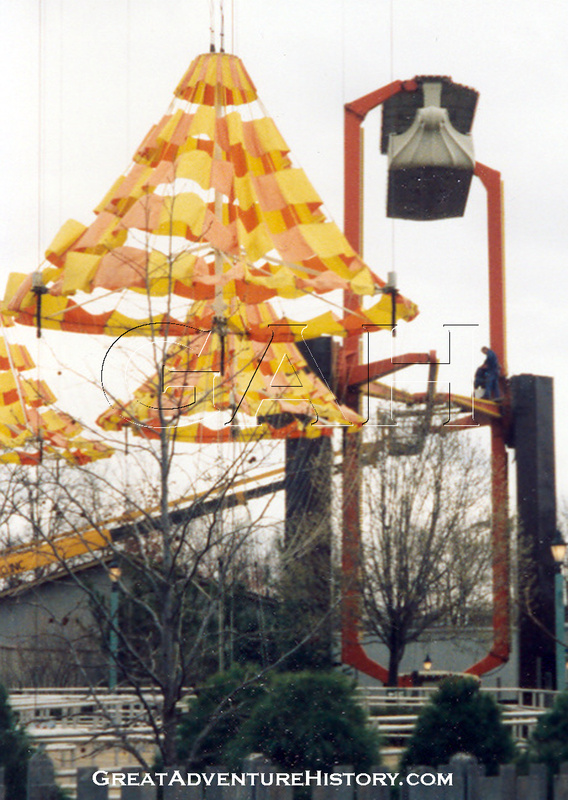 The ride was still under construction at the start of the 1983 season, with the tower in place, but the crown still being assembled. 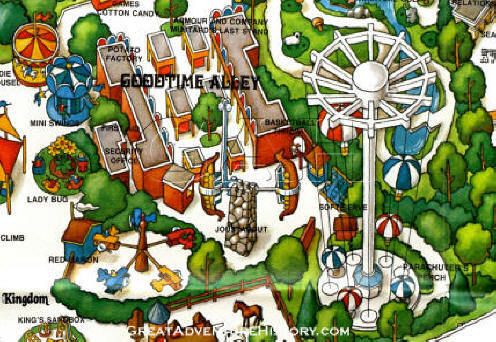 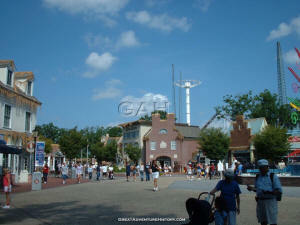 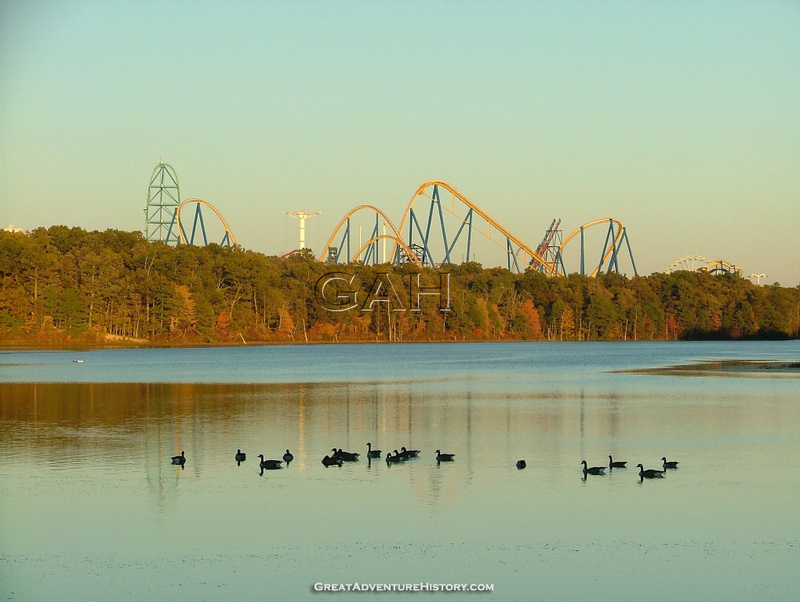 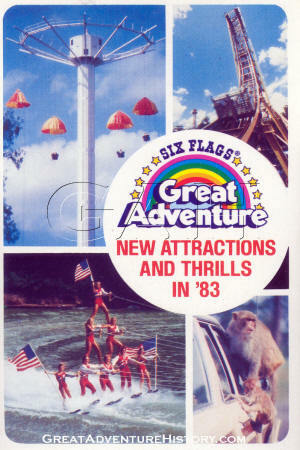 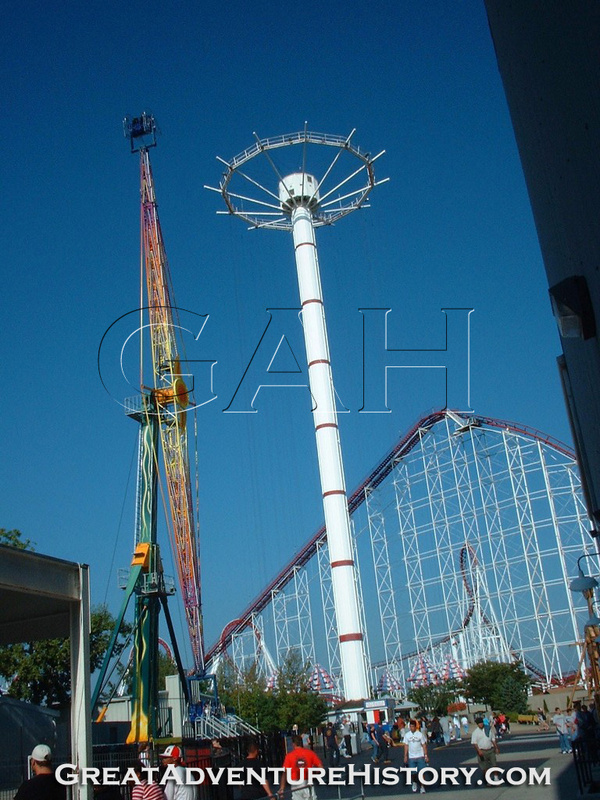 Despite the ride not being complete, postcards were already available in the park, with the Six Flags Over Texas version of the ride standing in for its taller sibling. 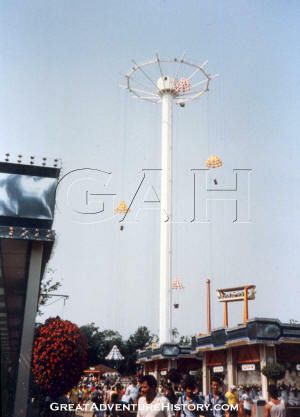 INTAMIN’s version of the parachute ride was a much more controlled experience than the originals designed in the 1930’s. 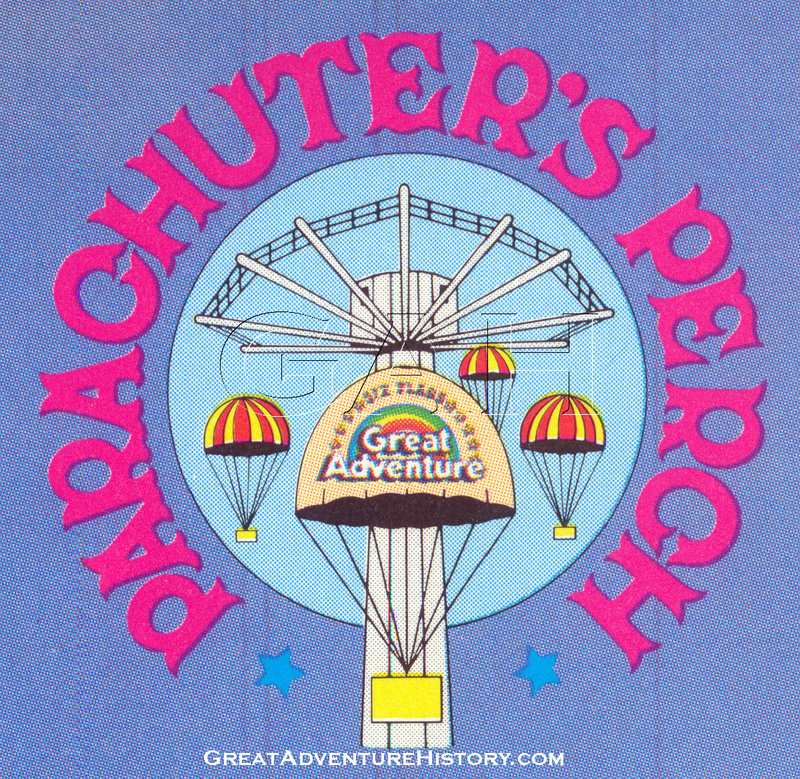 The ride did not rely on the actual parachute to control its descent, but instead a motorized cable system lowers the chutes at a constant and safe speed. 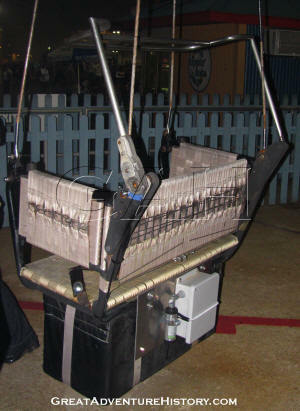 The chutes come to a stop gently as they approach the ground, unlike the original version which came to a jarring stop when the chute reached a set of springs mounted on the base of the guide cables. 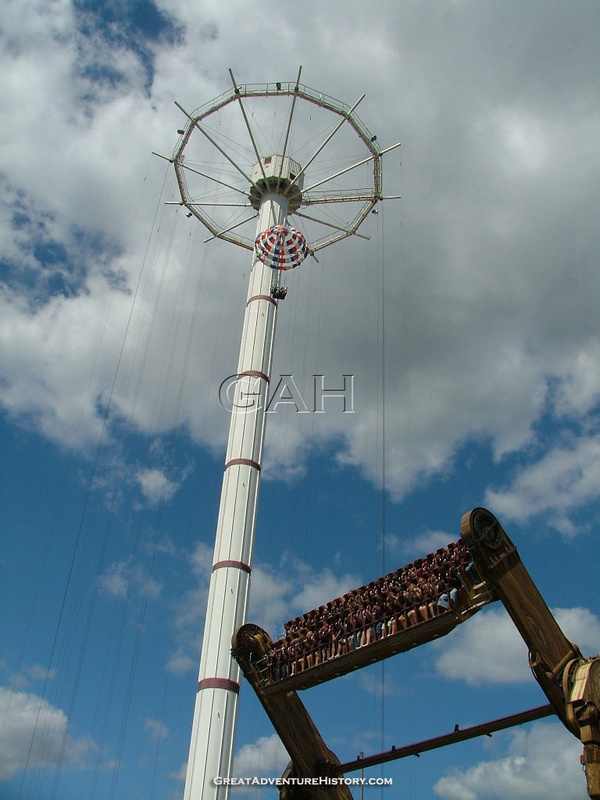 The INTAMIN version of the ride is fitted with similar springs as a safety measure. 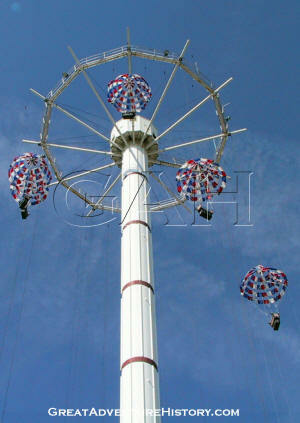 The modern version of the parachute ride is much more sophisticated than the original, with additional safety features added. 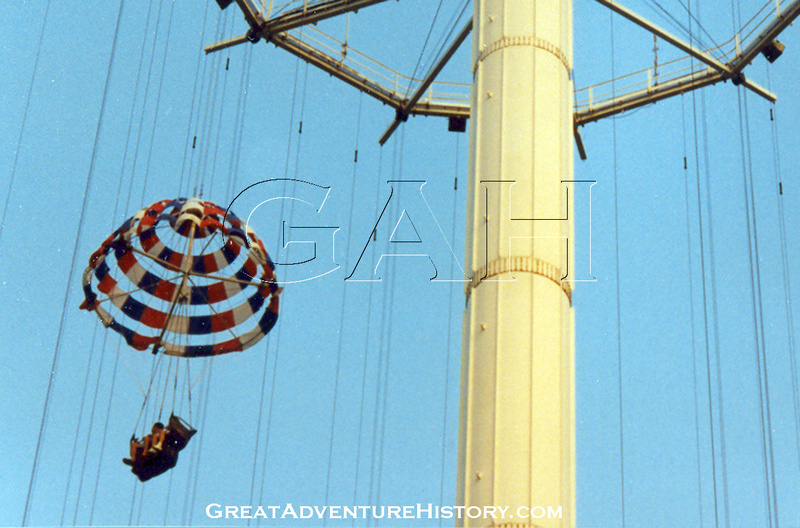 The originals required a crew of 3 to operate each chute, while the INTAMIN version allowed a single operator to run a pair of chutes. 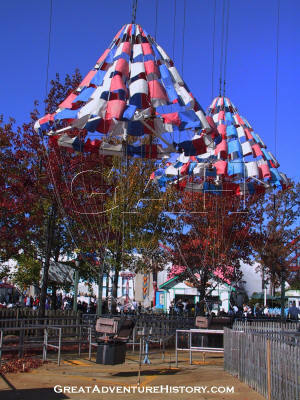 Computerized systems monitor the cable reels as the chutes raise and lower, making sure the cables do not tangle or kink as they raise and lower. Operating Restrictions: An anemometer (wind meter) monitors wind speed. 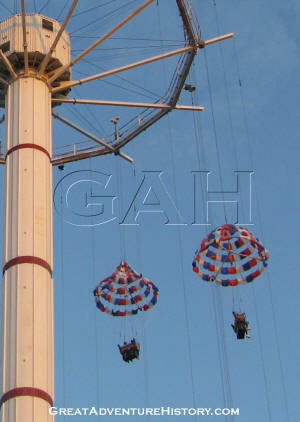 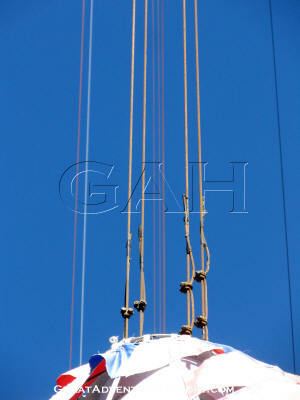 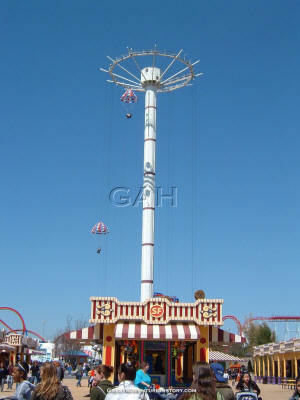 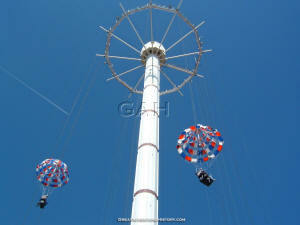 The ride features 3 guide cables for each parachute which are attached to rings on the ride’s crown. 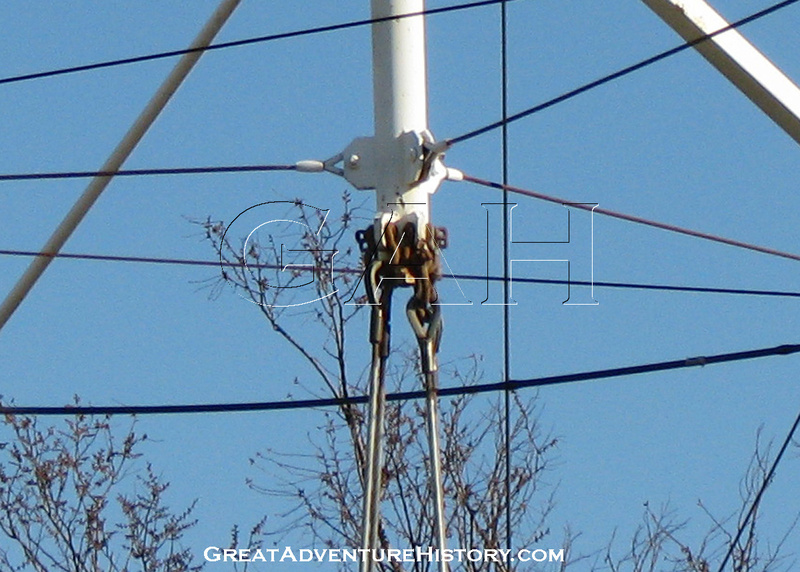 The cables appear to be attached to the ground below, but in actuality hang freely with weights at the ends. 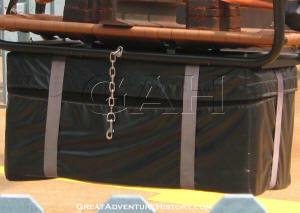 The weights each hang inside small pits, covered with steel plates. 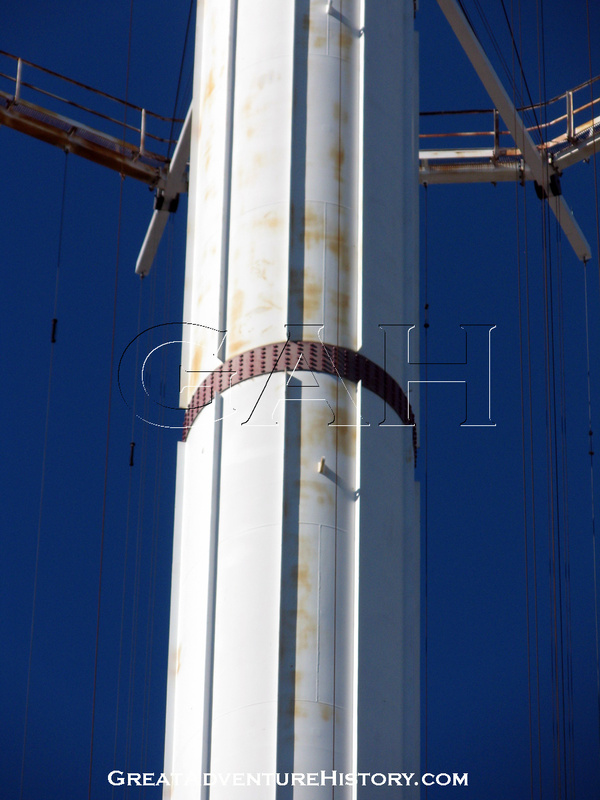 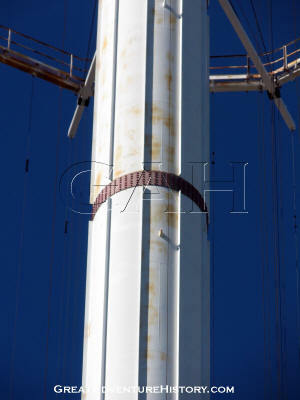 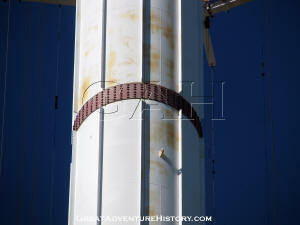 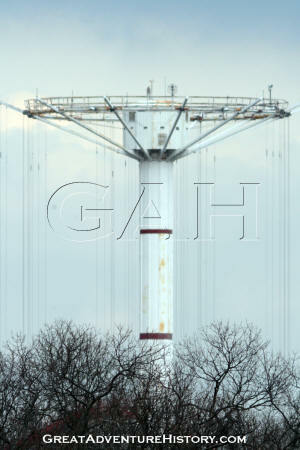 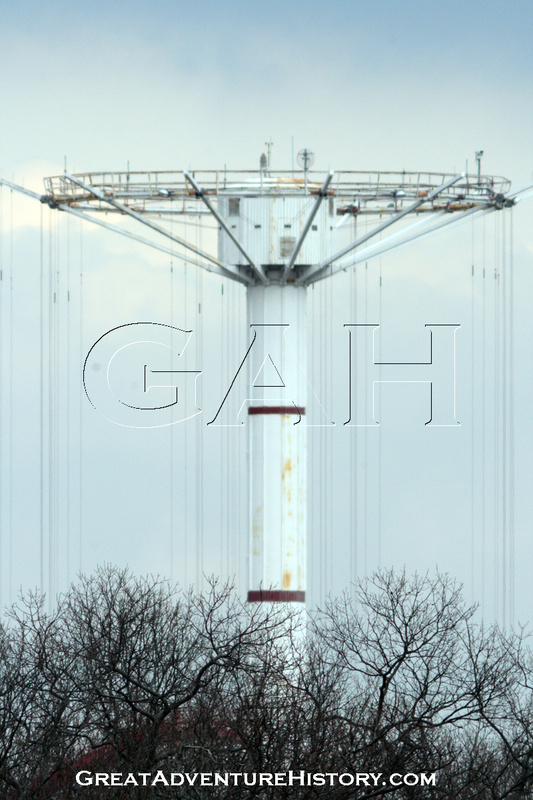 The cables are allowed to move independently as the tower sways in the wind, but still remain straight and true to guide the chutes as they raise and lower. 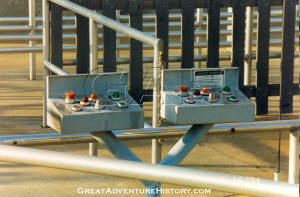 The ride cycle is automated, with an operator simply needing to press a dispatch button and send the ride vehicle up and then back down. 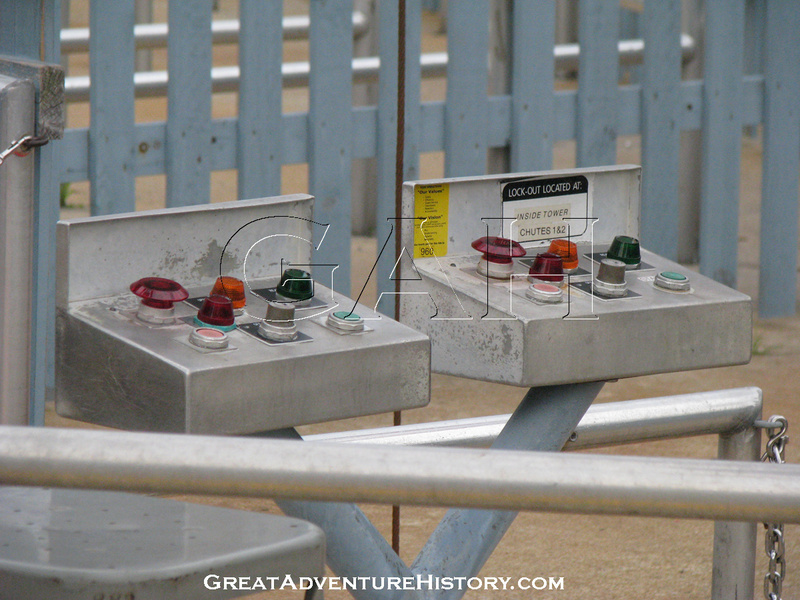 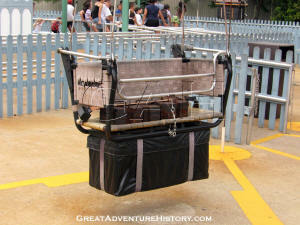 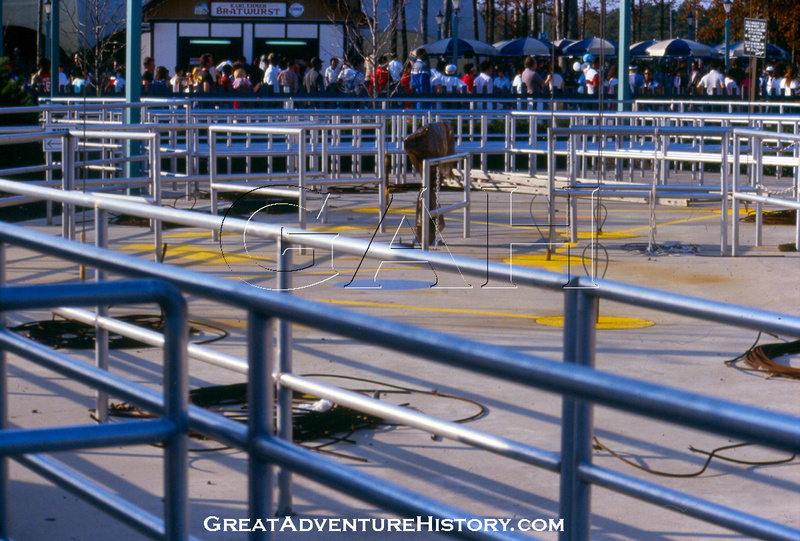 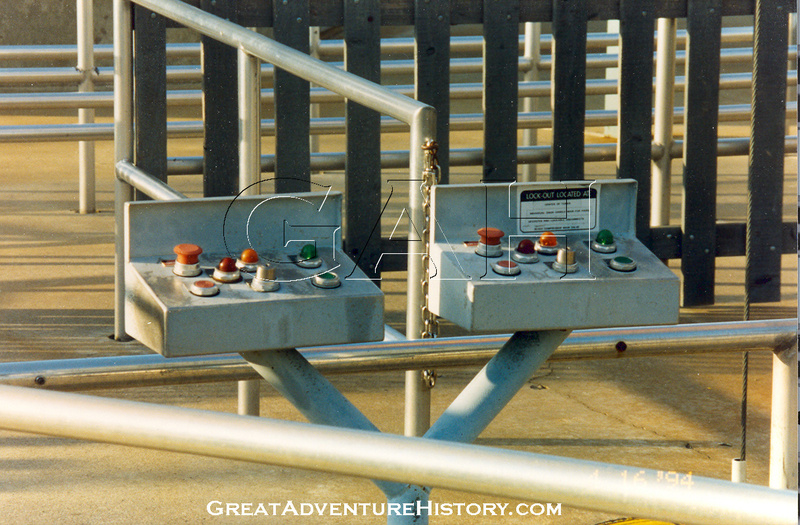 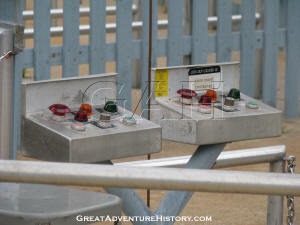 The dispatch buttons were later replaced with a magnetically activated switch that the operator holds to the panel when the restraints have been checked, preventing any unauthorized button pushing on the ride operator panel. 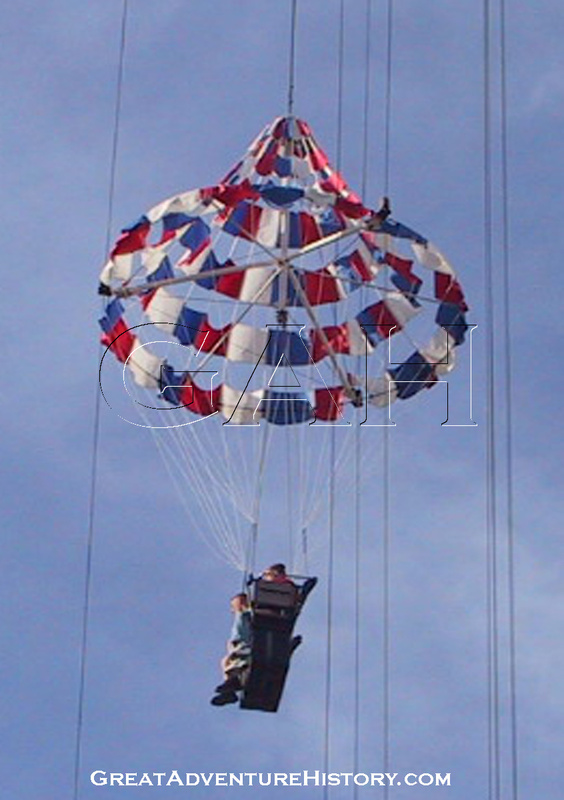 The chutes can also be manually raised and lowered when necessary. 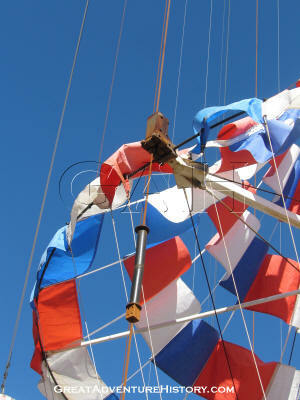 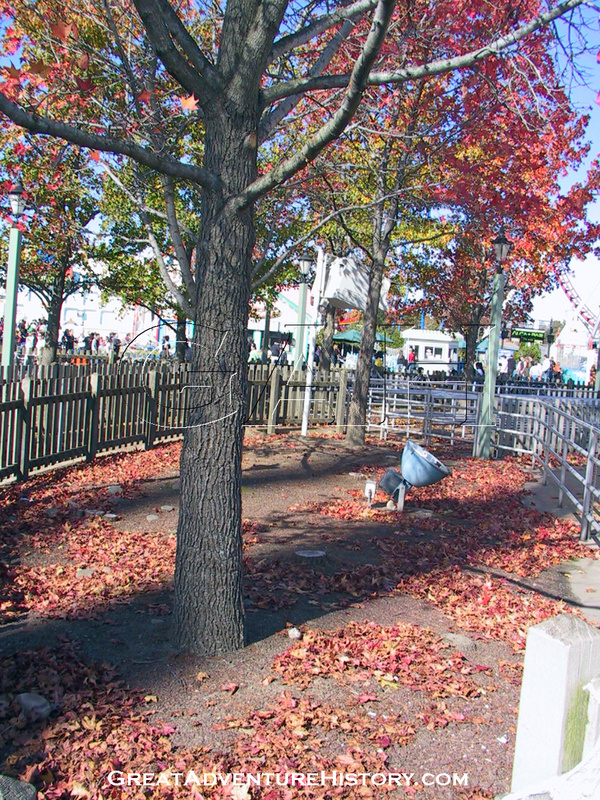 Occasionally the rides computer system will stop a chute as it raises or lowers if a problem is detected with the cables as they roll onto or off of the winches. 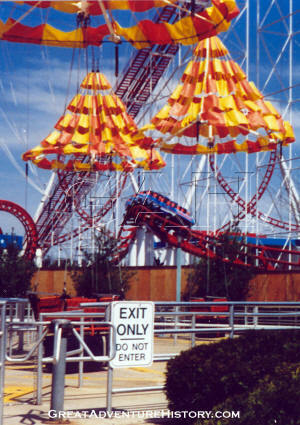 In the event of a lengthy stoppage, park personnel can use the second chute of the pairing to get up to the point where the riders are stranded and reassure them. 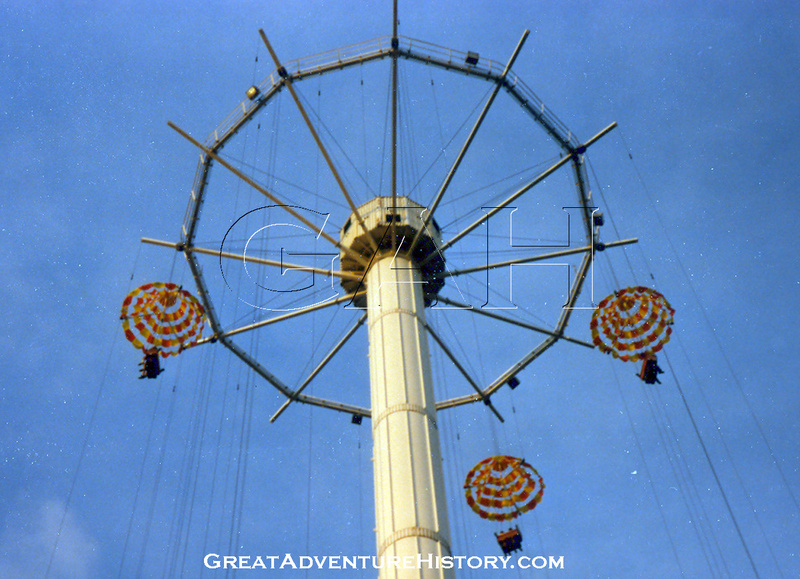 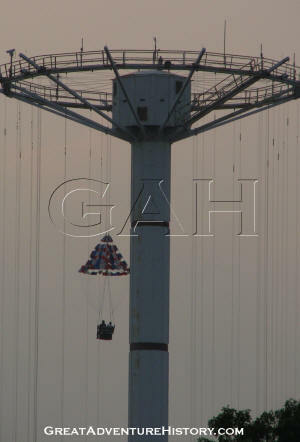 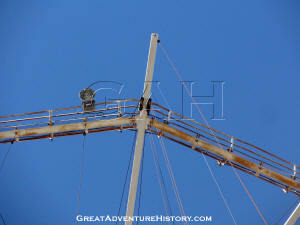 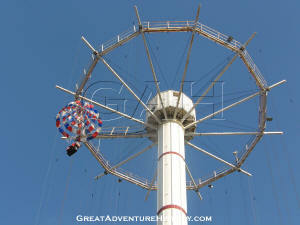 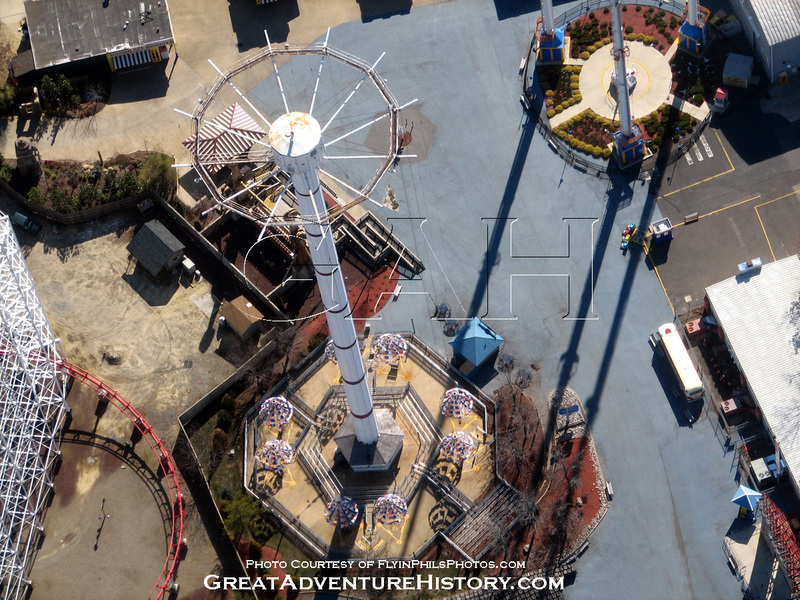 When the Great American Scream Machine made its debut for the media, the parachutes facing the coaster were used by the news media to get pictures from above, manually raising and lowering the cameramen covering the event. 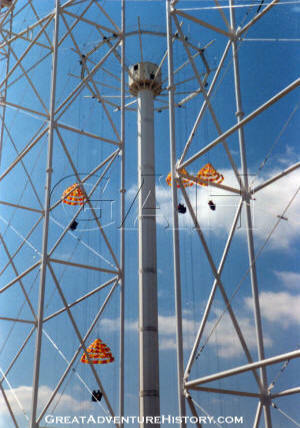 The ride’s tower is comprised of 8 steel sections held together with rings of bolts. 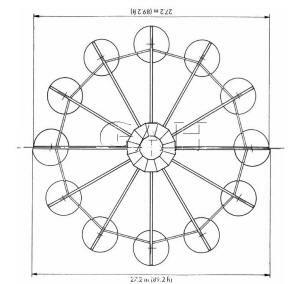 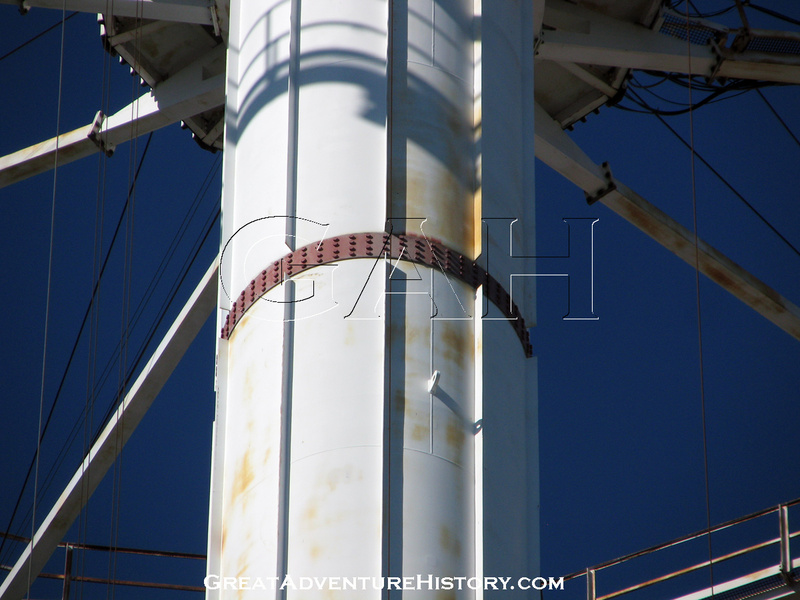 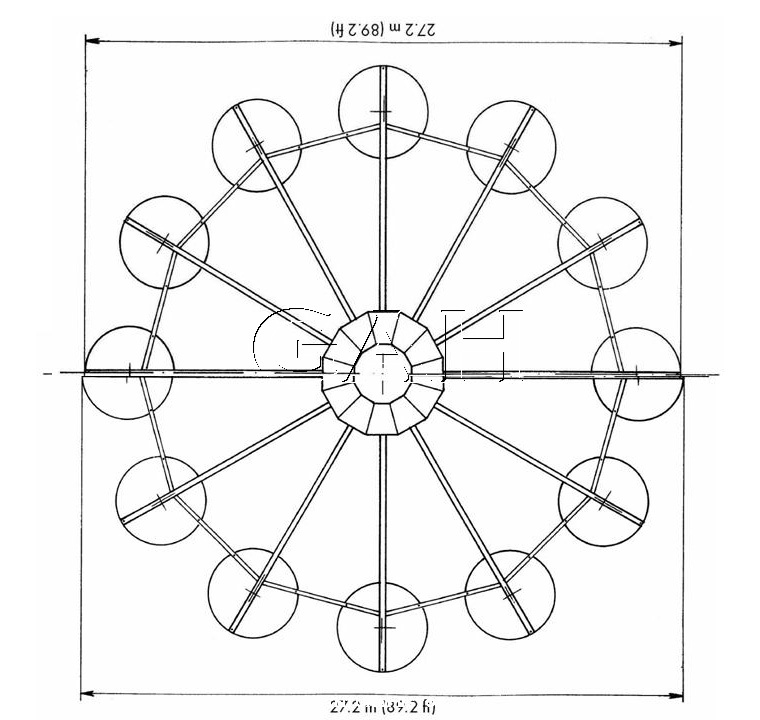 With each section of the tower, there are fewer rows of bolts on the connecting ring, with 10 rows of bolts between the the lowest sections and only 4 rows connecting the uppermost two sections. The towers built for Six Flags Over Texas and Six Flags Over Georgia were both shorter by one section, giving the Parachuter's Perch the record for the tallest. Each tower section features 2 pairs of steel ears used for raising them into place with a crane. 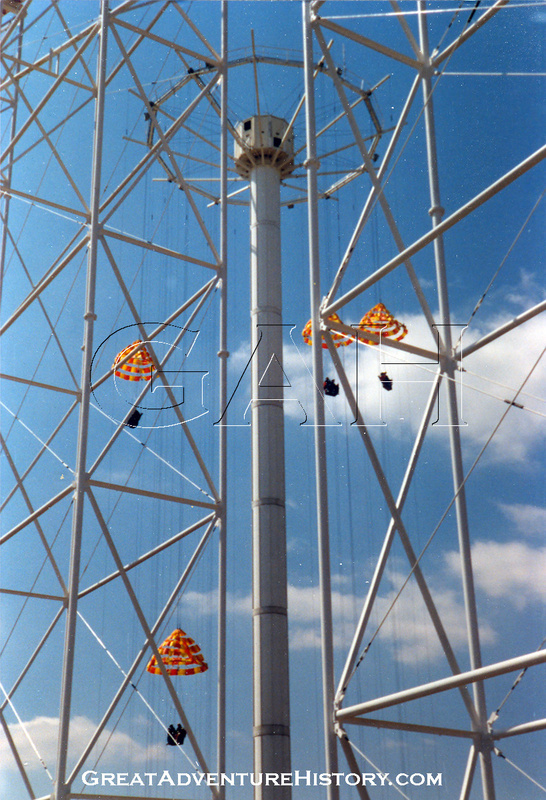 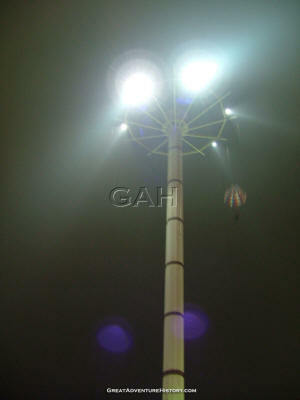 The same ride tower design is used by INATMIN for building observation towers and drop towers, with a hollow core which can house a counterweight for the larger observation and drop car vehicles as well as access ladders. In the case of the parachute rides, a two person elevator was installed, allowing maintenance and ride personnel to access the winch motors and sensor arrays. 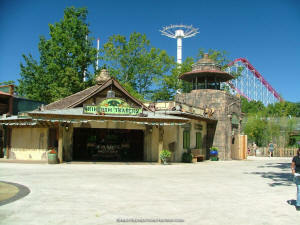 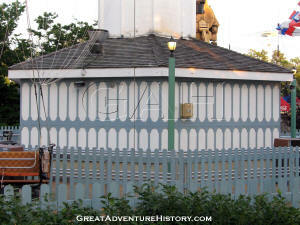 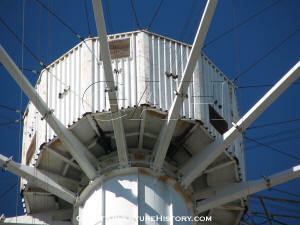 The mechanical workings of the ride are located in a small enclosed structure at the top of the tower. The top of the ride features a twelve spoked crown with a catwalk ring around the outside accessed by a catwalk through a door on the central structure. Each of the parachutes utilizes 4 steel cables to raise and lower the ride vehicles. 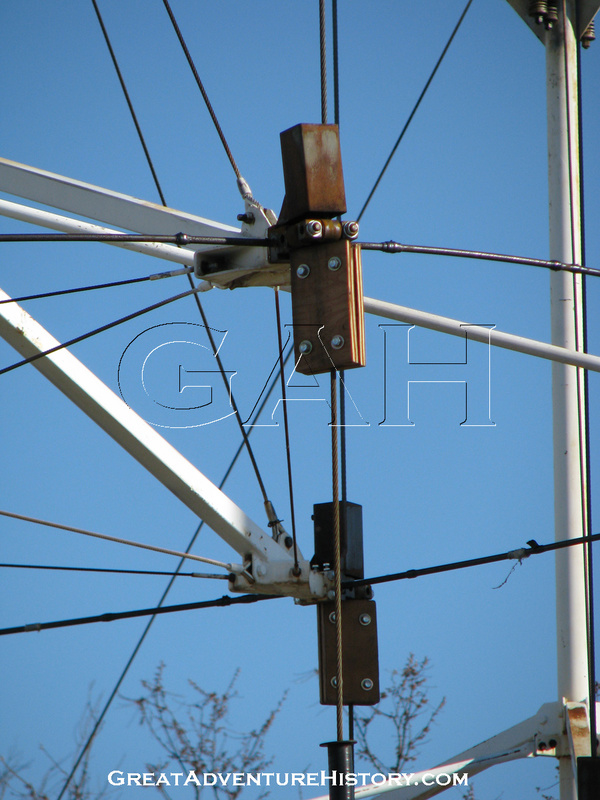 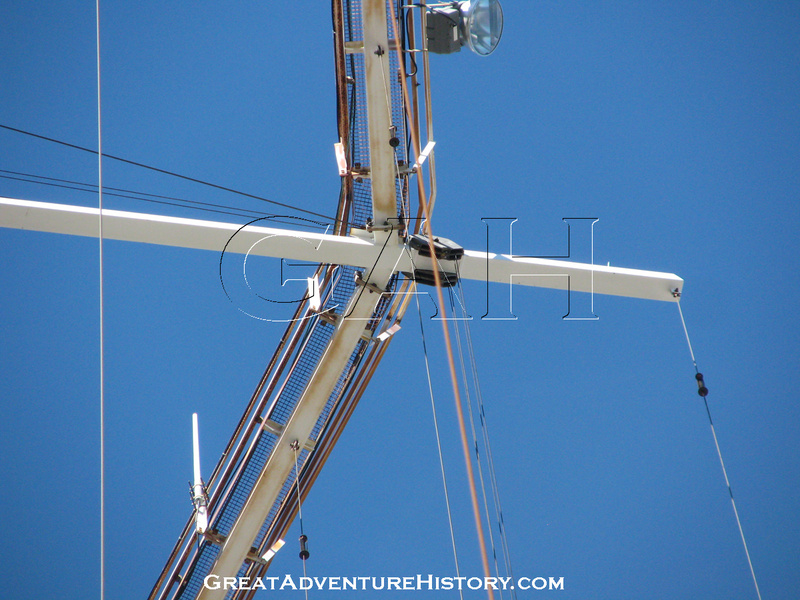 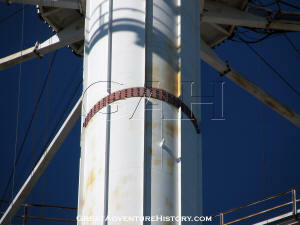 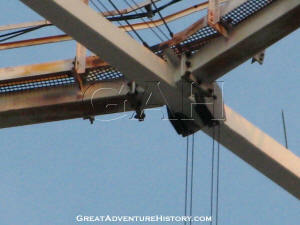 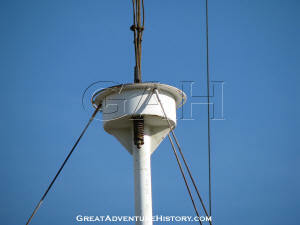 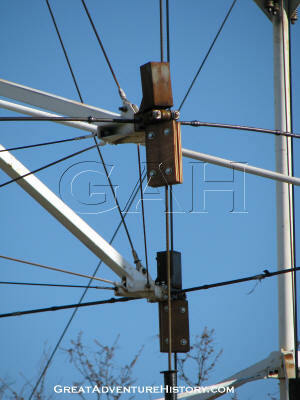 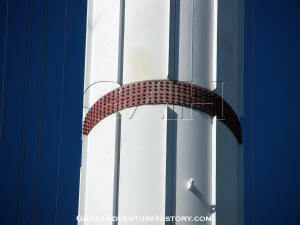 The cables run out from the center structure through holes out to pulleys located on the ends of the spokes. 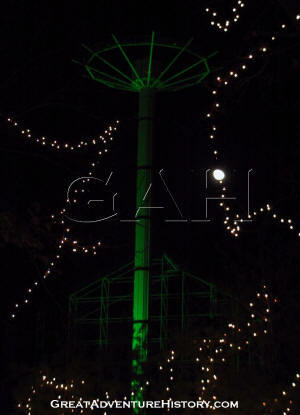 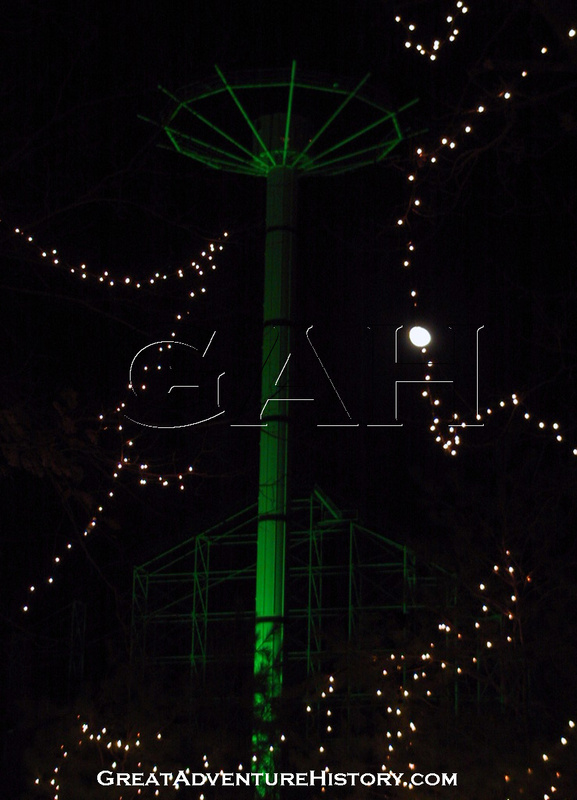 The Parachuter’s Perch is visible throughout the park both day and night. 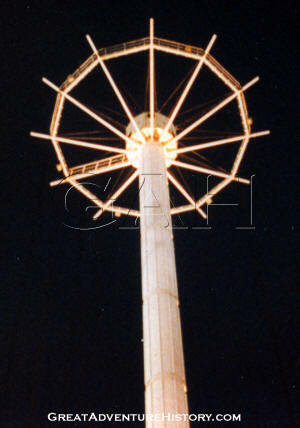 Originally the white tower stood out against the blue sky, and at night was lit with gold spotlights. 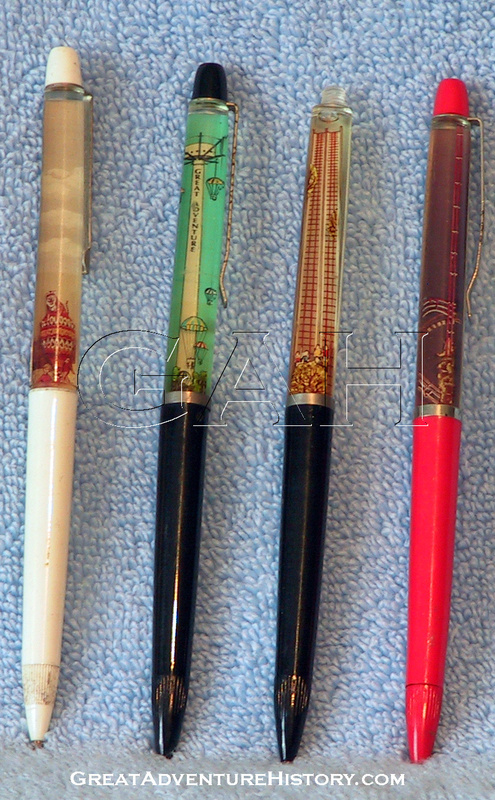 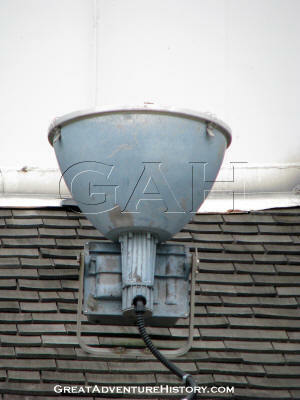 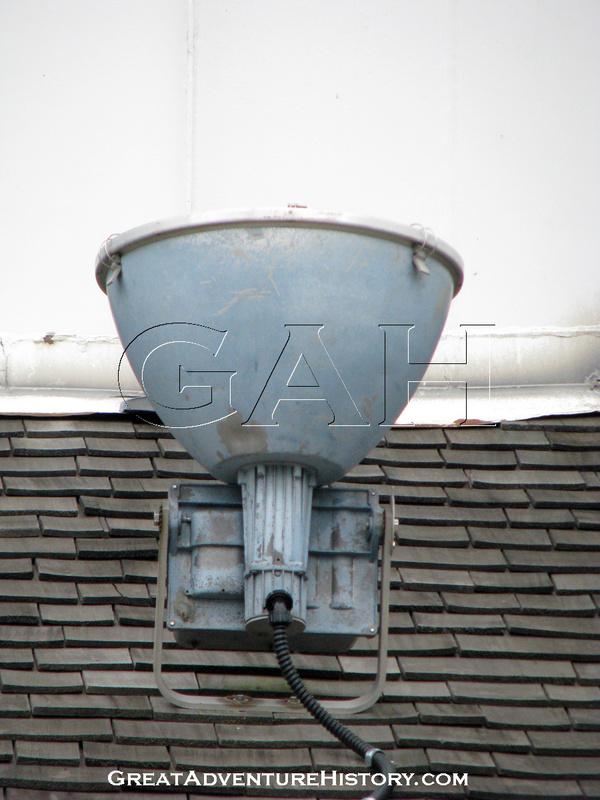 Over the years, the gold lights became standard blue tinged mercury vapor lights. 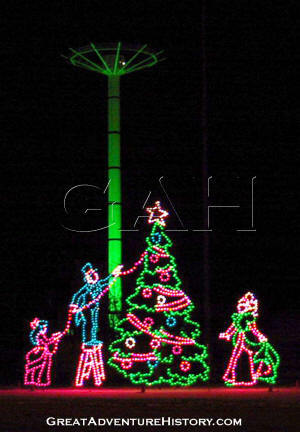 For the two seasons of Winter Lights, the lighting was changed to green, standing as a backdrop to the lights of the Victorian Village section of the show which snaked through the main parking lot. 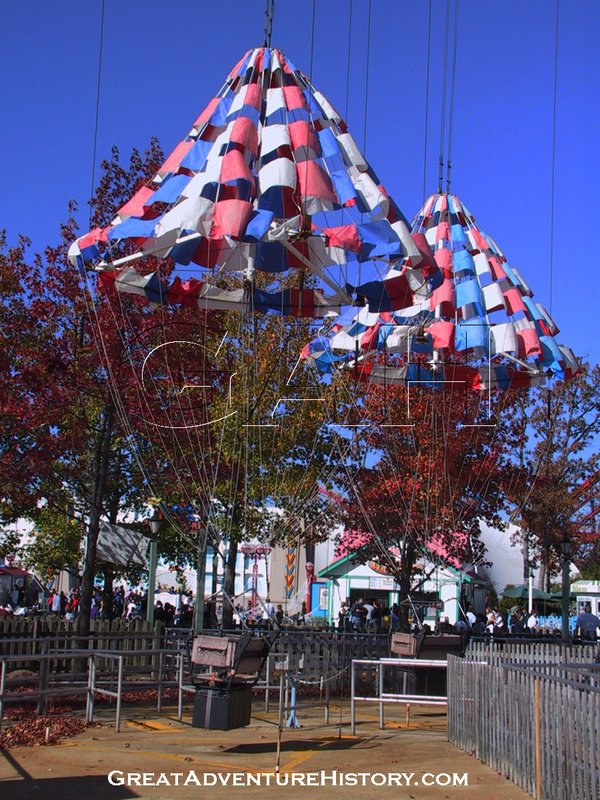 The parachutes on the ride are strictly decorative, allowing air to pass through them to not interfere with the speed of the descent. 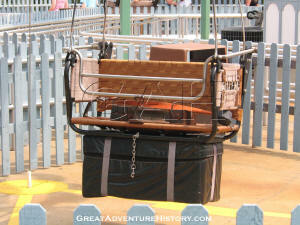 Ride vehicles are weighted with the large packs under the seats holding ballast to insure proper operation. 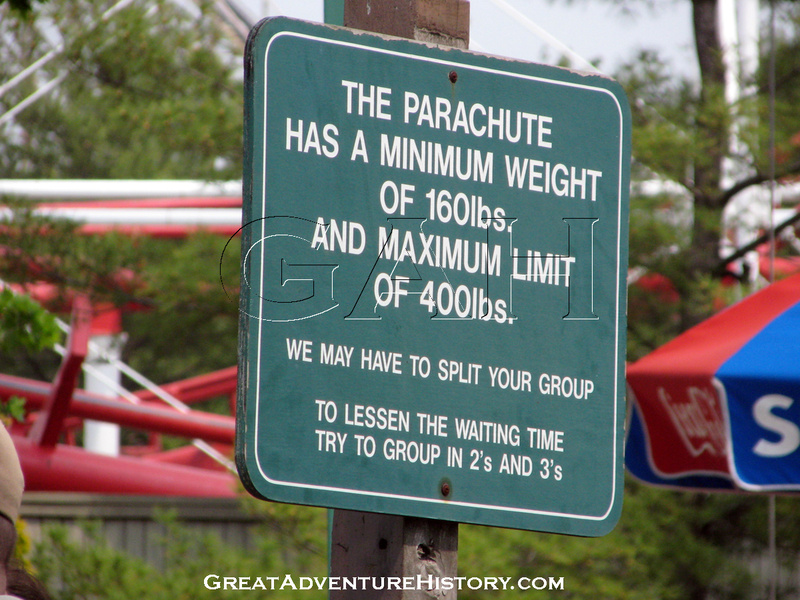 In addition, the combined weight of the riders must be between 160 and 400 pounds. If the weight of the passengers exceeds the 400 pound limit, the chute will not lift. 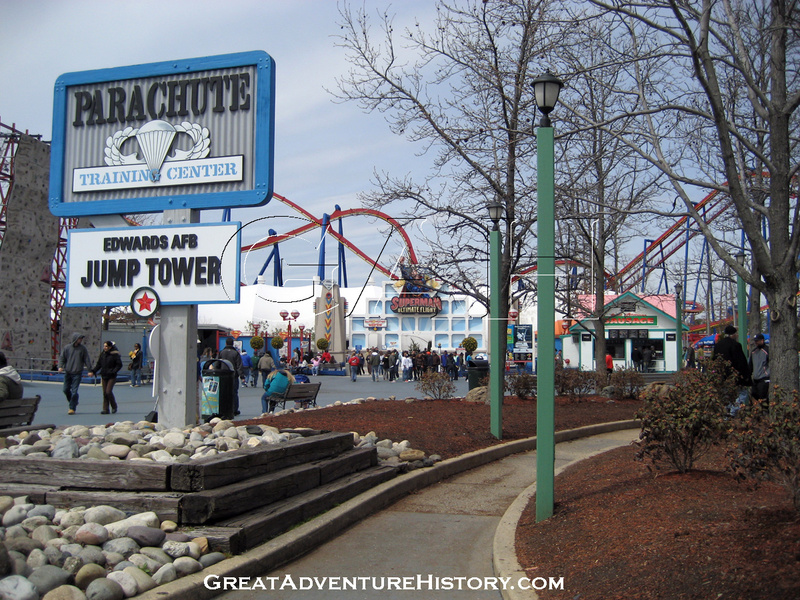 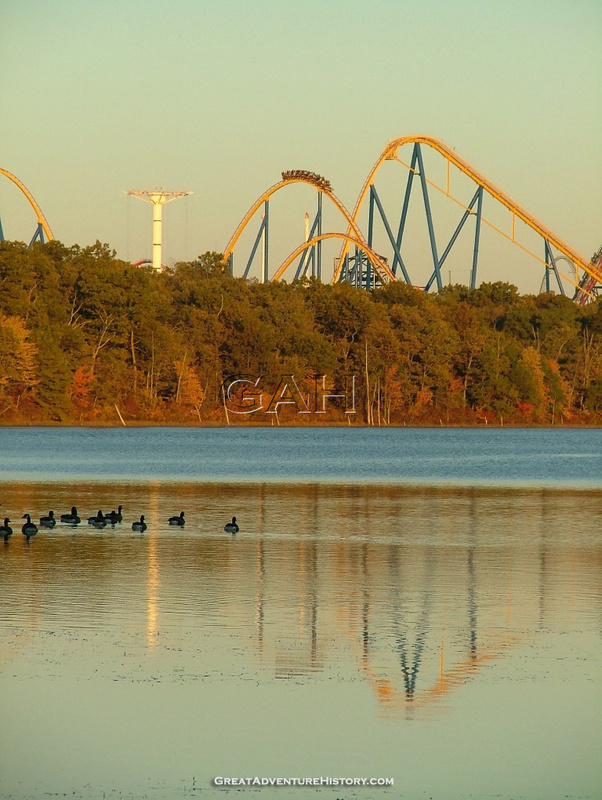 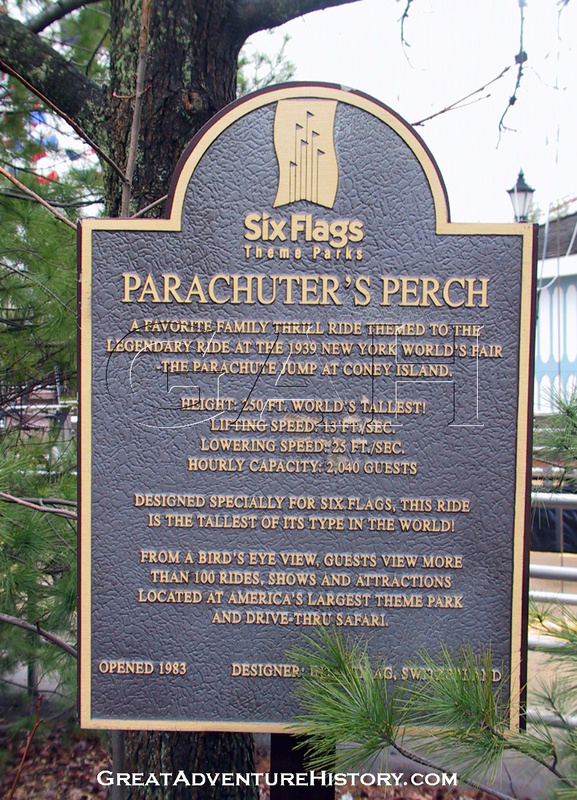 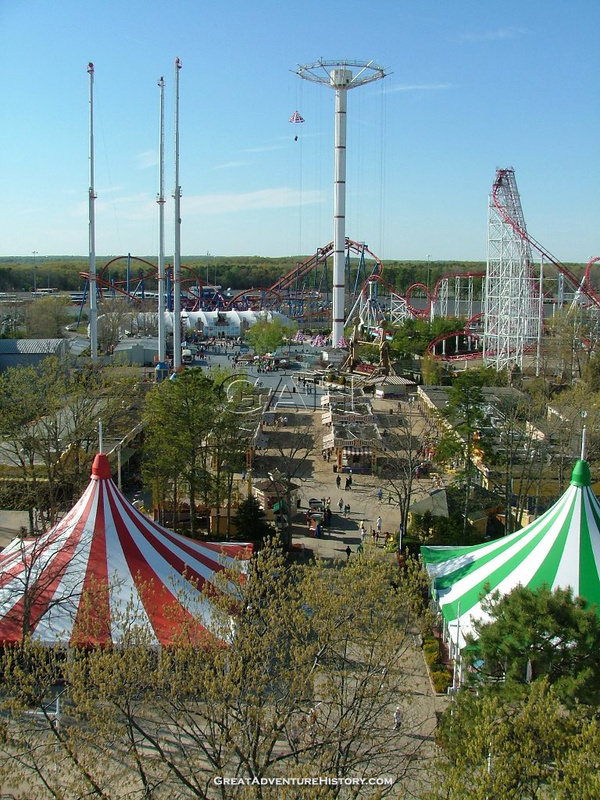 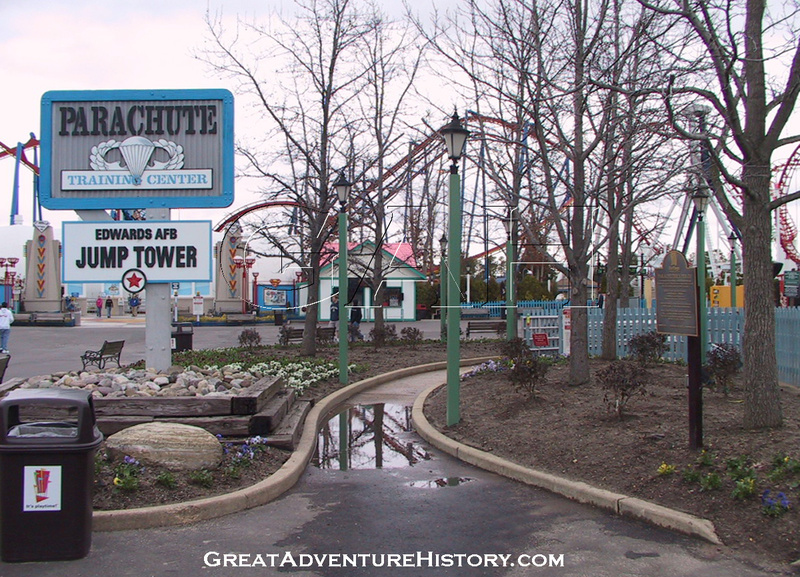 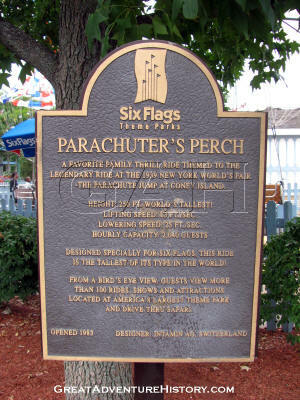 From 1983 until 2005, the Parachuter’s Perch stood as the tallest ride in the state of New Jersey until it was surpassed by Kingda Ka. The tall tower structure offers spectacular views of the surrounding area, with the huge Hangar 1 building at Lakehurst Naval Air Station, designed to house dirigibles clearly visible on most days, with the ocean visible of clear days. 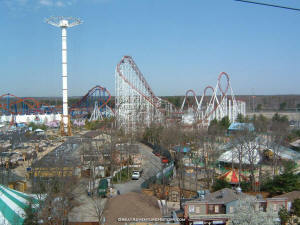 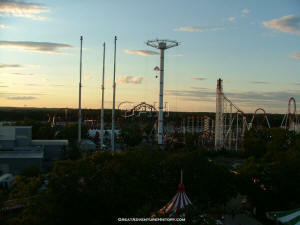 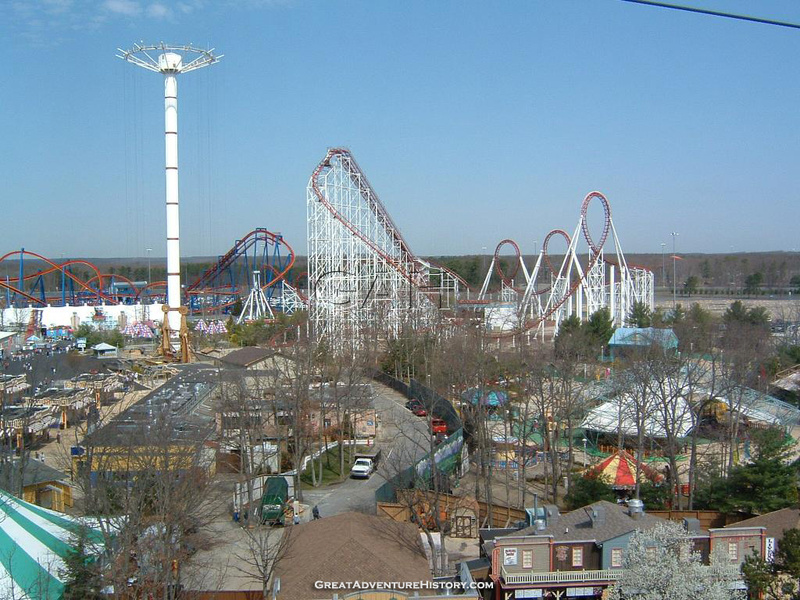 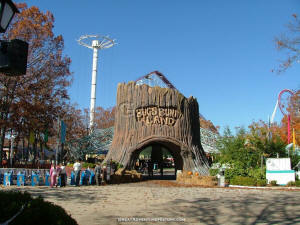 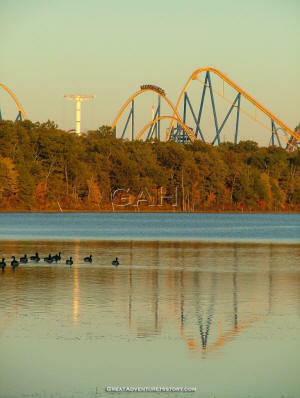 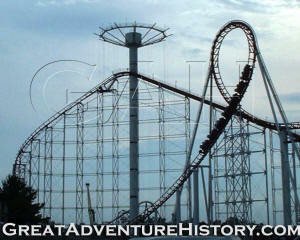 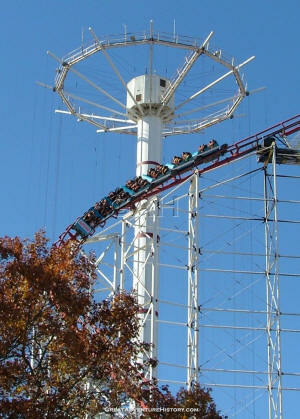 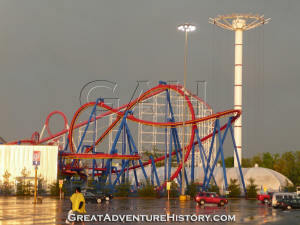 The ride can also be seen from a height from both the coast and from the Delaware River. 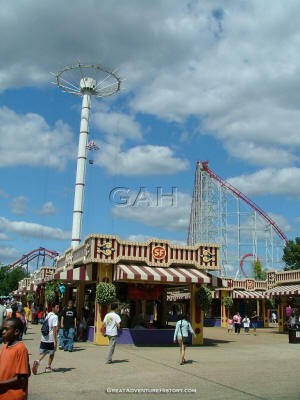 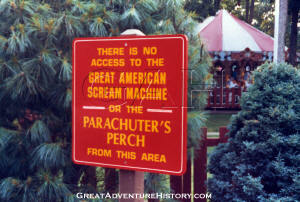 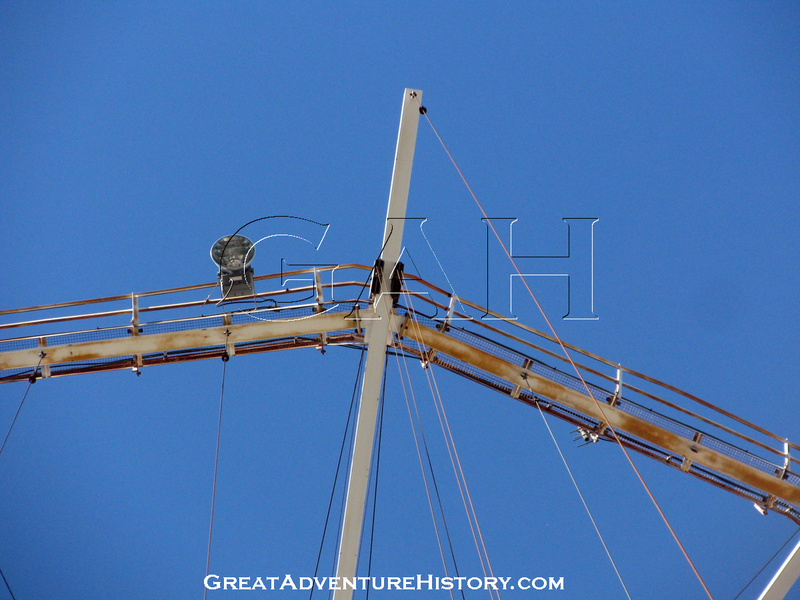 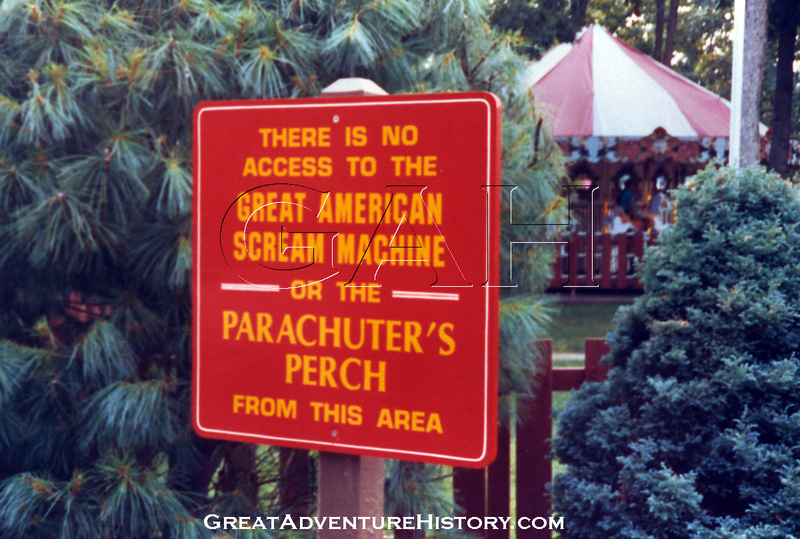 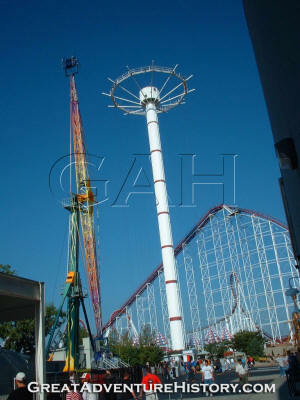 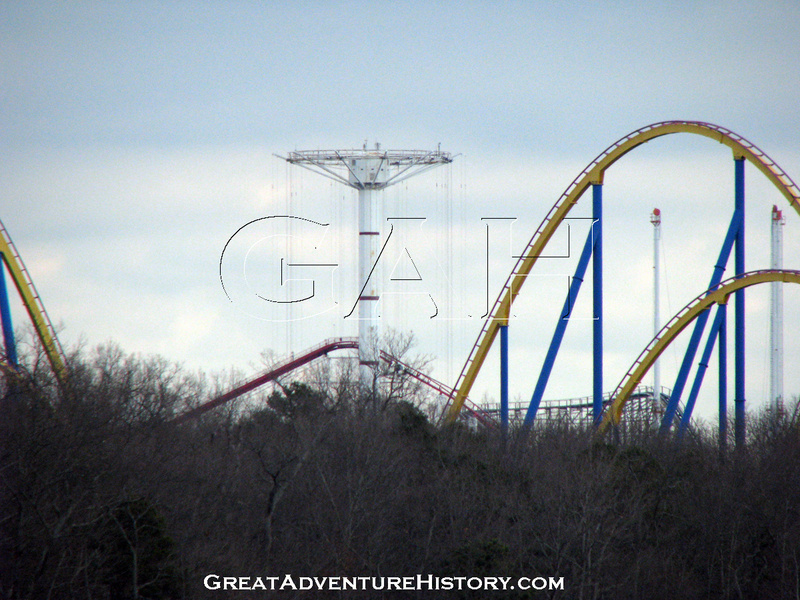 The addition of the World Record setting Great American Scream Machine next to the Parachuter’s Perch emphasized the height of the tower, still looming high above the lift hill. 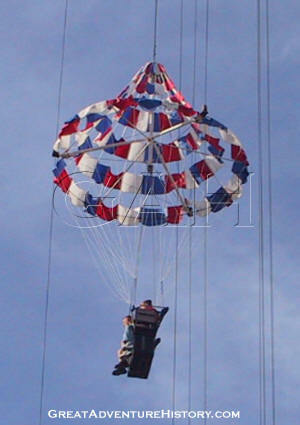 The biggest operational problems experienced by the Parachuter’s Perch have involved weather which is subject to closure when wind gusts exceed 26 MPH. 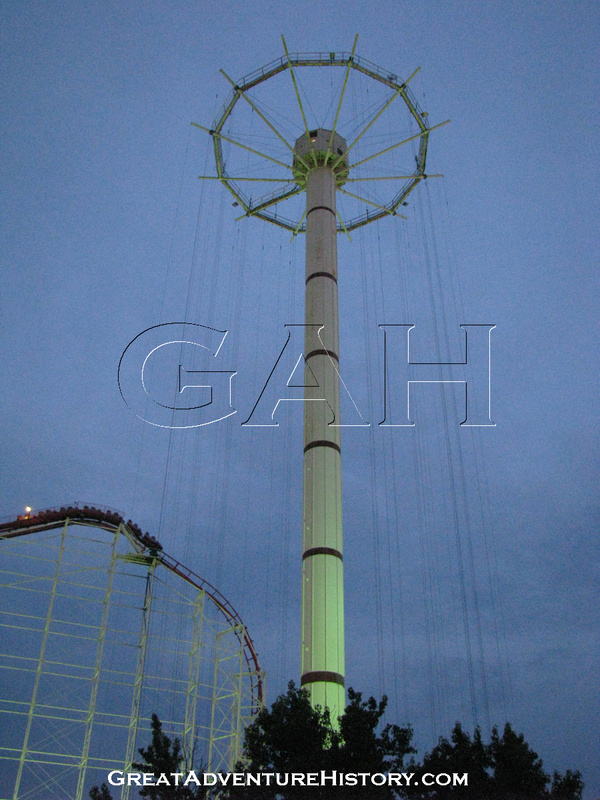 Being a large steel structure, it also acts as a lightning rod in thunderstorms, and the ride closes when lightning is detected within 20 miles. Ironically, the ride itself is rarely damaged by lighting, but the neighboring Joust-A-Bout ride was struck several times, damaging the ride’s computer control systems. Jackson Township has had a long history with parachutes and was home to the world's first parachute jump tower. 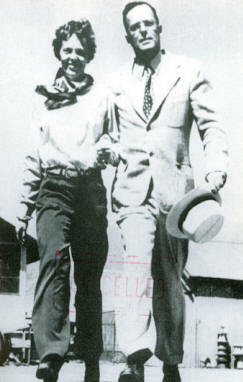 In 1907, Stanley Switlik emigrated from Poland and arrived at Ellis Island as a 16 year old "steerage" passenger. 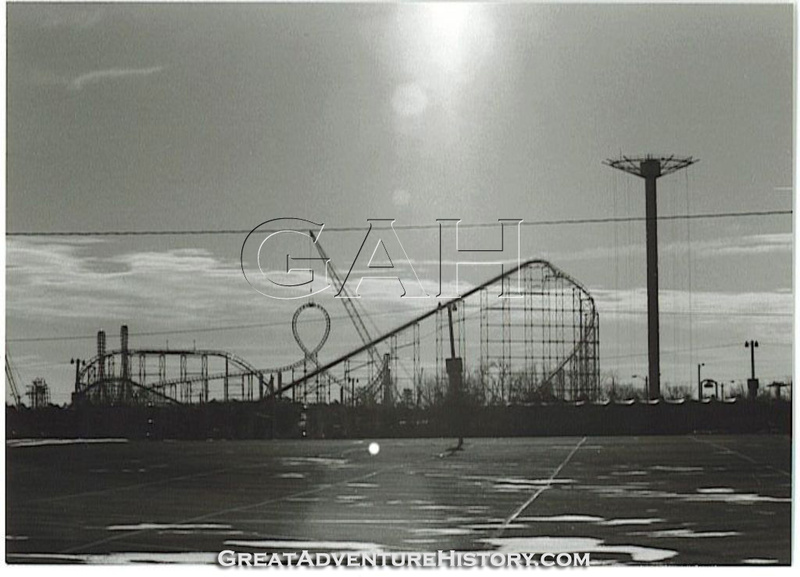 While working at a variety of jobs from house painting to selling insurance and real estate, he found a small canvas and leather manufacturing company, and, in September of 1920, agreed to purchase it. 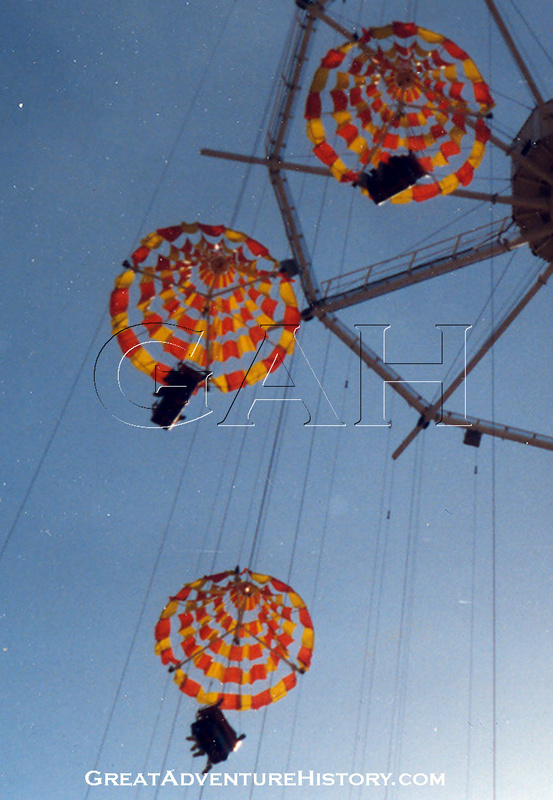 The Canvas-Leather Speciality Company was incorporated October 9, 1920, with his friends and relatives among the stockholders. 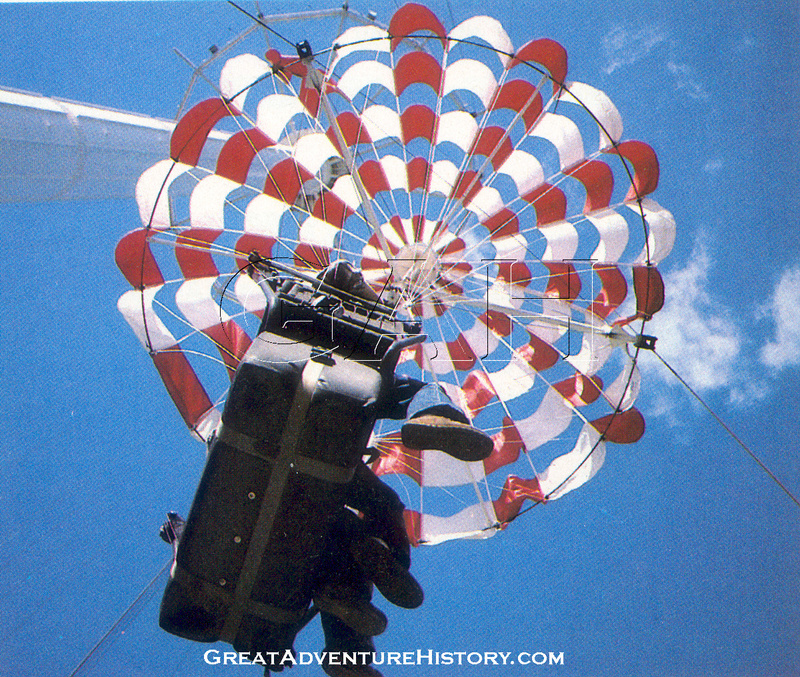 The first products included collapsible hampers, golf bags, coal bags, pork roll casings, and one which would foretell a future in government contracting-leather mail bags manufactured for the United States Post Office Department. As "barn-storming" pilots of the day excited the public's imagination, the company began manufacturing pilot and gunner belts, designing flight clothing, and experimenting with parachutes. In the 1930's, with a new name, Switlik Parachute & Equipment Company became the largest manufacturer of parachutes in the country. 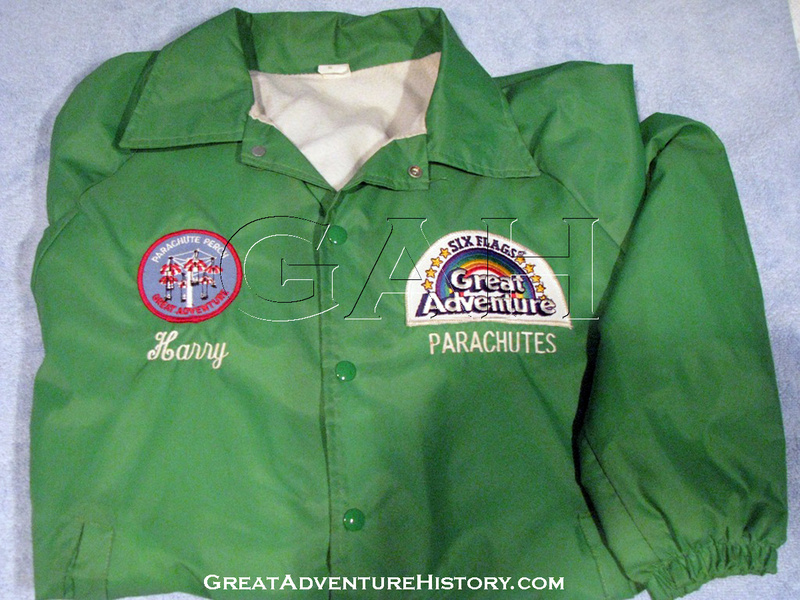 Friends with many of aviation's pioneers, Stanley outfitted the expeditions and record attempts of Amelia Earhart, Wiley Post, and Admiral Richard Byrd. In 1934, Stanley Switlik and George Palmer Putnam, Amelia Earhart's husband, formed a joint venture and built a 115 foot tall tower on Stanley's farm in Ocean County. 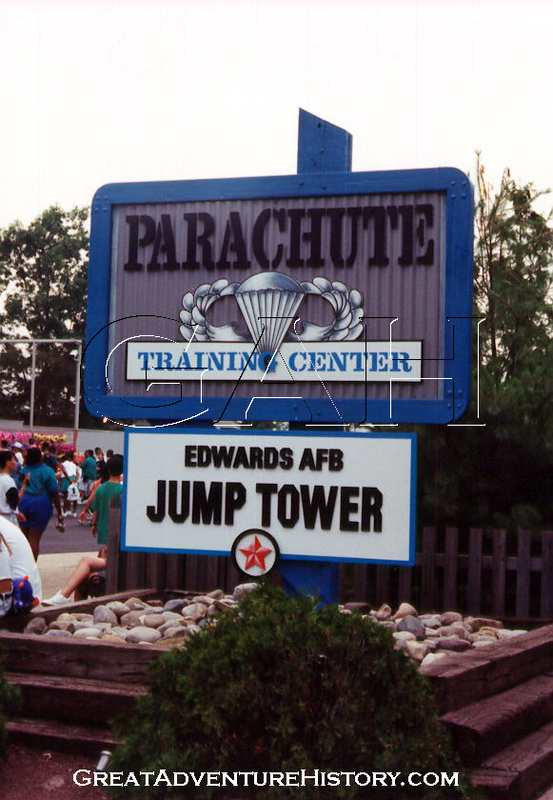 Designed to train airmen in parachute jumping, the first public jump from the tower was made by Ms. Earhart on June 2, 1935. Witnessed by a crowd of reporters and officials from the Army and Navy, she described the descent as "Loads of Fun!" 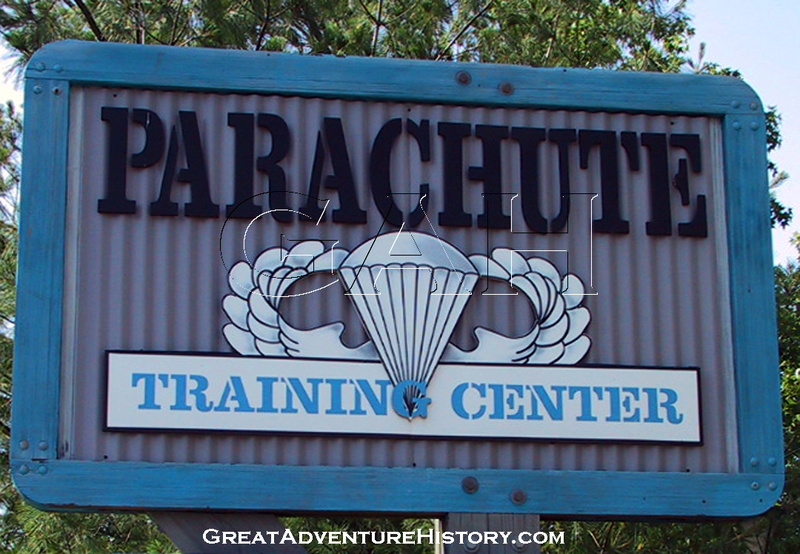 As war clouds grew, the firm received its present name, Switlik Parachute Company, Inc. and became a part of the "Arsenal of Democracy." 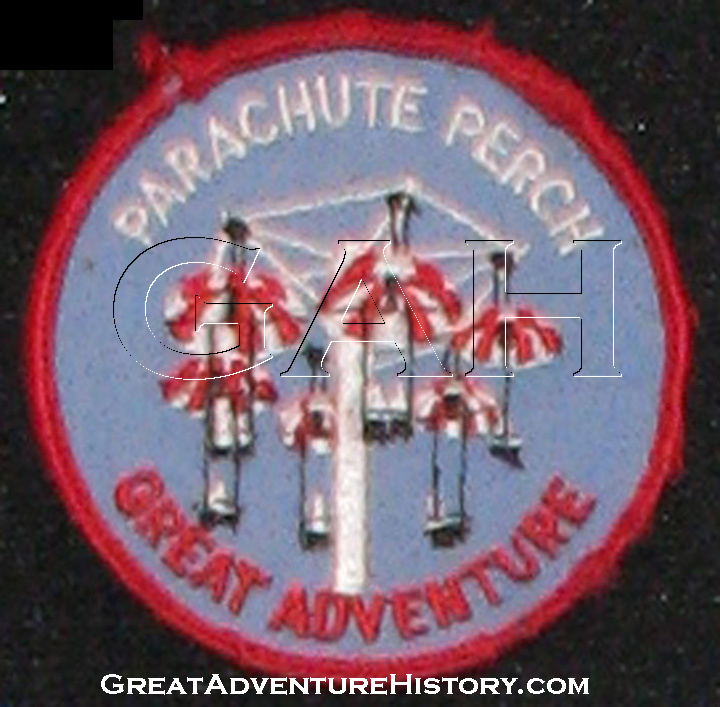 In December of 1941, a small nucleus of parachute manufacturers were called to a meeting and ordered by the Government to increase production 50-fold. Additional space was acquired and a large work force trained. The company's productivity was so impressive that the War Department gave it the first of five Army-Navy "E" Awards in 1942. 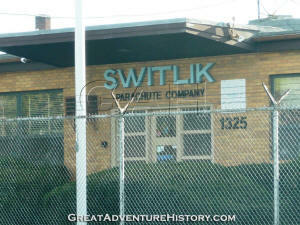 Today, the Switlik company still makes a variety of life saving equipment for aviation including life vests and rafts. 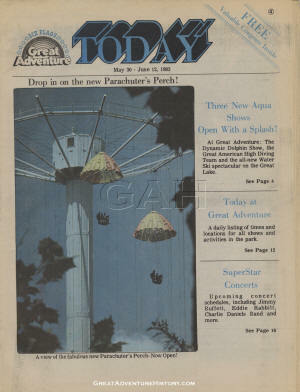 Stanley Switlik and his wife Wanda owned a large tract of land complete with beautiful unspoiled woods, picturesque lakes and gentle rolling hills. 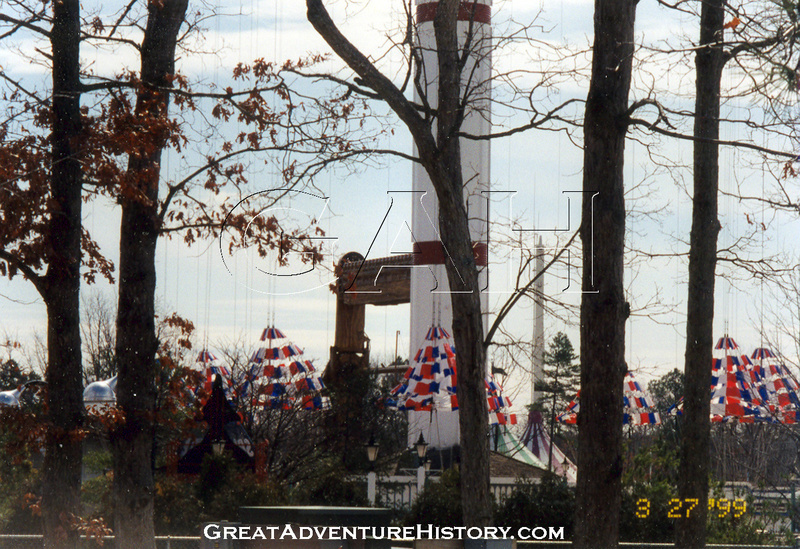 Their home was located on this property, and parts of the land were used as a Girl Scout camp known as "Camp Wanda", which was named for Wanda Switlik. 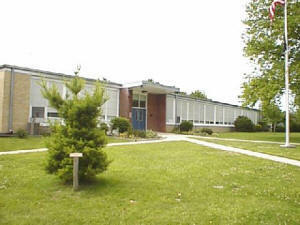 The Switlik's donated money in Jackson Township, and the Stanley Switlik Elementary School was built in 1948 from money provided by the Switliks. The large tract of land was ideally located in the center of the state of New Jersey, almost exactly halfway between New York City and Philadelphia which was why along with the natural beauty of the property it was chosen by Warner LeRoy and Hardwicke Company to become the home of Great Adventure. 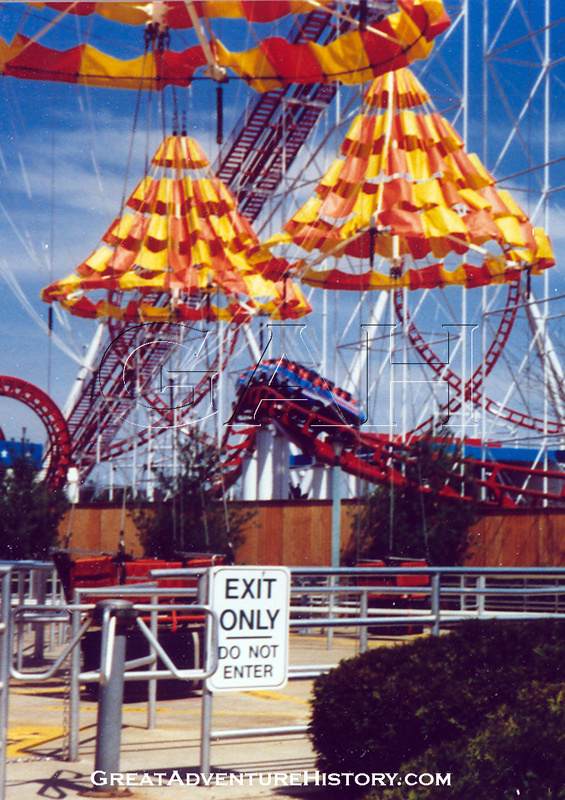 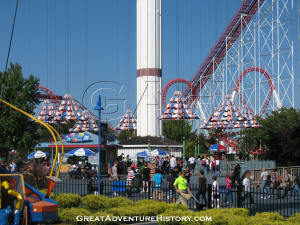 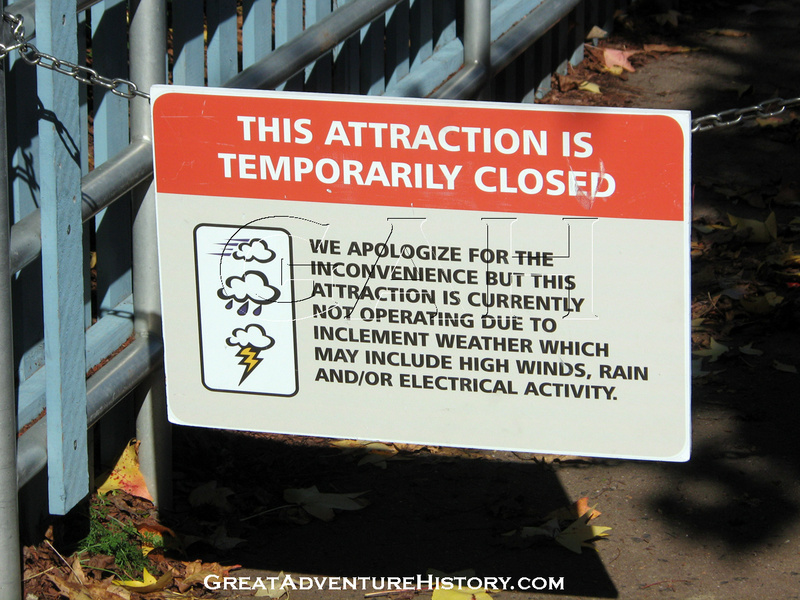 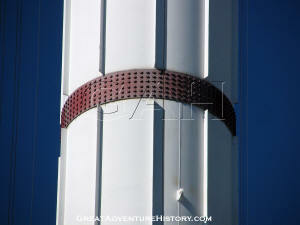 Originally painted completely white, the ride was repainted in the 1990s with bands of red around the bolt rings. 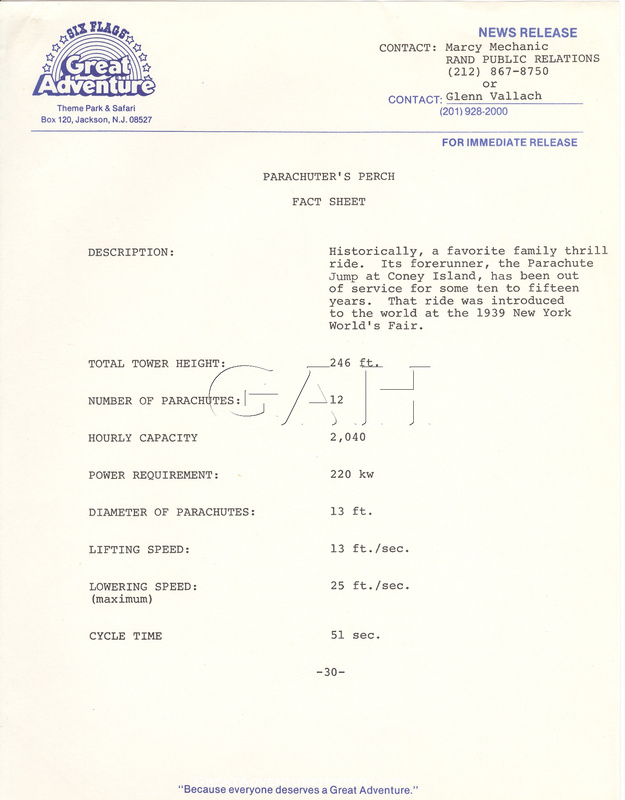 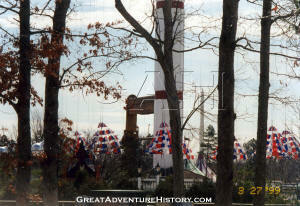 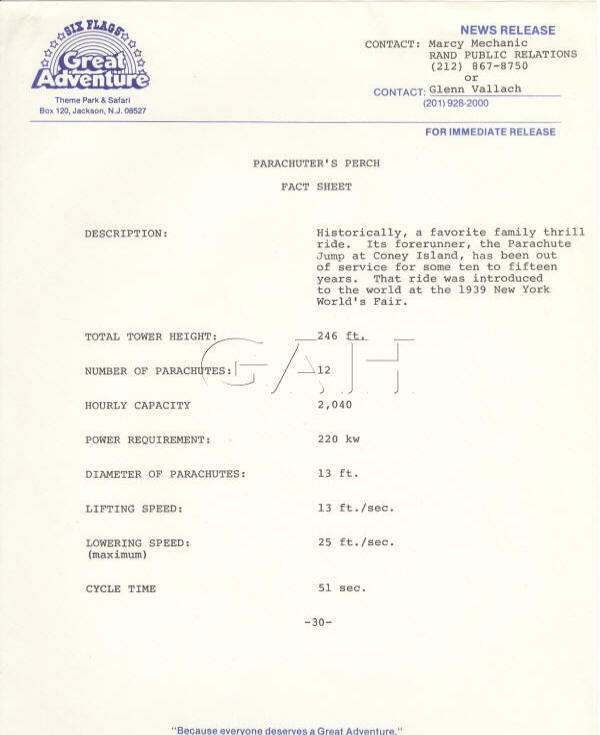 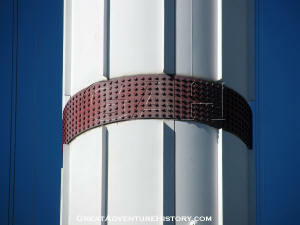 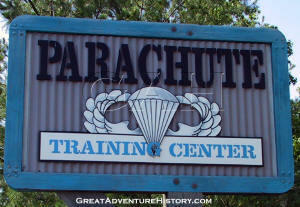 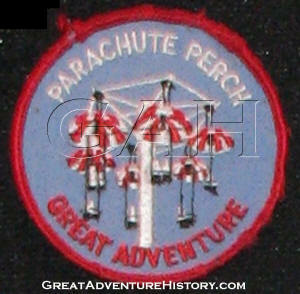 This along with the red white and blue parachutes which replaced the original orange and yellow parachutes helped contribute to the ride’s theme change as it became the “Edwards Airforce Base Jump Tower Parachute Training Center” to fit the new theme given to section of the park when the Right Stuff Mach 1 Adventure was added and military base theme was given to all the rides at the top of the Boardwalk area. 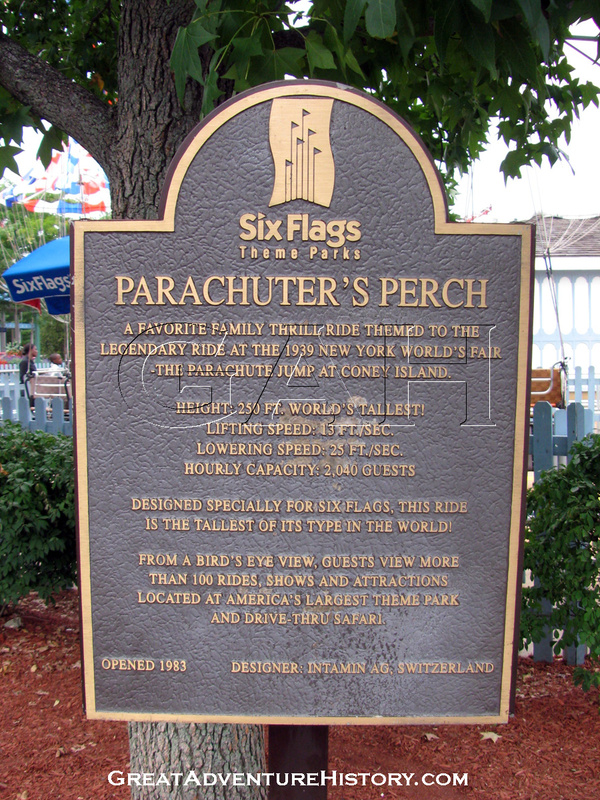 With the addition of bigger, newer and faster rides in the 25 seasons since the Parachuter’s Perch was introduced, the ride has transitioned from being a thrill ride into a family ride, delighting a wide range of guests. 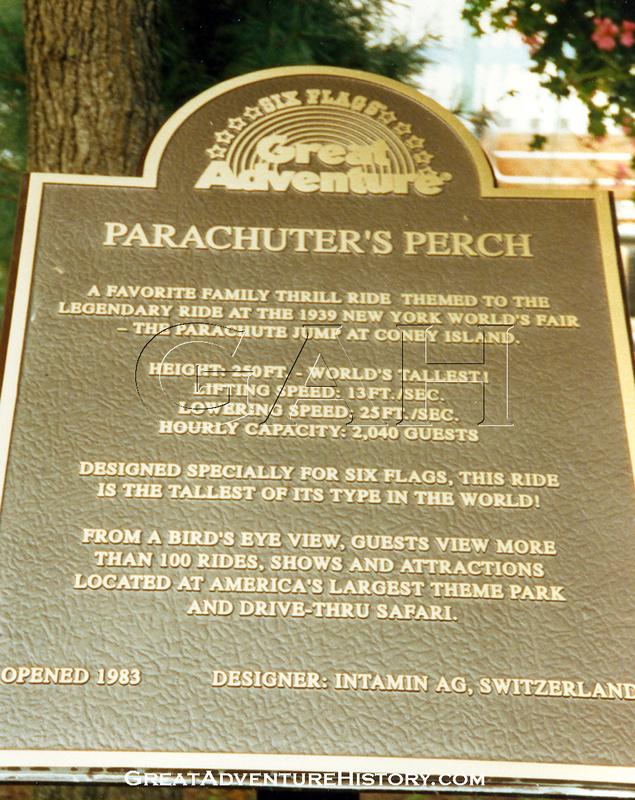 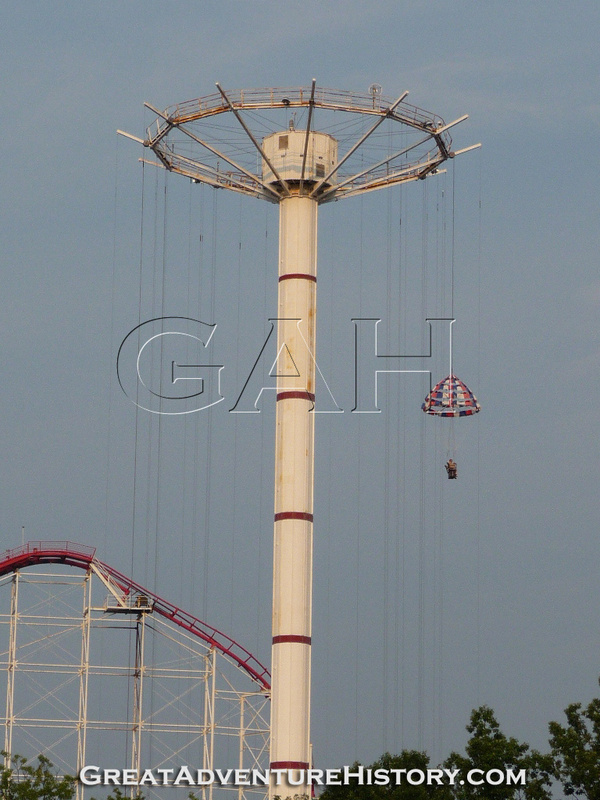 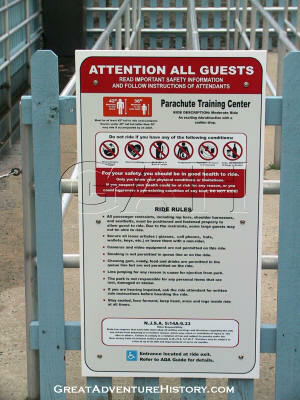 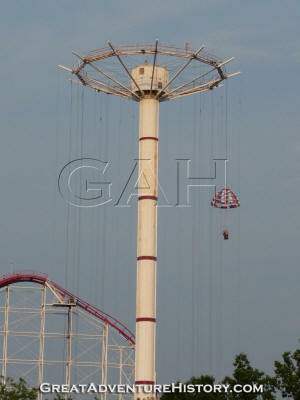 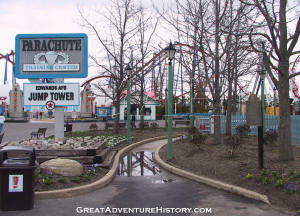 Other parks have begun removing their own parachute rides in the years that have followed, with the Texas Chute Out at Six Flags Over Texas and Great Adventure’s ride being the only two remaining in the United States. 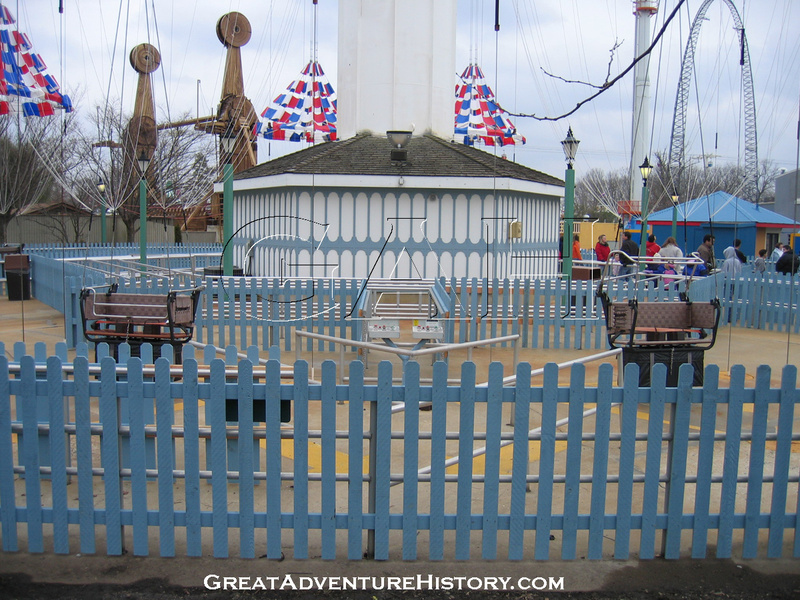 The ride is starting to show its age with time, requiring a fresh coat of paint.